In terms of construction, the secondary school, displays a radical new innovation. 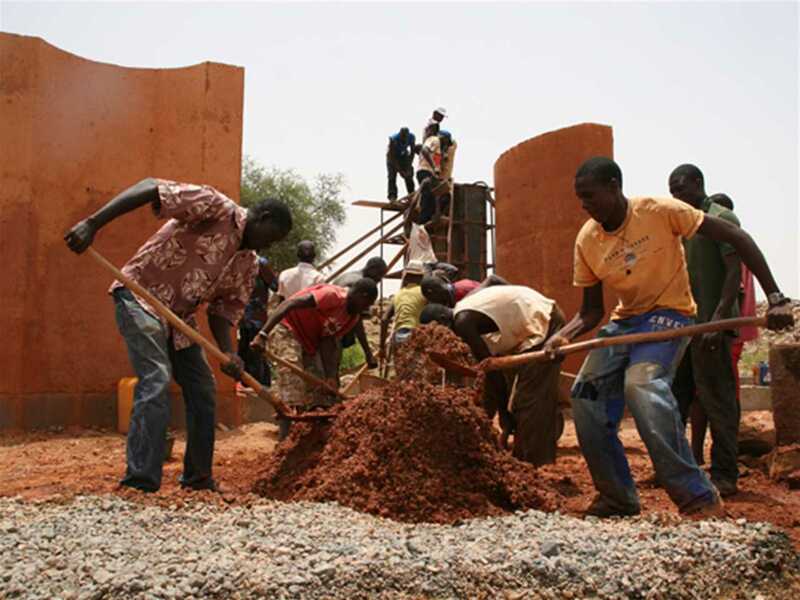 Clay is no longer made into individual bricks: instead, the walls of the secondary school are made by pouring the mixture of clay, gravel, and cement into a mold, producing larger sections. 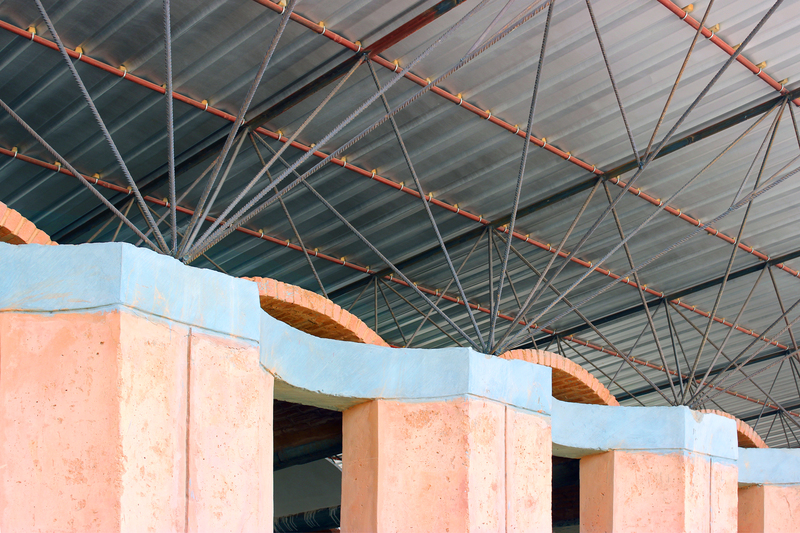 The corrugated tin roof, which is raised above the clay ceiling, is heated by the sun. 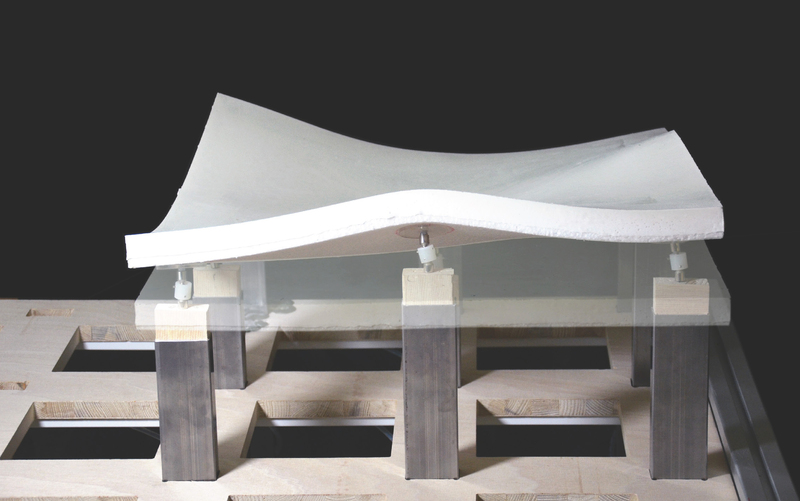 Air between the ceiling and roof heats up and rises, drawing cool air from below and creating a current. 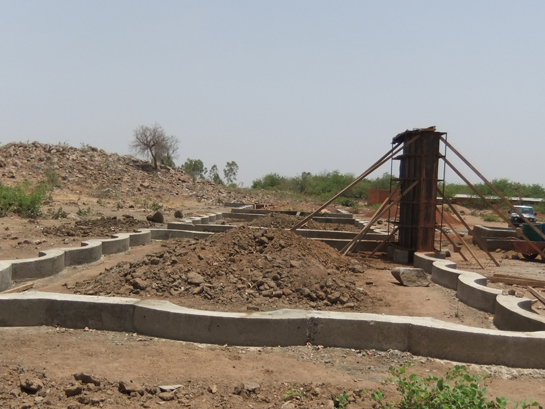 Construction of the two new school buildings is complete – with interior fit-out including windows, doors and floors to follow. 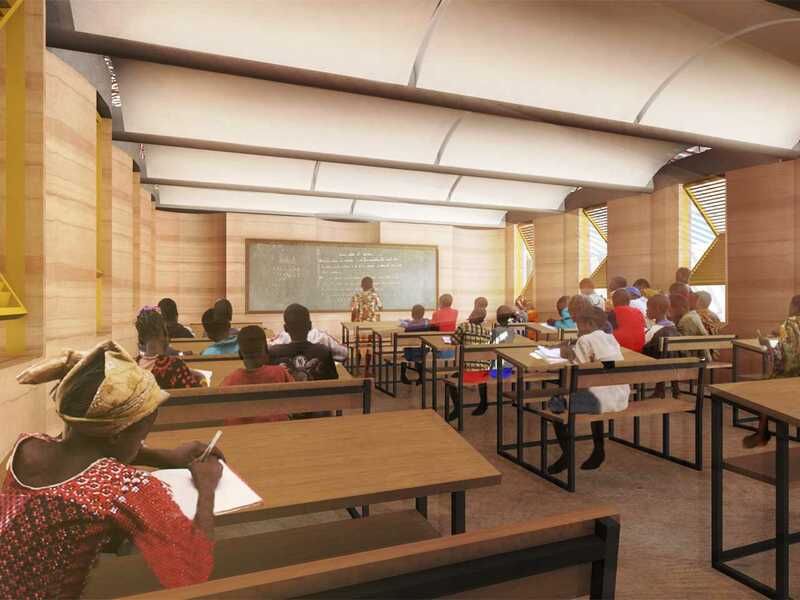 The classrooms are already occupied by students eager to make the most of the opportunity. 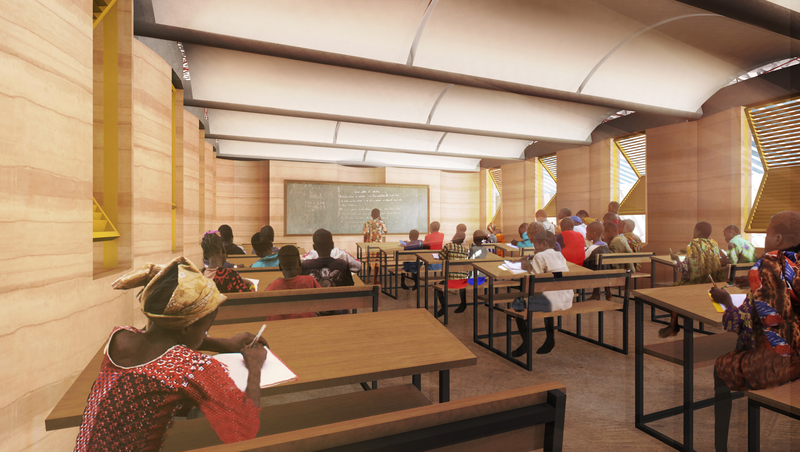 The classrooms are protected from the heat by the thick clay ceiling, and hot air inside can rise through slits in the ceiling. “Buildings that breathe” work with the climate rather than against it. 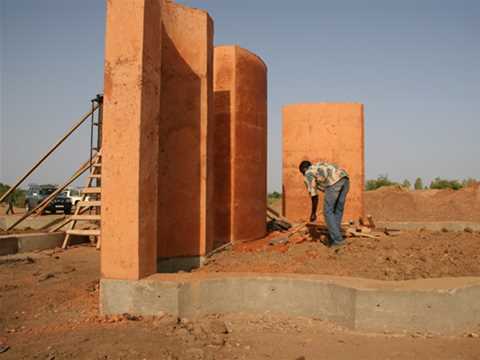 Construction is progressing using larger clay elements cast in place instead of bricks for the walls, using similar materials but with the addition of gravel. The formwork is filled with cement-stabilized reinforced cast earth and stripped of the formwork the following day. 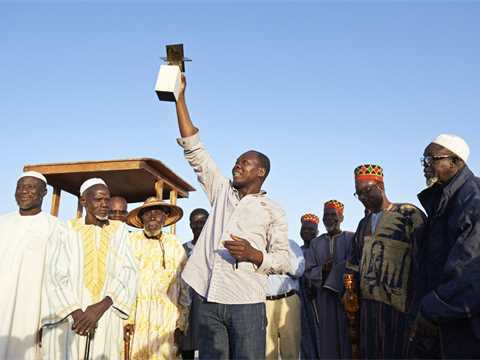 Project author Francis Kéré presents the Global Holcim Awards Gold 2012 trophy to more than 3,000 people from the Gando community and neighboring villages who came to welcome him home. 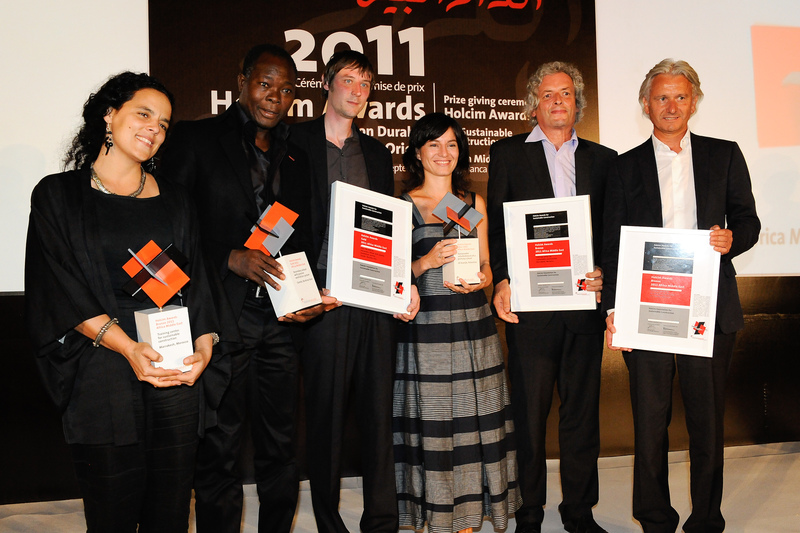 Presentation of the Global Holcim Awards Gold 2012 for “Secondary school with passive ventilation system”, Gando, Burkina Faso (l-r): Enrique Norten, Principal and Founder of TEN Arquitectos, and head of the Global Holcim Awards jury congratulates main author of the winning project, Francis Kéré, and members of his team, David Jun, Ines Bergdolt, and Hanna Kümmerle. 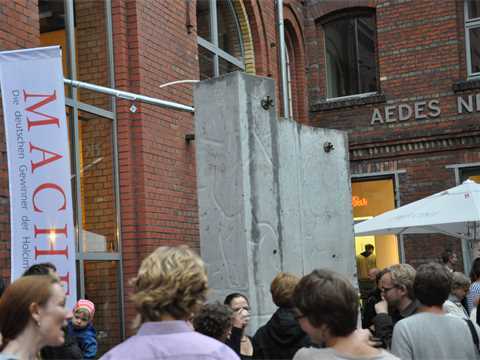 The wall elements contain of earth blend, sand, gravel and cement. 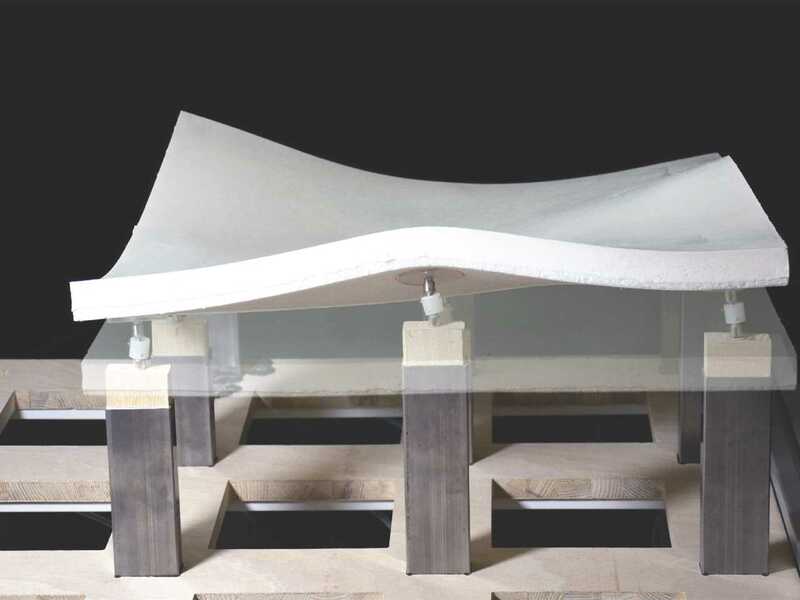 The ring beams and the carrier beams are reinforced and hold the roof construction and the vaults. 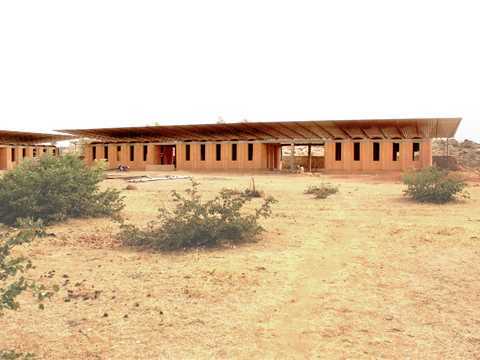 The secondary school in Gando village, Burkina Faso uses traditional building materials and technologies and places great emphasis on actively involving the local population in the construction process. Locally-sourced clay is mixed with aggregates and cement to cast walls on-site based on a two-piece formwork. 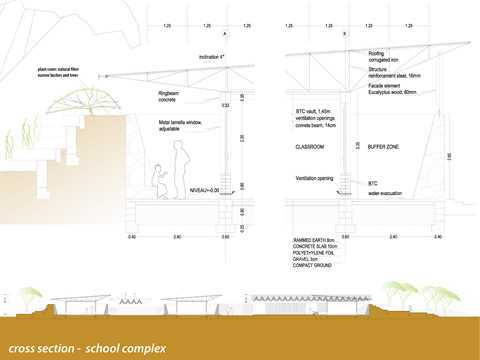 The school is exemplary in terms of its successful approach to the adaptive use of building materials, community development, climatic mitigation and aesthetics. 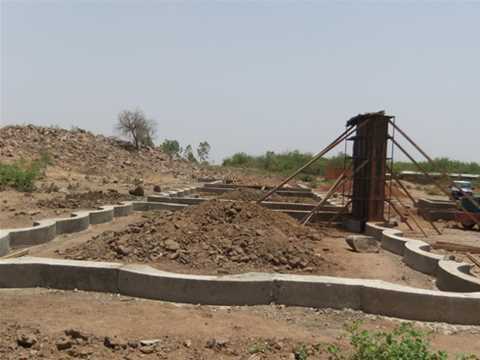 Despite the oppressive heat, the temperature inside his school classrooms cannot be controlled by closing spaces and cooling with modern air-conditioners: electricity is expensive and long-term maintenance unavailable. 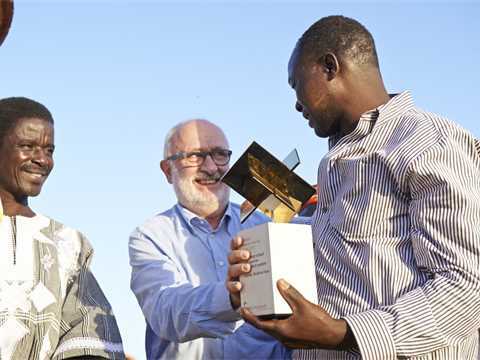 Anne Lacaton called for “creative economy and poetic pragmatism” when building infrastructure in sub-Saharan Africa. Mariam Kamara co-led a reinterpretation project where traditional local construction techniques were used for a new mosque and community center in Dandaji, Niger. In less than a month, the 6th International LafargeHolcim Forum for Sustainable Construction will take place in Egypt. 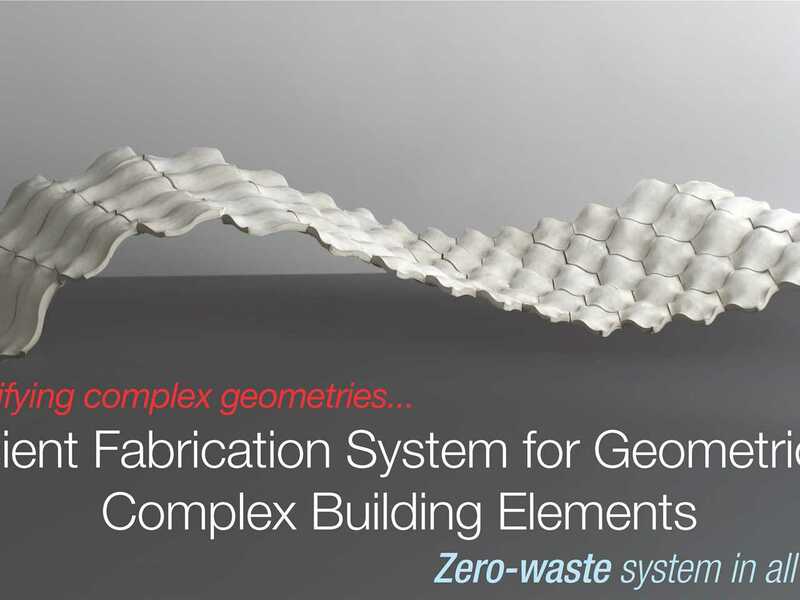 The symposium will focus on strategies to “re-materialize” construction by reducing consumption throughout the material cycle from extraction to processing, transport, installation, maintenance, and removal. 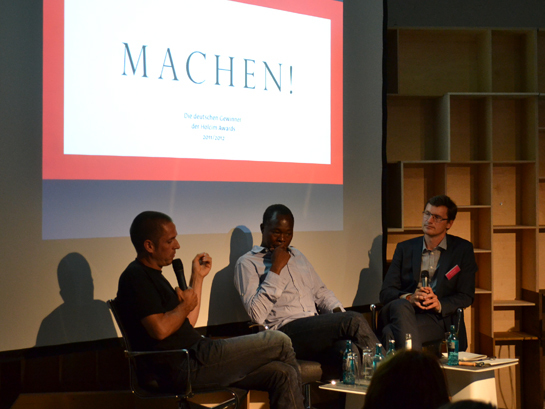 In the context of the lecture series “Affinity Architecture” at the Swiss Federal Institute of Technology (ETH Zurich) a full auditorium of students was inspired by some of the key contributors to the upcoming Forum on “Re-materializing Construction” and their approaches to sustainable design in sub-Saharan Africa. 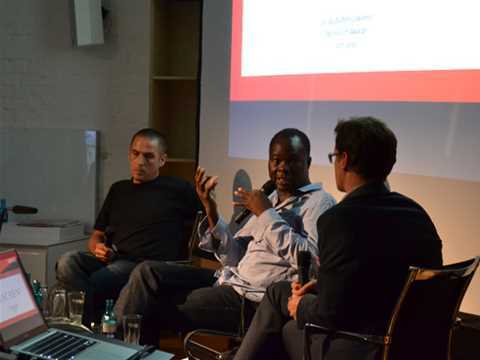 In the context of the lecture series “Affinity Architecture” at the Swiss Federal Institute of Technology (ETH Zurich) a full auditorium of students was inspired by some of the key contributors to the upcoming Forum on “Re-materializing Construction” and their approaches to sustainable design in sub-Saharan Africa. 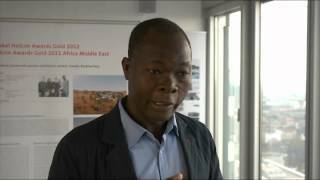 Francis Kéré will be a keynote speaker at the LafargeHolcim Forum. 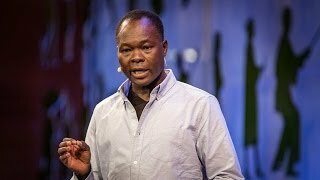 The principal of Kéré Architecture will present his unique blend of architecture that is deeply rooted in his native Burkina Faso, and blends innovation and sustainable techniques with limited resources. 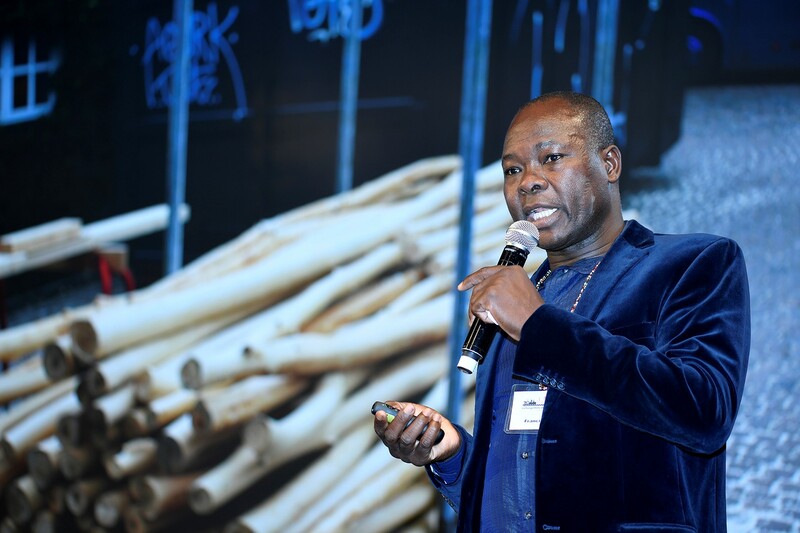 “I learnt how to build with steel and glass in Germany – but in my homeland of Burkina Faso, I learnt how to build with cement-stabilized clay”, Francis Kéré explained. 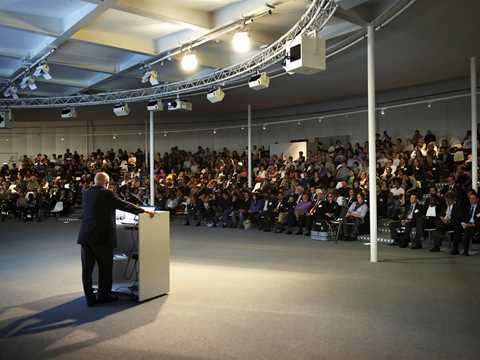 At the ETH Zurich, he presented his Global LafargeHolcim Awards-winning project of 2012, a secondary school in his home town Gando, and illustrated how inexperienced architects are tempted to use contemporary building techniques and materials in developing countries, resulting in unsustainable projects. 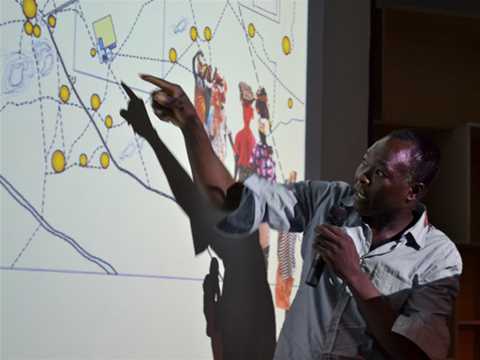 Despite the oppressive heat, the temperature inside his school classrooms cannot be controlled by closing spaces and cooling with modern air-conditioners: electricity is expensive and long-term maintenance unavailable. His solution used locally-sourced clay as the principal building material, combined with a design that incorporates passive ventilation, underground cooling, double-skin roofs, and planting vegetation. 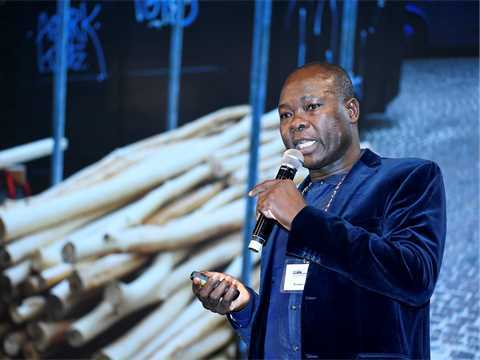 “Combining traditional and contemporary materials and techniques led to affordable and sustainable solutions that are now proven to be successful”, he said. 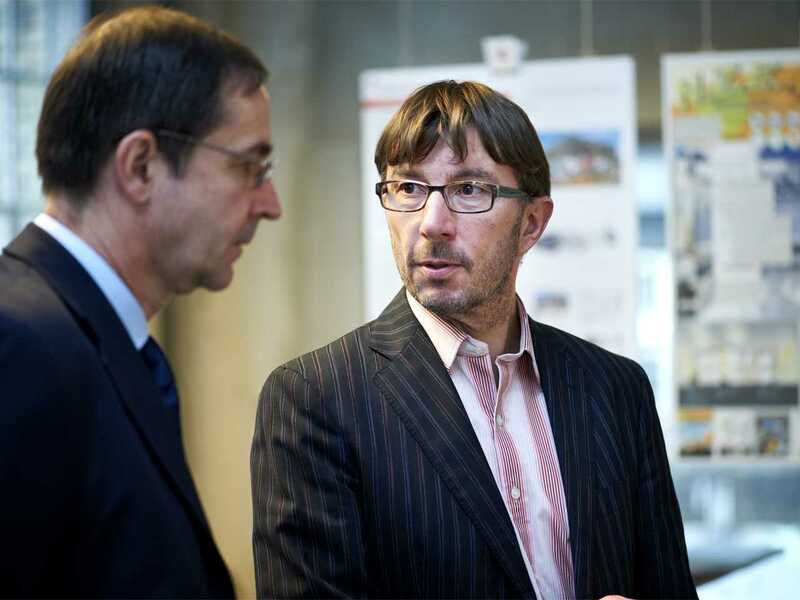 Another Forum keynote speech will be delivered by Anne Lacaton (left), from the award-winning practice Lacaton & Vassal, whose work showcases the importance of building upon existing conditions to create new architecture. 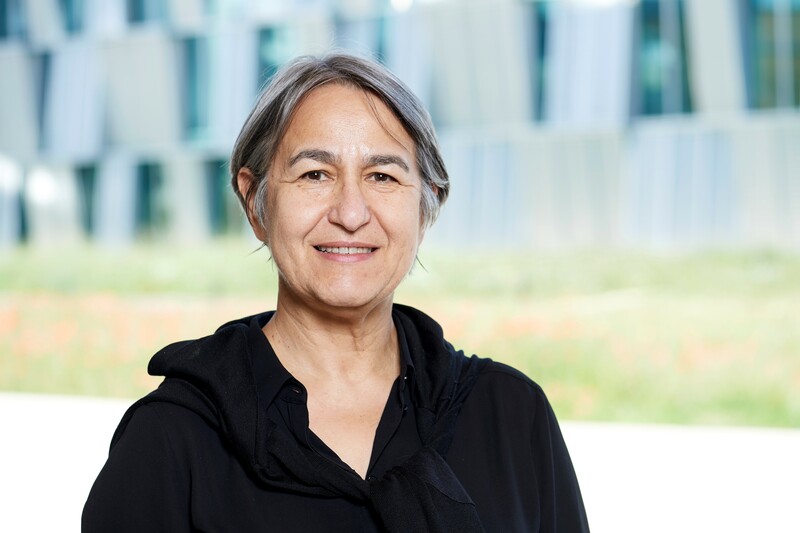 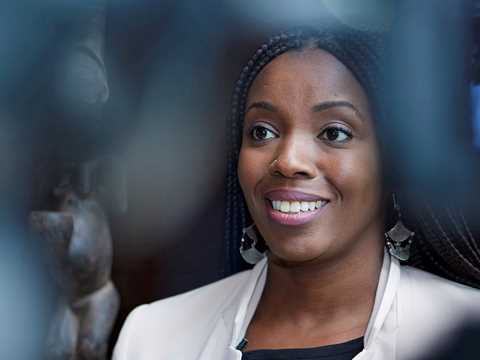 At the ETH Zurich, she called for “creative economy and poetic pragmatism” when building infrastructure in sub-Saharan Africa. 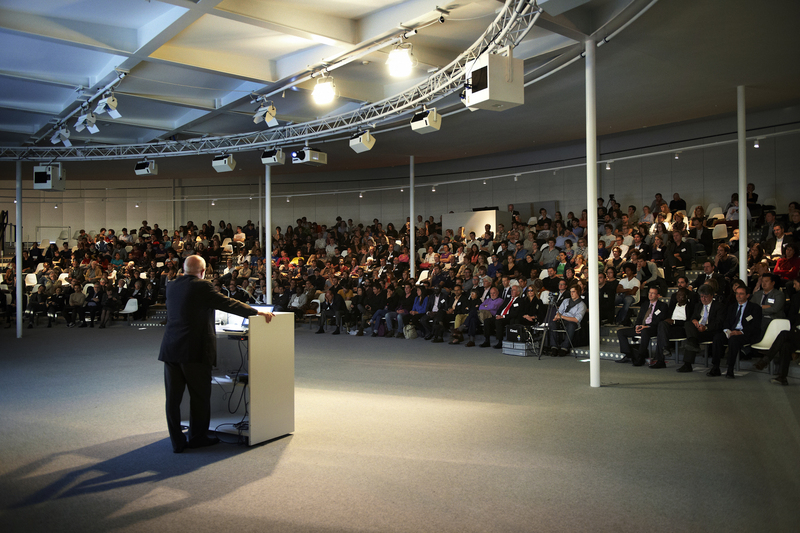 Instead of protecting and fighting against the climate, architects must understand to live with the given. She encouraged the students to carefully observe, and to consider “temporary being a strategy”. 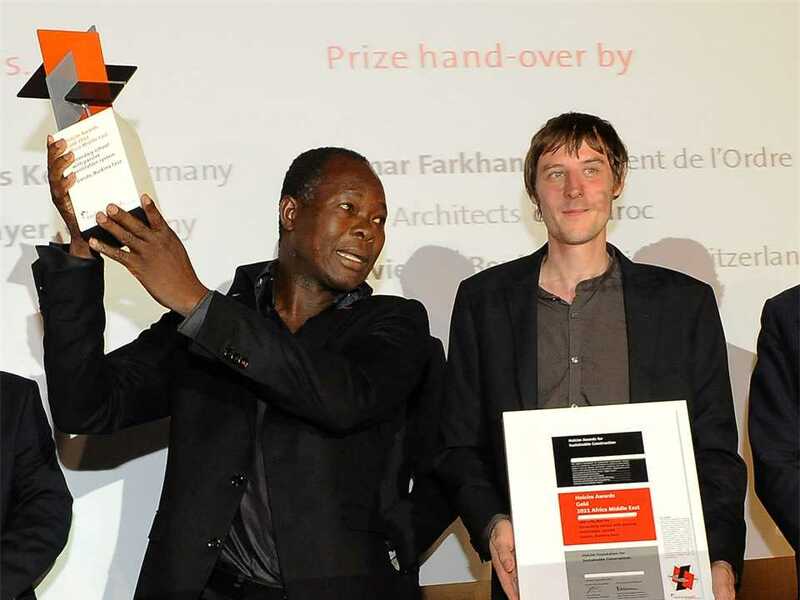 Global LafargeHolcim Awards winner from 2018, Mariam Kamara (below, left), presented her work as part of the “Affinity Architecture” lecture series. 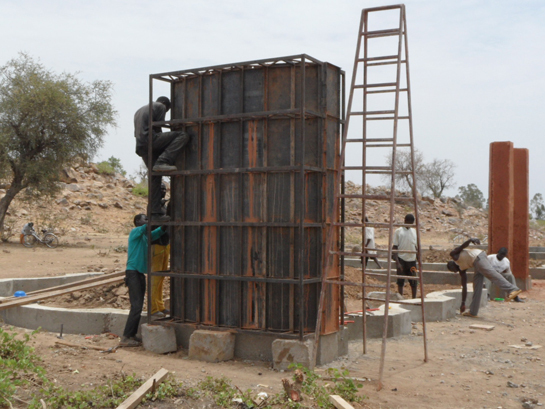 She co-led a reinterpretation project where traditional local construction techniques were used for a new mosque and community center in Dandaji, Niger – where involving the local artisans, masons, and the community led to a knowledge transfer beneficial to all. 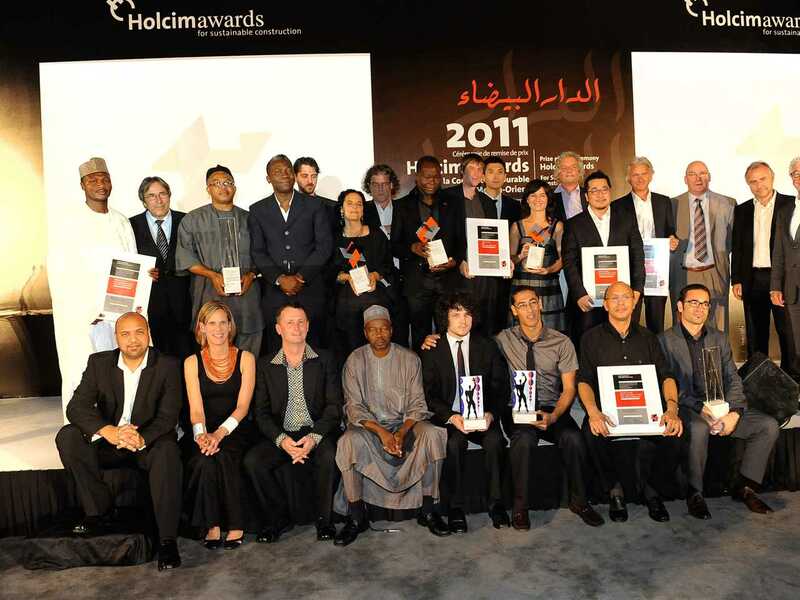 In addition, the involvement guaranteed pride and acceptance of modern architecture and new materials. 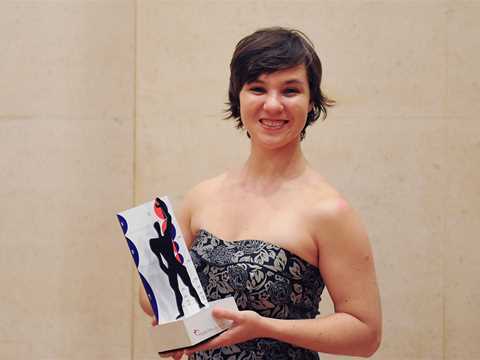 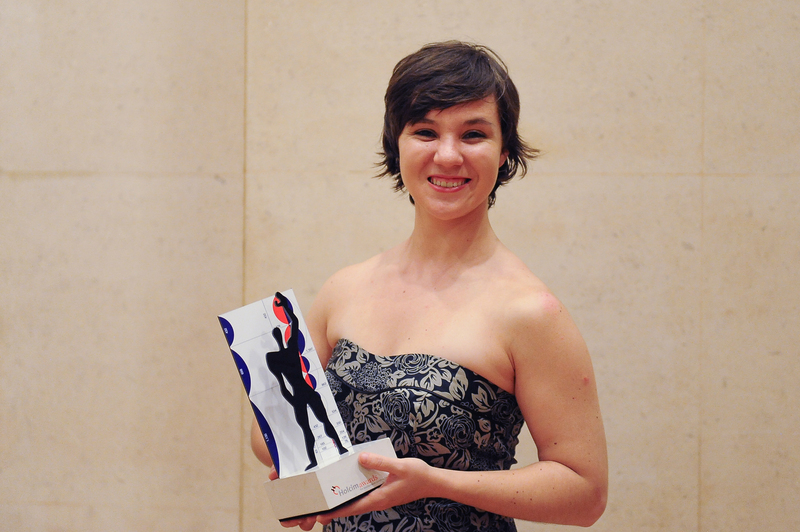 Her project, winning a Global LafargeHolcim Award, is an example of this reciprocal learning. 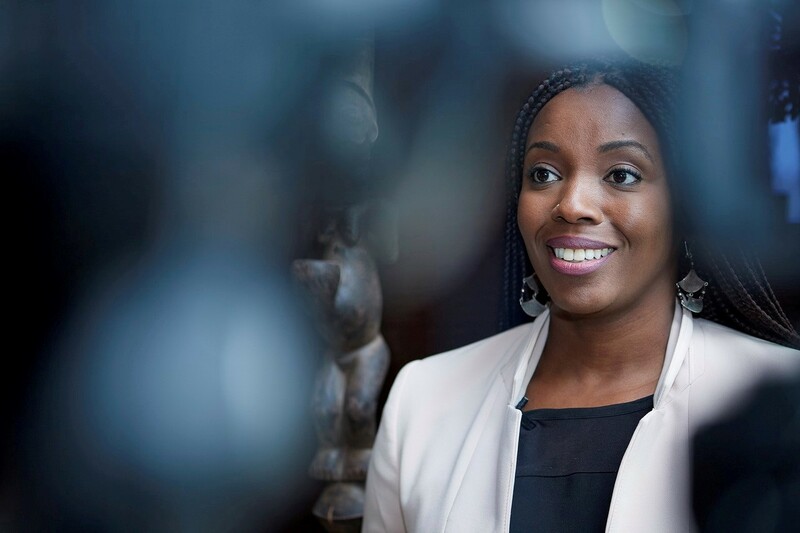 “By understanding the needs of the community, in this case for public space, we created not only a place to meet, but also a local economy”, said Mariam Kamara, pointing at a farmer’s day market that now uses the public space. 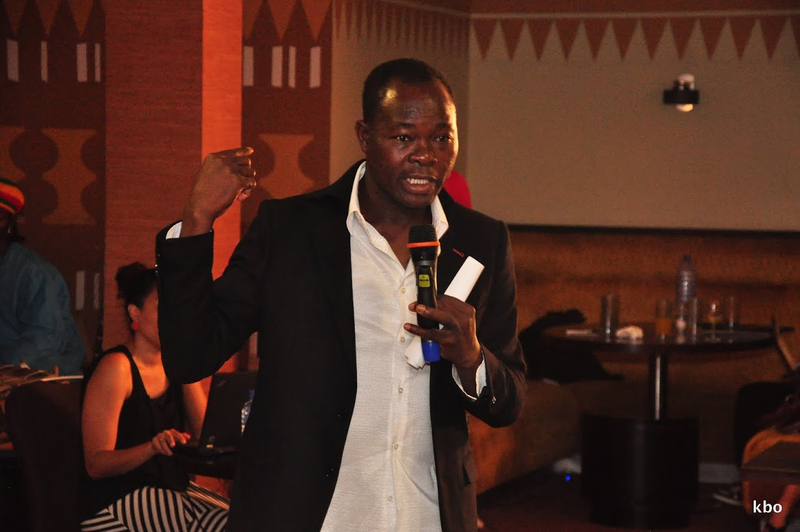 “Involve the community, and let them work together. 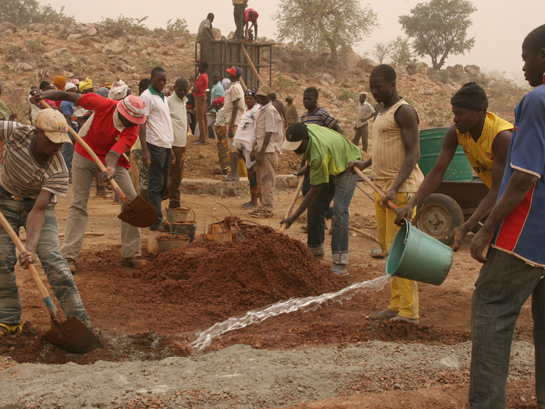 By helping build new infrastructure, they earn a living. 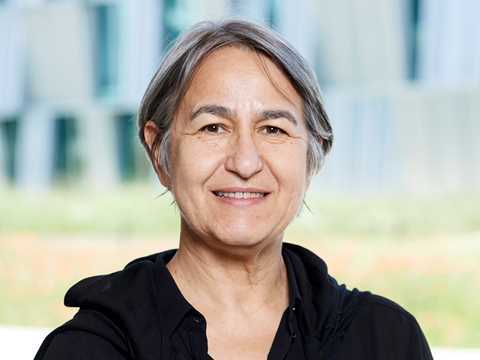 And this creates a sense of pride and ownership, enabling long-term and sustainable development of regions affected by migration into cities”, she noted. Professor of Architecture & Design, Marc Angélil, moderated the ETH Zurich event and will also moderate the LafargeHolcim Forum in Cairo. 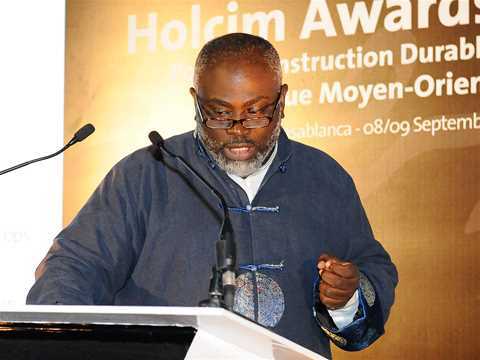 He took up the lessons by Francis Kéré, Mariam Kamara, and Anne Lacaton and pointed at the vast potential of sustainable construction in Africa: The creation of rural urban cities to prevent people moving into megacities, the economic potential when local communities and craftsmen are involvement in building, and the environmental benefits of combining traditional and contemporary knowledge with materials new and old. 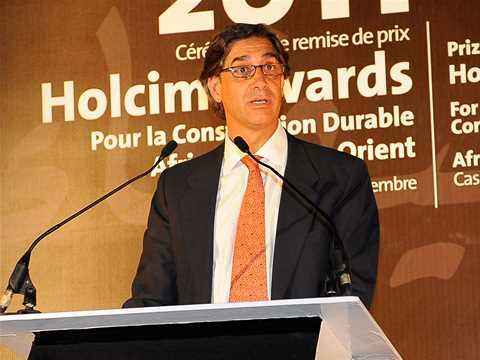 The 6th International LafargeHolcim Forum for Sustainable Construction will be hosted by the American University in Cairo, Egypt, and take place from April 4 to 6, 2019. Some 350 people from more than 50 countries will participate in the 6th International LafargeHolcim Forum. 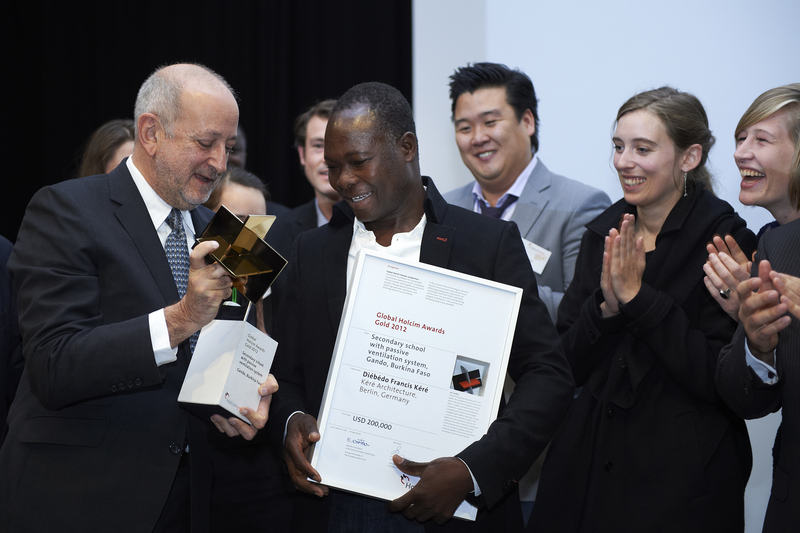 The Building Better Recognition Middle East Africa 2017 was presented by José Cantillana (left), Area Manager LafargeHolcim for East and South Africa to Francis Kéré, Principal of Kéré Architecture, Burkina Faso/Germany for his school building in Burkina Faso, which won the Global LafargeHolcim Award Gold in 2012. 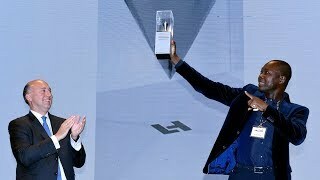 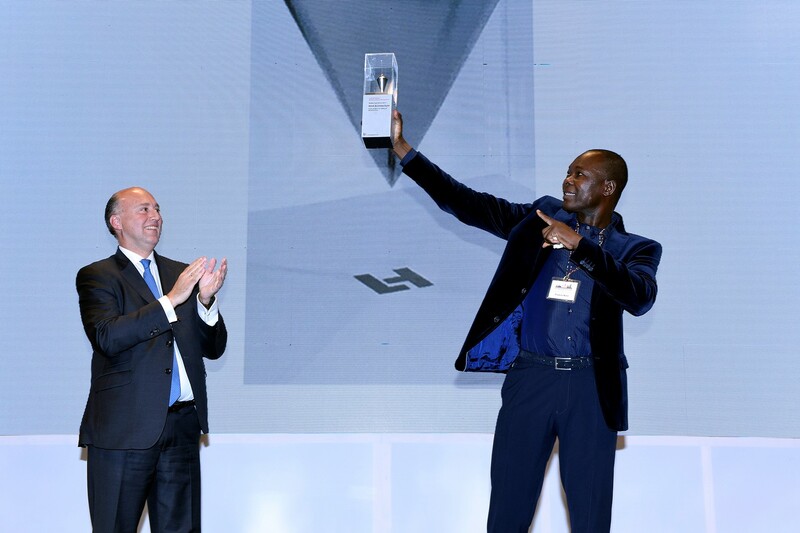 In his motivating and candid speech at the Awards ceremony in Nairobi, Francis Kéré affirmed that sustainable construction requires an attitude that goes well beyond design and makes a difference for future generations. 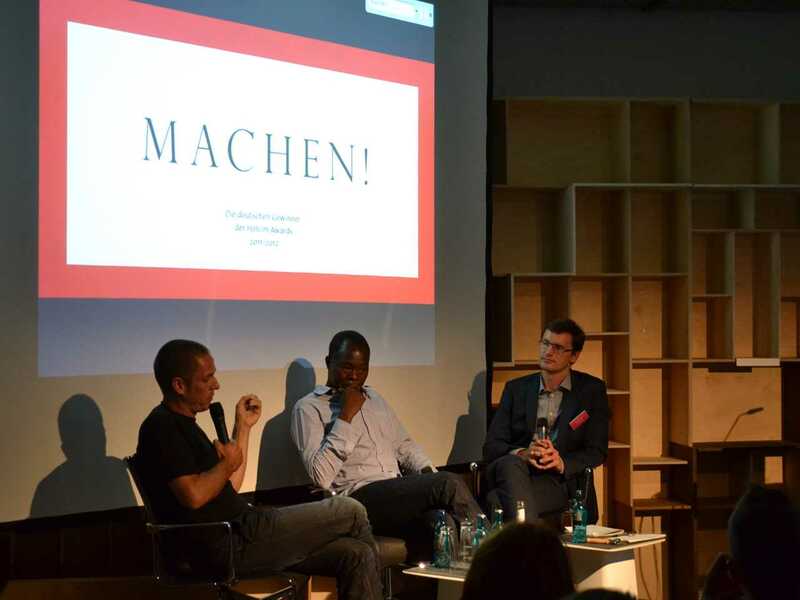 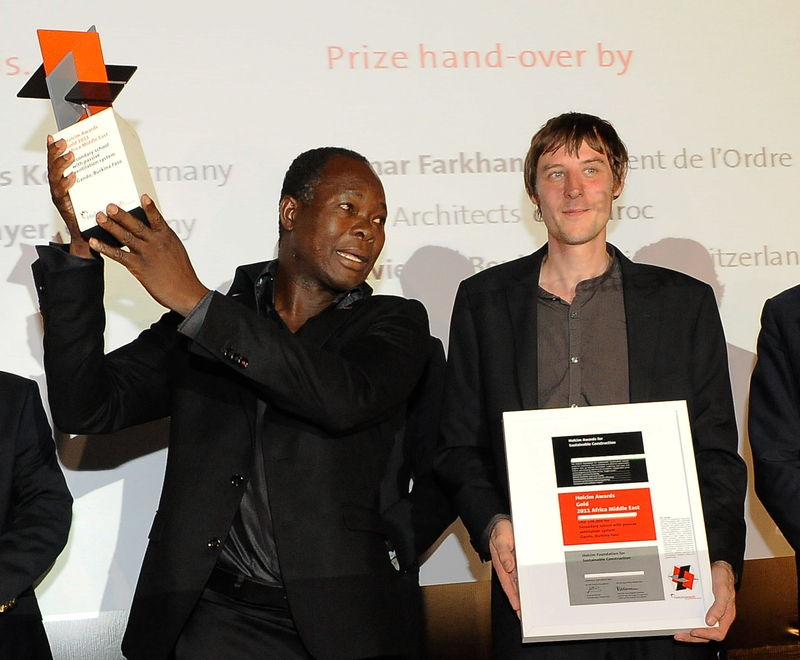 The first LafargeHolcim Building Better Recognition was presented to Francis Kéré (right) of Kéré Architecture, Berlin. 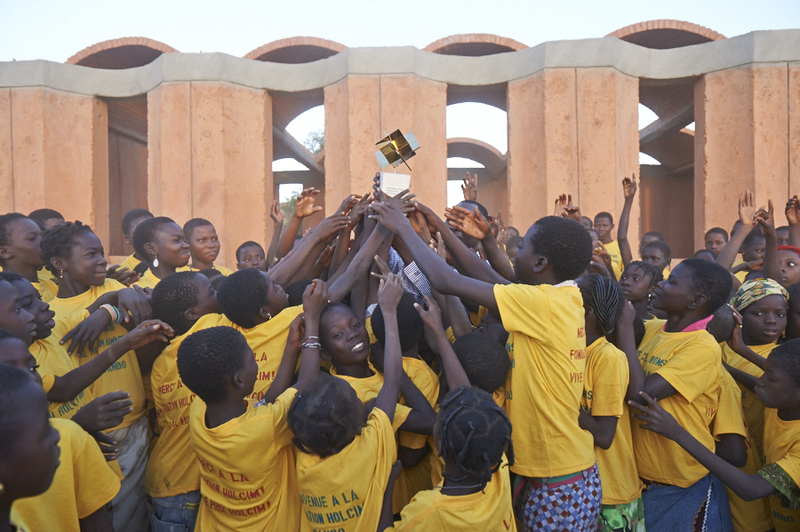 His Secondary school in Gando, Burkina Faso won the Global LafargeHolcim Awards Gold 2012. 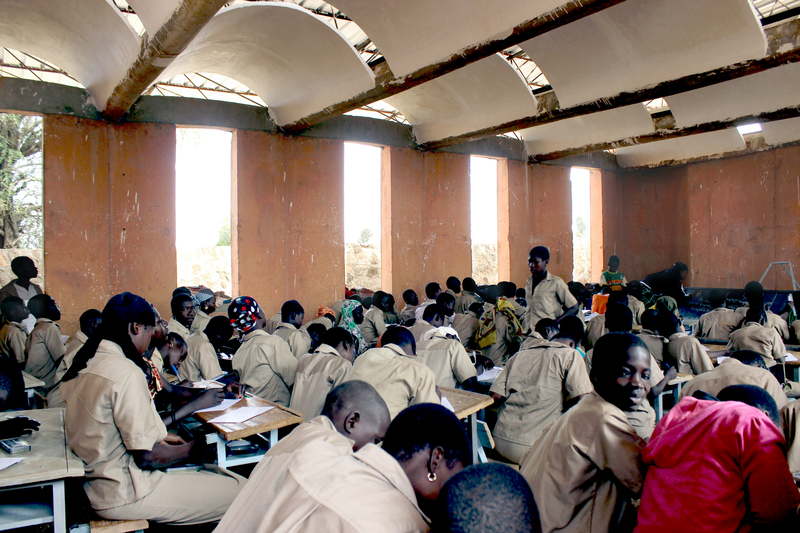 Today, the school is reality for hundreds of children and stands the test of time. Many of the projects that receive a prize in the LafargeHolcim Awards competition ultimately end up being constructed or produced – over half of the prize-winning projects from the four previous competition cycles have been or will be built in the near future. This fact is underscored by the LafargeHolcim Building Better Recognition, which is being awarded for the first time in 2017. 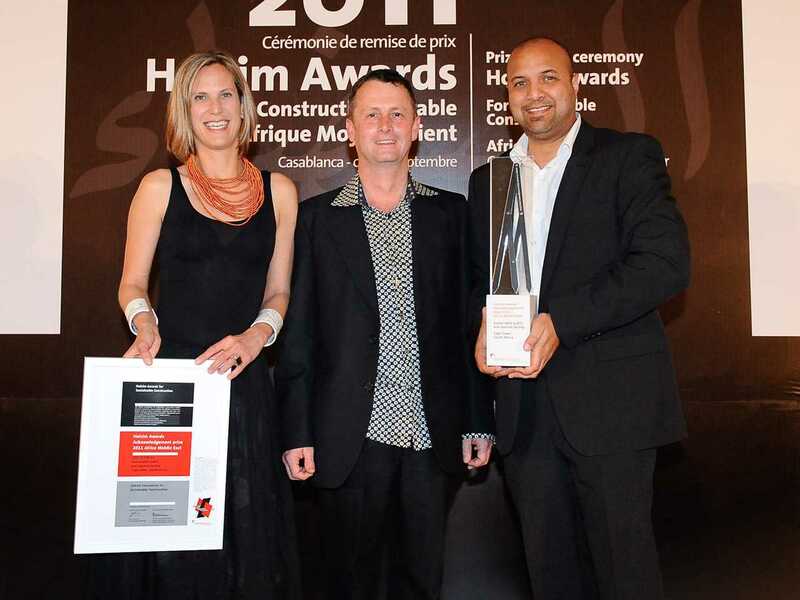 The Building Better Recognition honors a prize-winning project from a previous competition cycle that is a particularly successful example of sustainable construction, has been built and delivers ongoing and tangible benefits to the community. In Middle East Africa, this accolade went to Francis Kéré from Kéré Architecture based in Berlin, Germany for his school building in Burkina Faso, which won the Global LafargeHolcim Award Gold in 2012. The jury was impressed by the project’s “beauty and innovative architectural concept and example for new sustainable construction from a materials and technology perspective.” Today, the secondary school is reality for hundreds of children and standing the test of time. 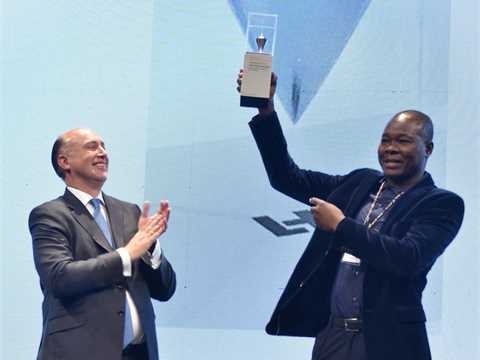 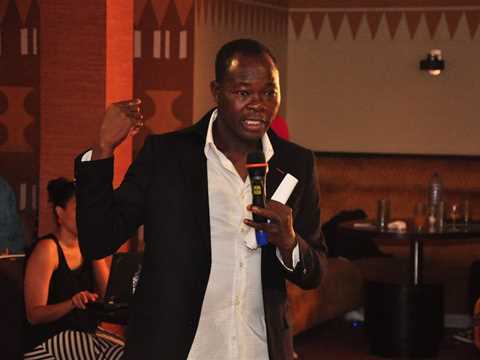 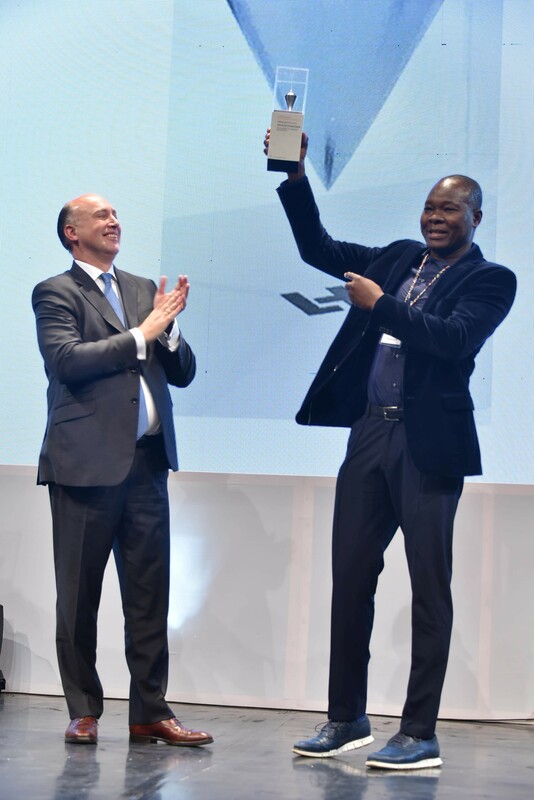 In his motivating and candid keynote speech at the Awards ceremony in Nairobi, Francis Kéré affirmed that sustainable construction requires an attitude that goes well beyond design and makes a difference for future generations. Local clay is mixed with aggregates and cement to cast walls on-site based on a two-piece formwork. The project provides more than just a testament to the potential of locally-sourced materials. Built by the community, the construction process is considered to be an important part of the transfer of knowledge, whereby locals acquire new building skills that can be reused and taught. 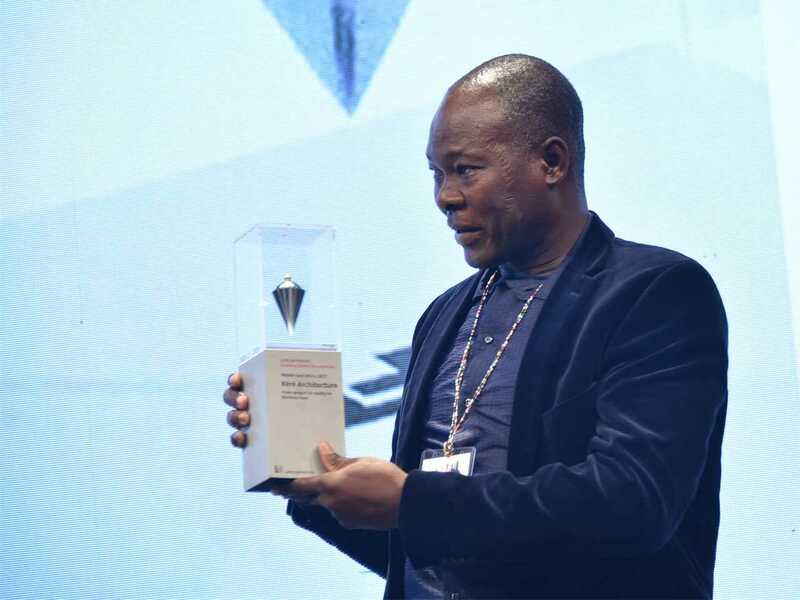 LafargeHolcim Awards Global Gold winner Francis Kéré continues to create work that lives up to the “target issues” of sustainable construction and captures international imagination. His Serpentine Pavilion has opened in London, with a design that reflects on the role of a tree as meeting point in his hometown of Gando in Burkina Faso. Inspired by the tree that serves as a central meeting point for life in his hometown, Francis Kéré has designed a responsive Pavilion that seeks to connect its visitors to nature – and each other. 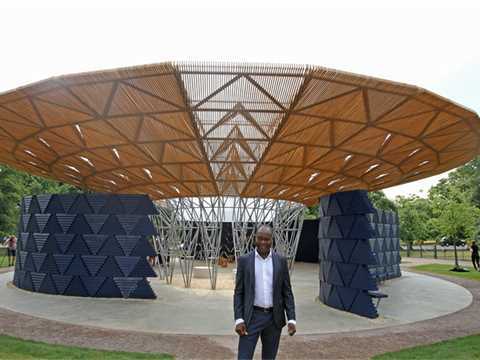 An expansive roof, supported by a central steel framework, mimics a tree’s canopy, allowing air to circulate freely while offering shelter against London summer heat. 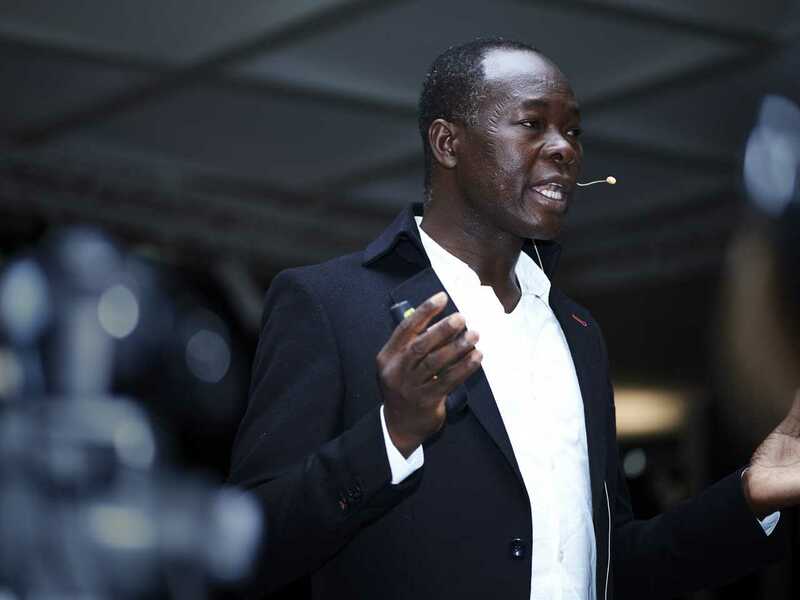 Francis Kéré was chosen by Serpentine Artistic Director Hans-Ulrich Obrist and CEO Yana Peel, along with advisors David Adjaye and Richard Rogers. 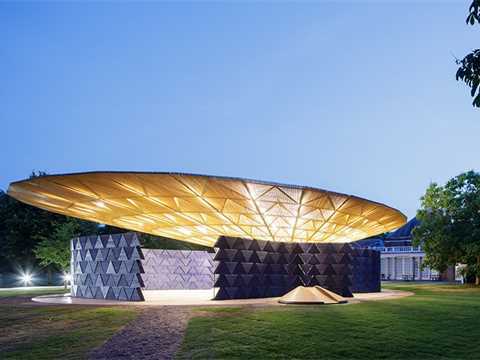 Every year since 2000, the Serpentine Gallery has commissioned a temporary summer pavilion by a leading architect: as a community hub and café during the day, and forum for learning and entertainment at night. 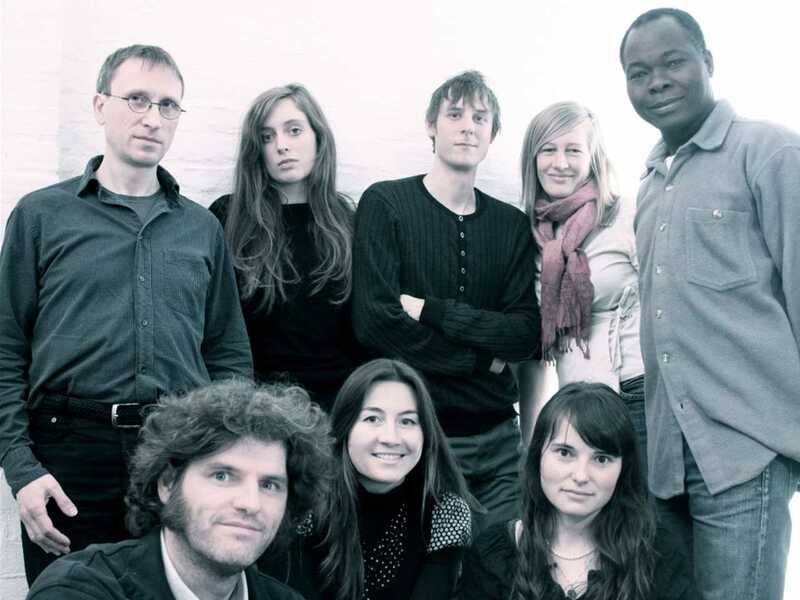 The series presents the work of an international architect or design team who has not completed a building in England at the time of the Gallery’s invitation. 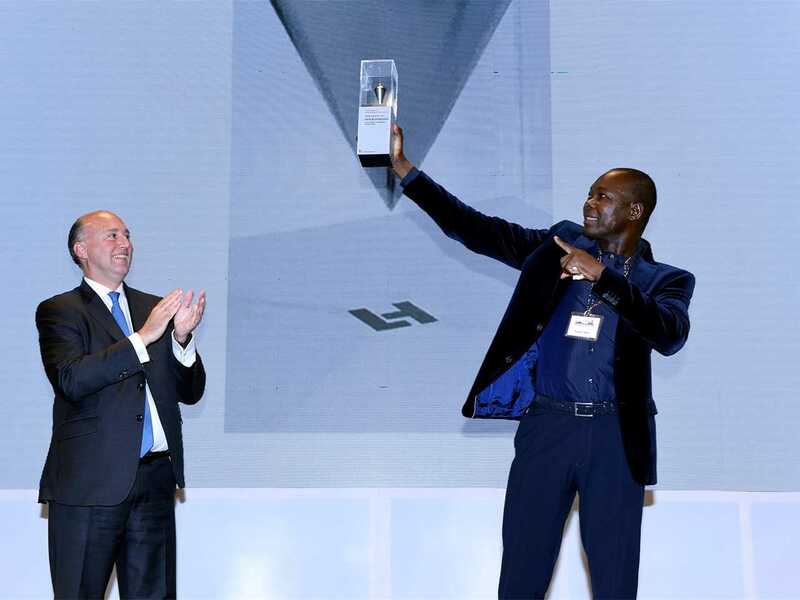 Francis Kéré will deliver a keynote address at the LafargeHolcim Awards ceremony for region Middle East Africa in Nairobi, Kenya in September 2017. To protect the walls from erosion, the school is built on a base of cement-stabilized clay, and a wide overlapping tin roof shields the walls from rain. 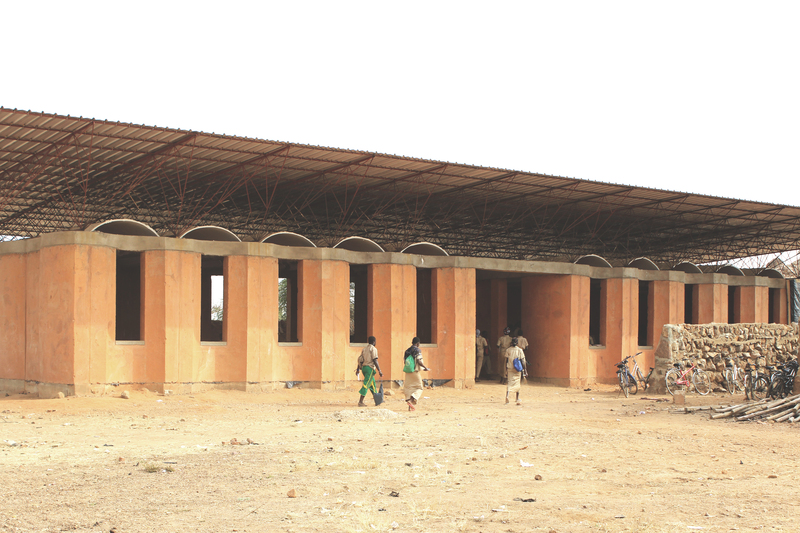 Construction of two new school buildings is now complete – with interior fit-out including windows, doors and floors to follow. 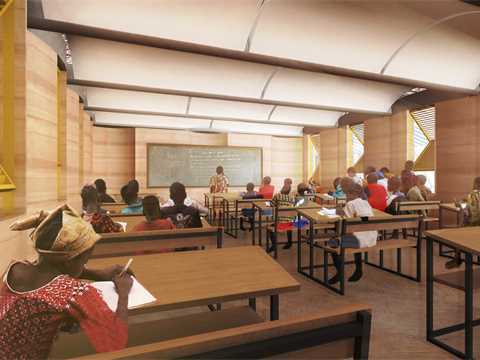 As soon as the first of the planned twelve classrooms were built, they were already in use without waiting for completion of interior fit-out – such is the demand for places in the school by students eager to make the most of the opportunity. 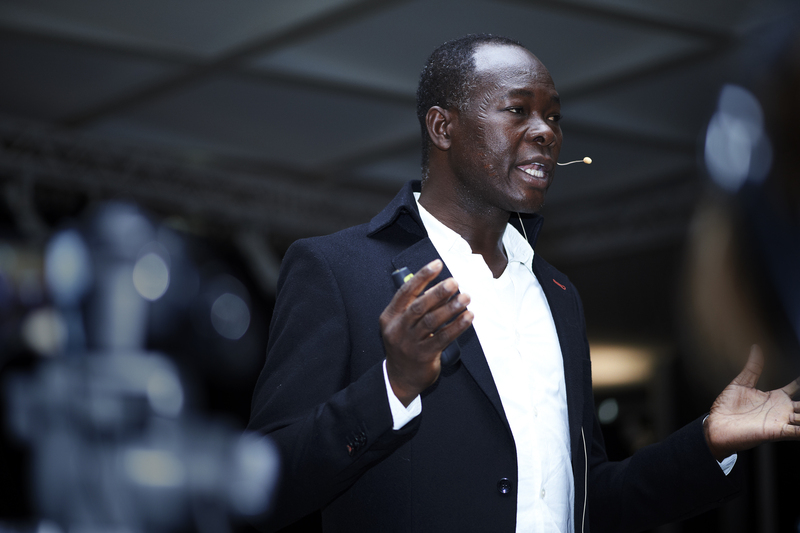 Francis Kéré, originally from the village and now a practicing architect in Berlin, has revived traditional building methods and materials which are combined with contemporary building technologies. The principal building material is clay: which is abundant locally. Construction is carried out entirely by people from the village and is crucial to the sustainability of the project. 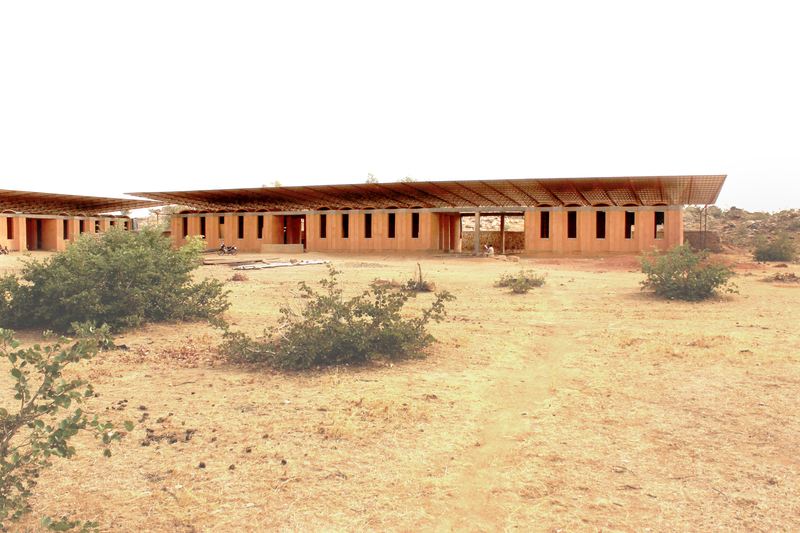 In terms of construction, the secondary school, which is an additional phase of the project, displays a radical new innovation that goes beyond techniques used in Francis Kéré’s earlier projects. Clay is no longer made into individual bricks: instead, the walls of the secondary school are made by pouring the mixture of clay, gravel, and cement into a mold, producing larger sections. In this sense, clay can be cast just like concrete. The clay no longer has to be sifted – it can be used as it is when dug out of the ground, saving time and energy. 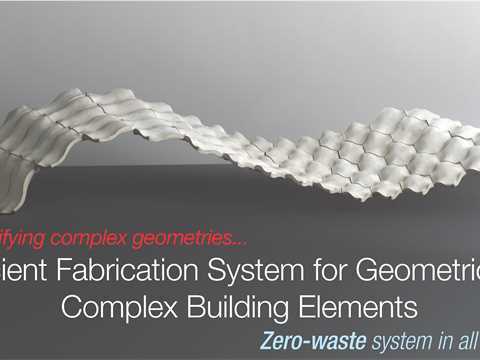 Traditional material can be combined with modern materials and methods to produce a sustainable form of architecture. 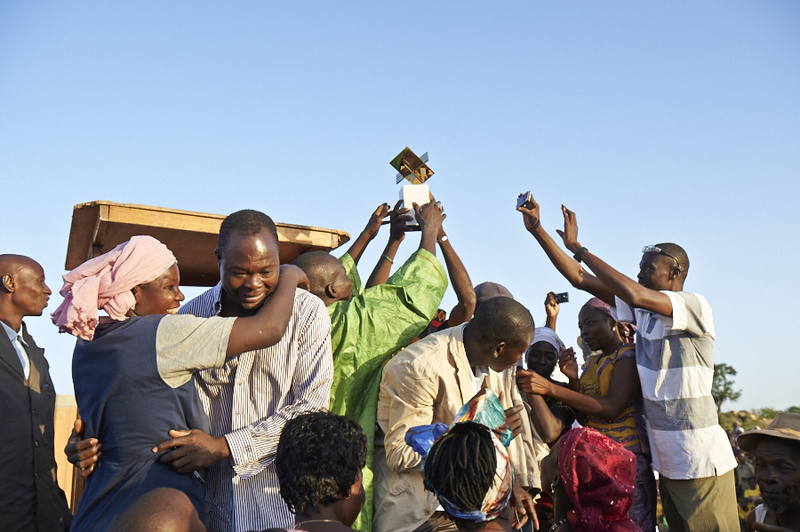 Education is the starting point of development. 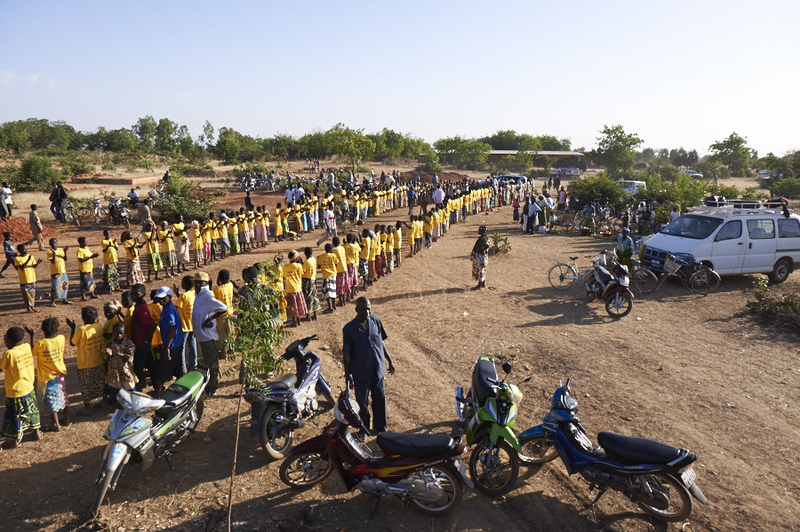 However, in a community such as Gando, it is essential to serve the broader needs of the people. 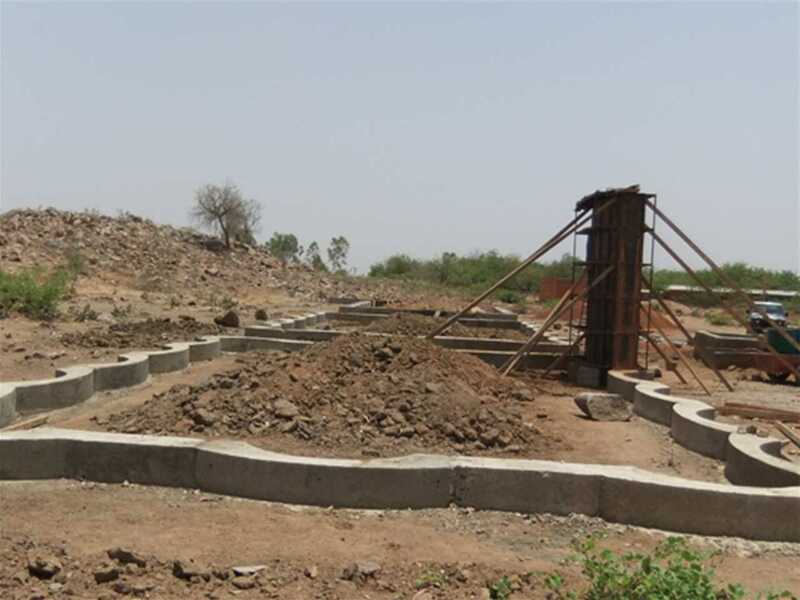 Therefore, complementary projects including a library, women’s center, new wells, a vegetable garden, and a mango tree nursery are being added. 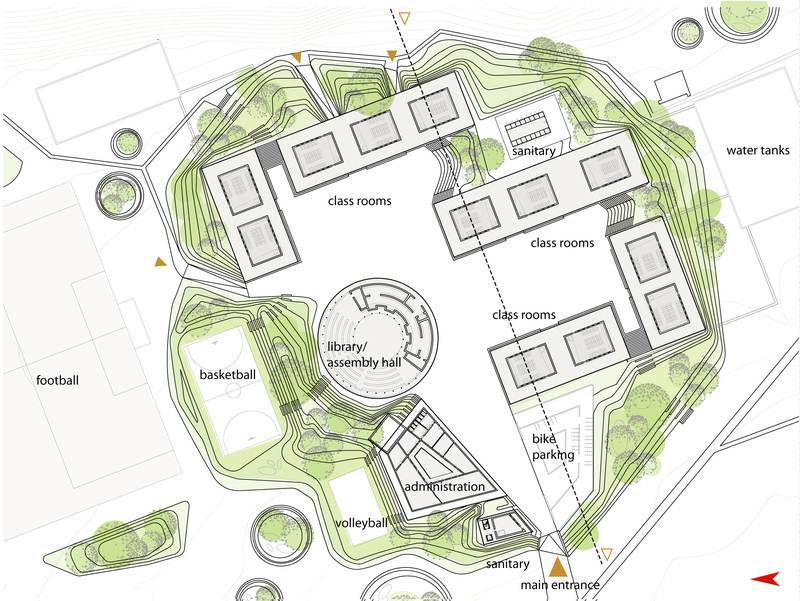 The secondary school complex will eventually consist of twelve classrooms, teachers’ housing, offices, and a circular building (library and meeting hall). 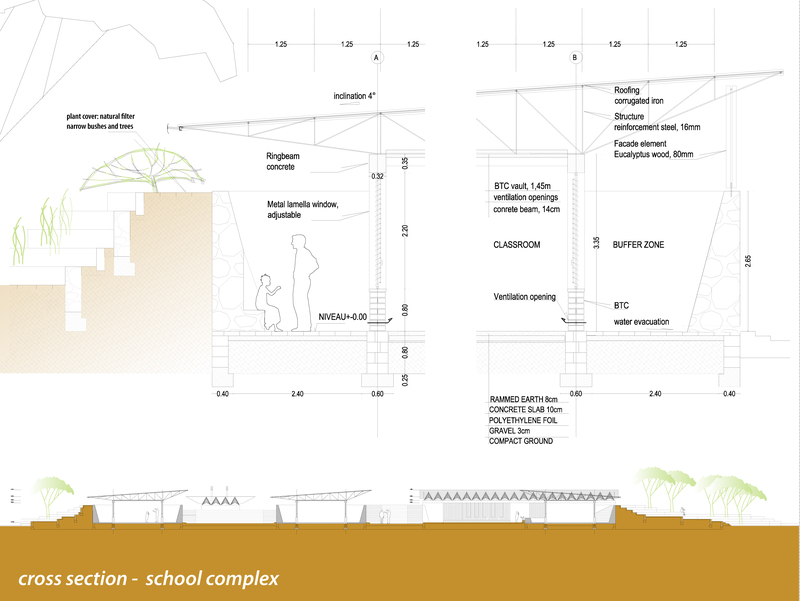 Between the classrooms, a shaded area gives pupils space to study or relax. In the style of traditional compounds, a wall will surround the secondary school, protecting it from wind, dust and sandstorms. 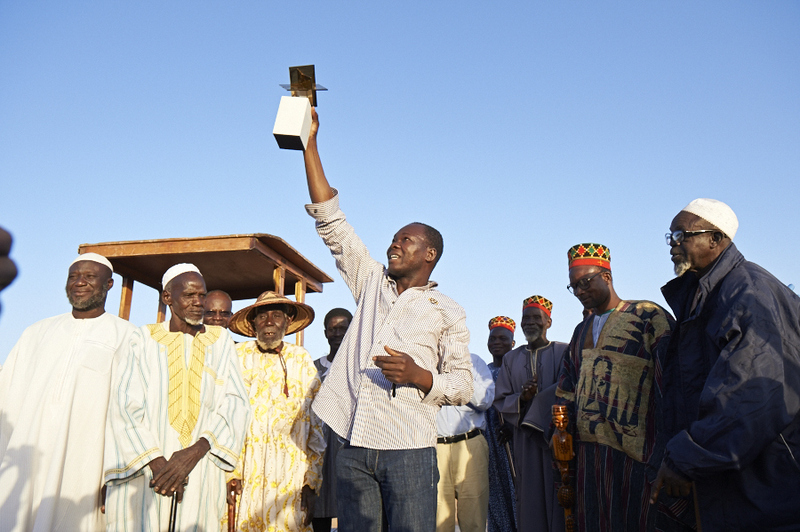 Francis Kéré presented his inspiring work at a TED Talk in New York. He knew exactly what he wanted to do when he got his degree in architecture – go home to Gando in Burkina Faso, to help his neighbors reap the benefit of his education. 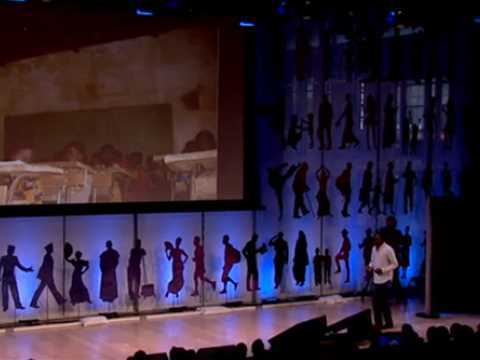 In this talk as part of TEDCity2.0 in New York City, Francis Kéré shows off some of the beautiful structures he has helped to build in his small village in the years since then, including an award-winning primary school made from clay by the entire community, and his Holcim Awards prize-winning secondary school. 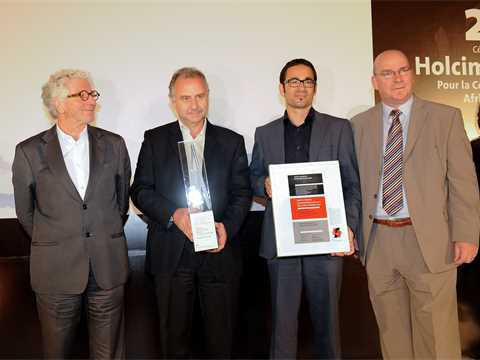 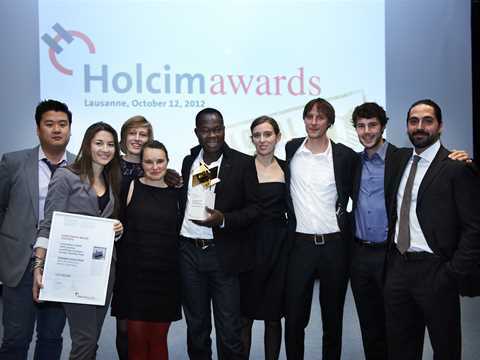 “Prix global Holcim Or 2012 – Collège de Gando”: enthusiastic students raise the Global Holcim Awards Gold trophy in celebration. 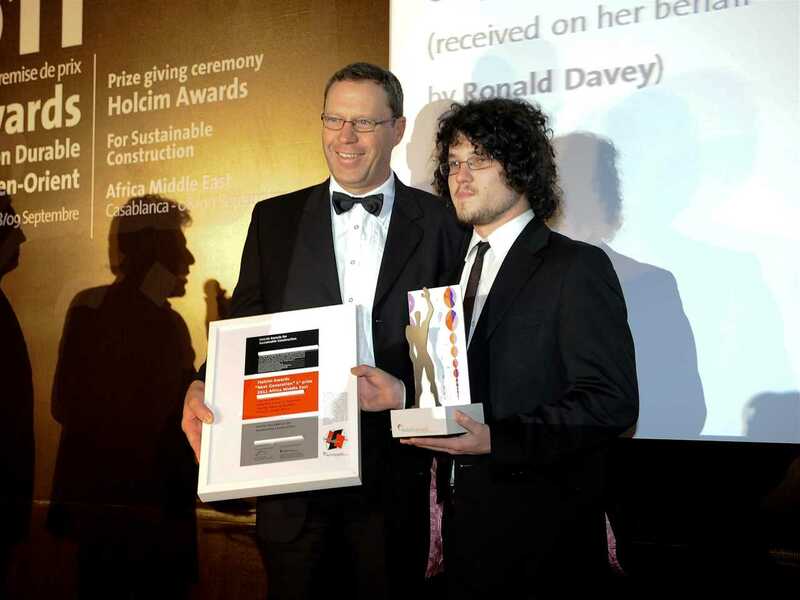 Celebrating the Global Holcim Awards Gold prize with the building columns under construction in the background. 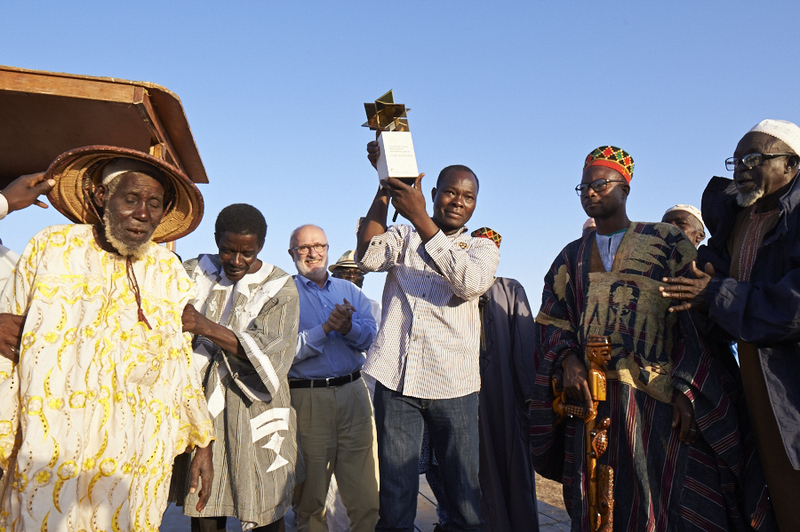 Raising the standard: Diébédo Francis Kéré (center) and representatives of the local village, regional authorities, politics, and religion celebrate the Gold prize in front of the Gando secondary school buildings which are currently under construction. 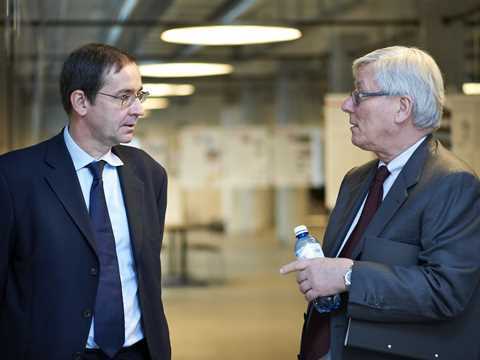 “The seeds we plant today are that which will be harvested tomorrow”, stated Rolf Soiron (left), Chairman of Holcim, with translators (right) providing French or local language translations. 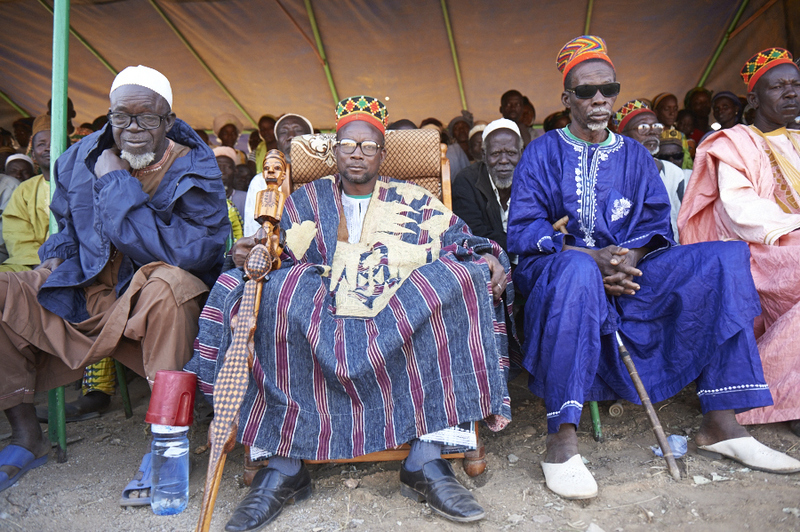 Chiefs of the Gando village, and representatives of regional and local authorities, politics, and religious groups attended the community celebration. “Vive le prix Holcim”: enthusiastic students raise the Global Holcim Awards Gold trophy in celebration. 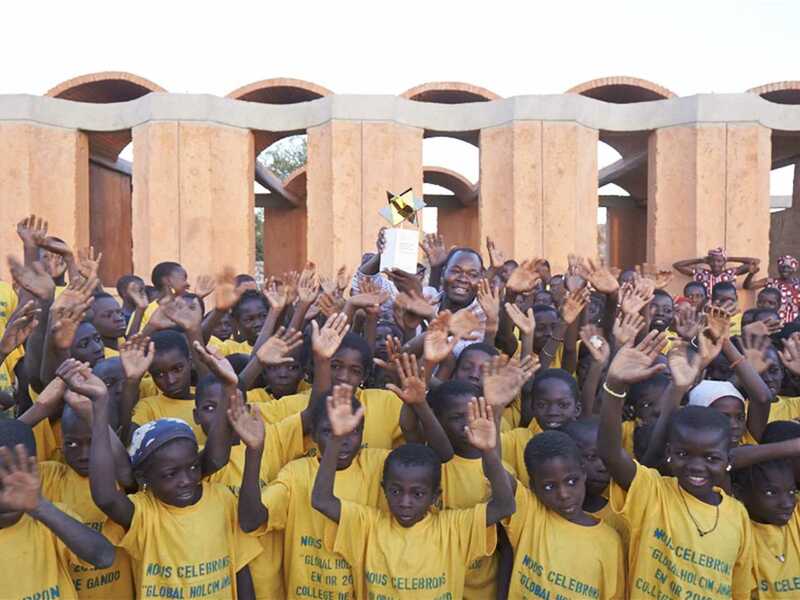 A guard of honor by some 1,000 students of the Gando school resplendent in tee-shirts carrying welcome message: “Merci à la Fondation Holcim” and “Bienvenue la Fondation Holcim à Gando”. 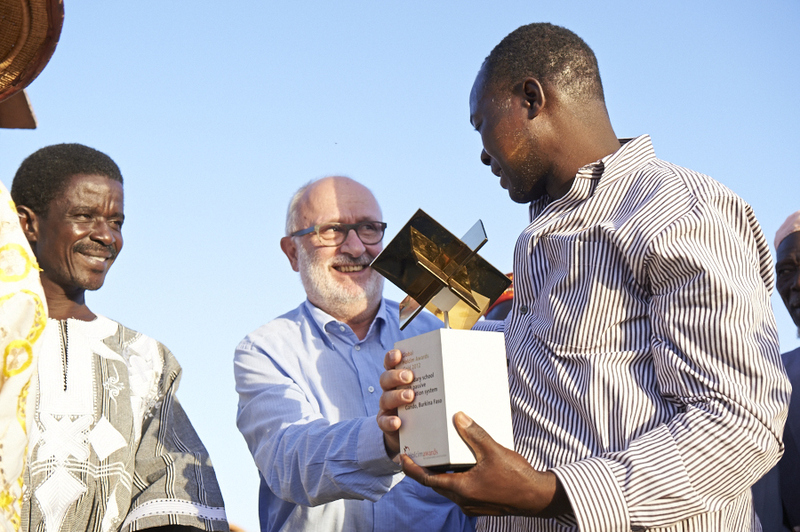 Rolf Soiron, Chairman of the Holcim Foundation and Chairman of Holcim (center) congratulates Gold Award winning architect Diébédo Francis Kéré. Diébédo Francis Kéré at a lecture on the Gando school project in Accra, Ghana hosted by ArchiAfrika. 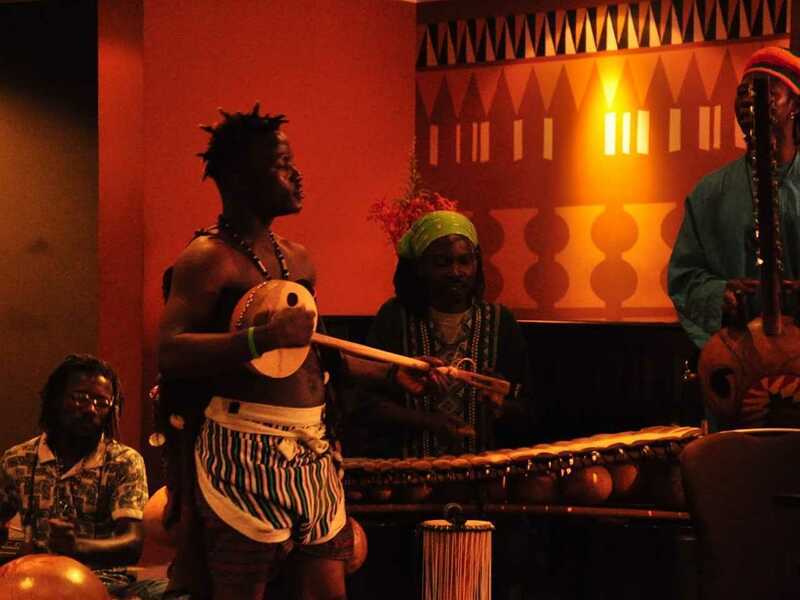 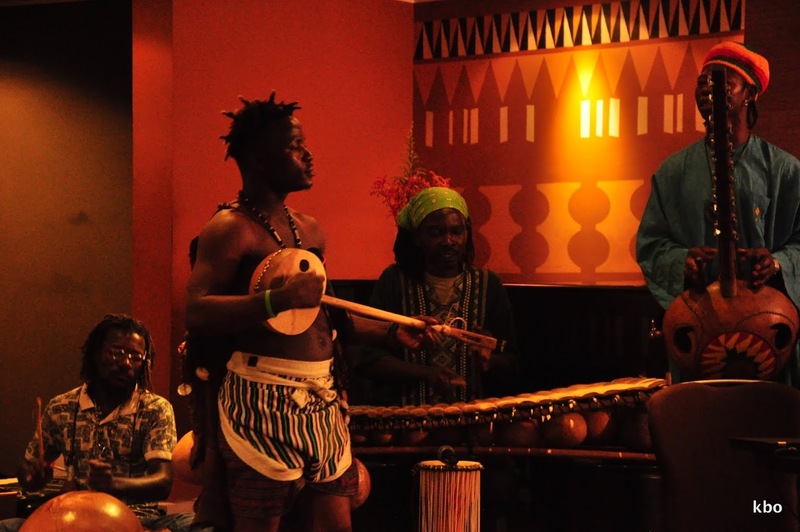 Performers welcomed guests to a lecture on the Gando school project in Accra, Ghana hosted by ArchiAfrika. 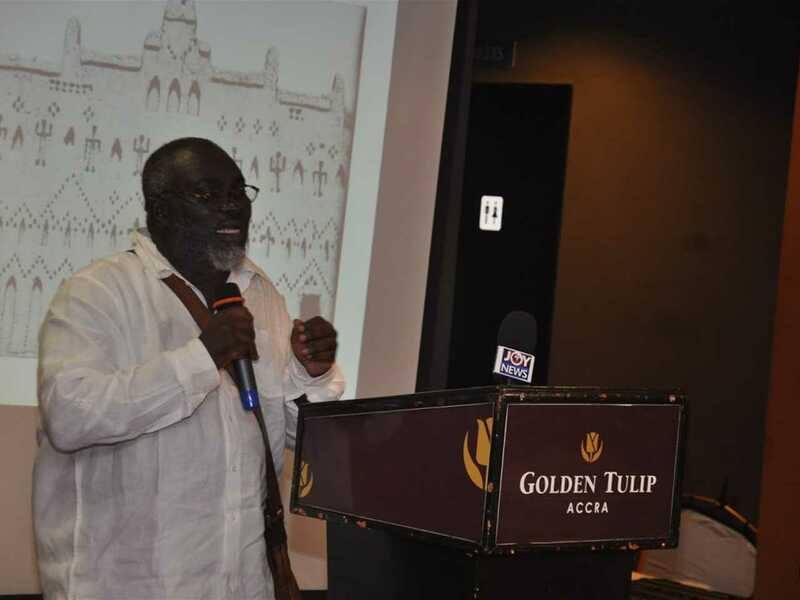 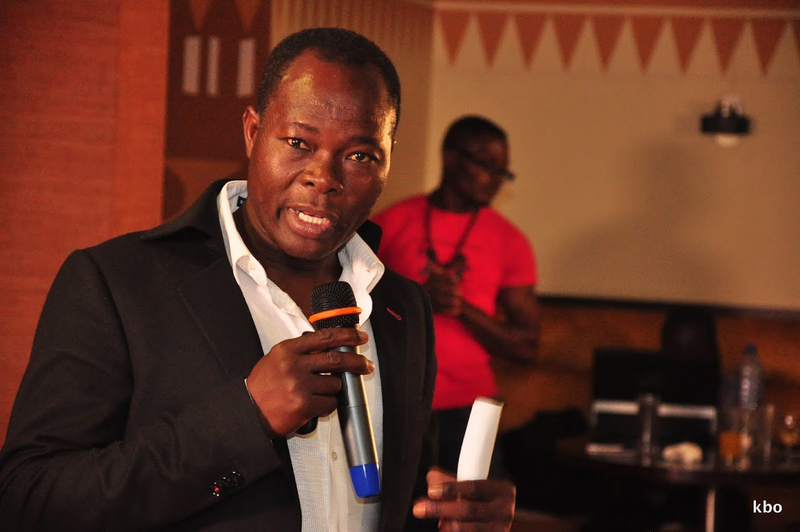 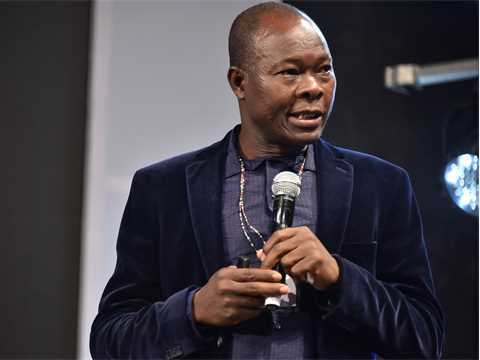 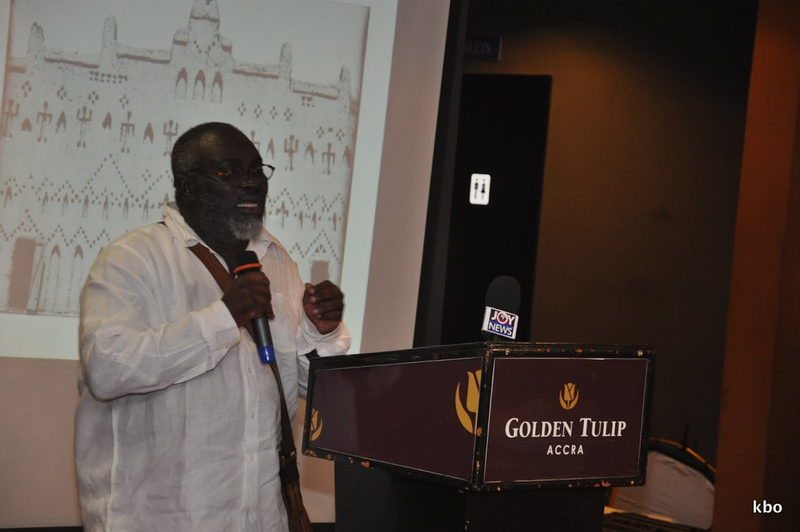 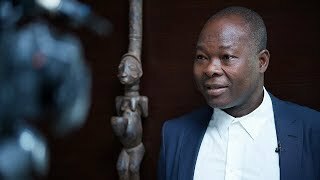 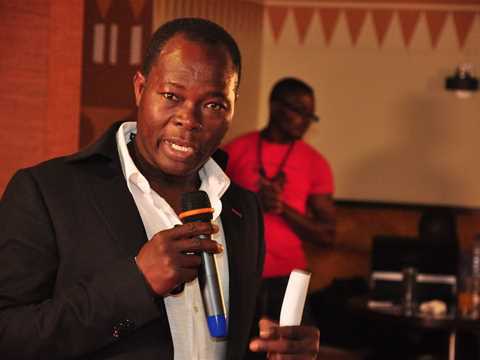 The “Adventurers in the Diaspora” series of lectures by ArchiAfrika Accra featured the Global Holcim Awards Gold winner - Burkina Faso born architect, Diébédo Francis Kéré. Architect Joe Osae-Addo, Chairman of ArchiAfrika and member of the Holcim Awards jury for Africa Middle East introduces Diébédo Francis Kéré. 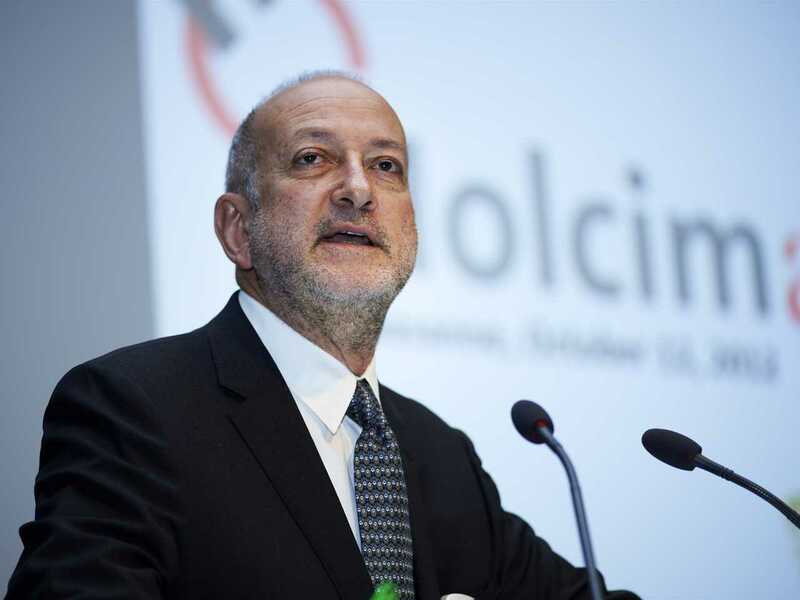 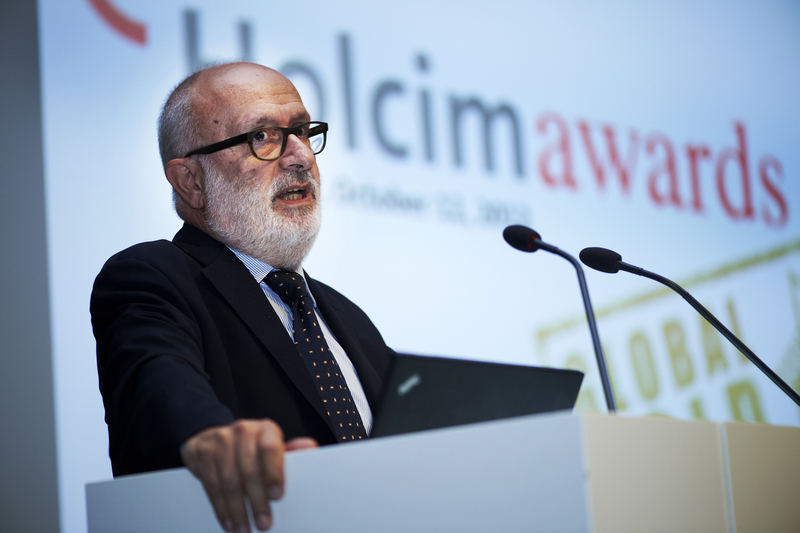 Rolf Soiron, Chairman of the Holcim Foundation and Chairman of Holcim explains the role of the Holcim Awards competition in promoting sustainable approaches to building and construction. 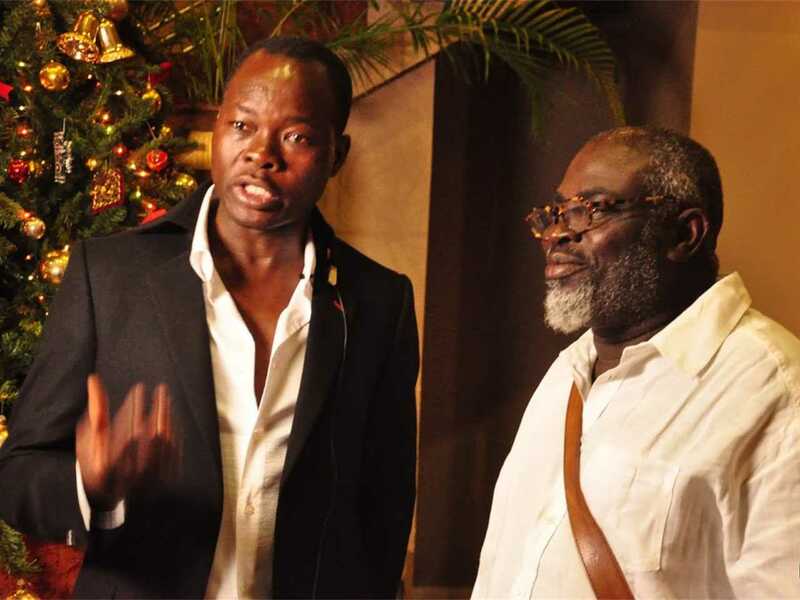 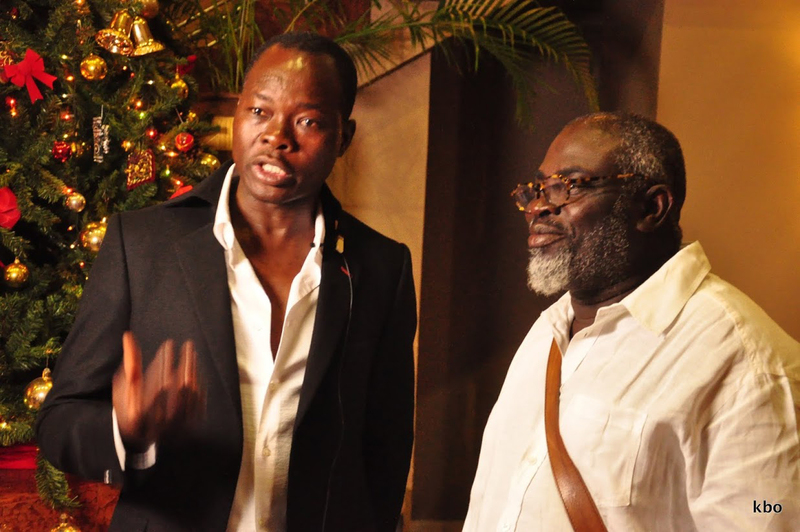 At the AchriAfrika lecture were (l-r): project author Diébédo Francis Kéré and architect Joe Osae-Addo, Chairman of ArchiAfrika and member of the Holcim Awards jury for Africa Middle East. 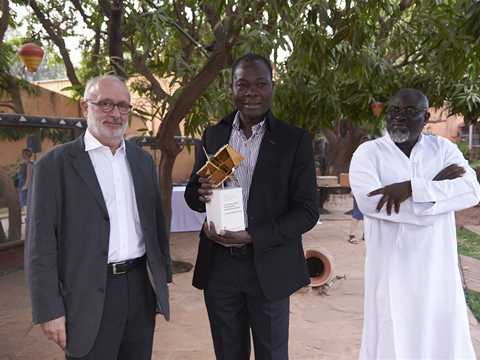 A series of events in West Africa celebrating the Global Holcim Awards Gold project, Secondary school with passive ventilation system, by Diébédo Francis Kéré included an enthusiastic reception at the school site in Gando, Burkina Faso as well as a media conference in the capital Ouagadougou and a presentation in Accra, Ghana. 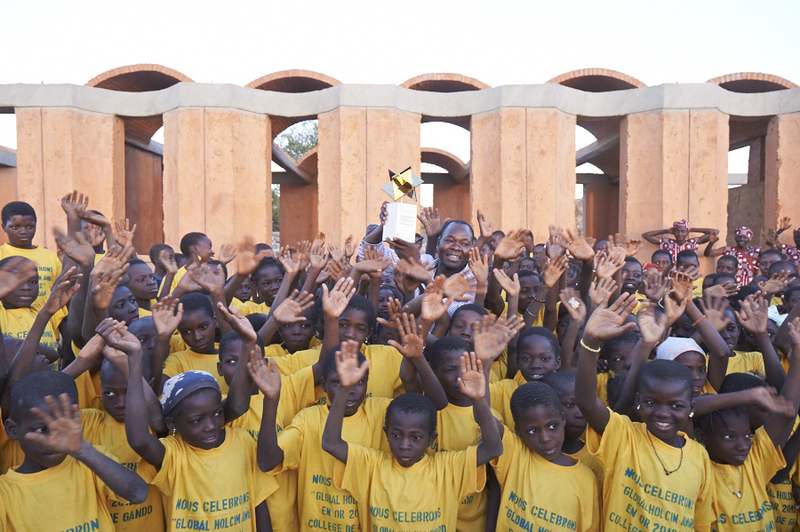 More than 3,000 community members including around 1,000 school children, representatives of regional and local authorities, politics, and religion enjoyed a village festival to celebrate the global Holcim Awards gold prize won by the school and to congratulate Diébédo Francis Kéré. 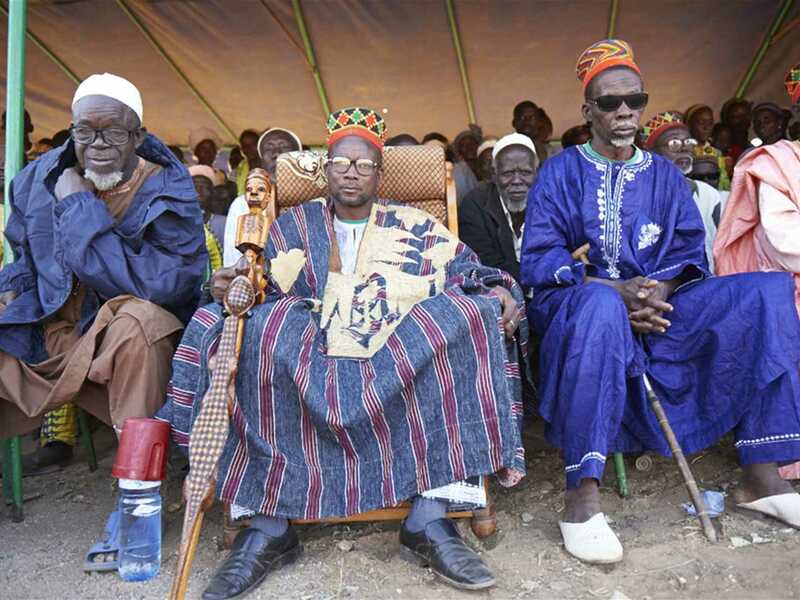 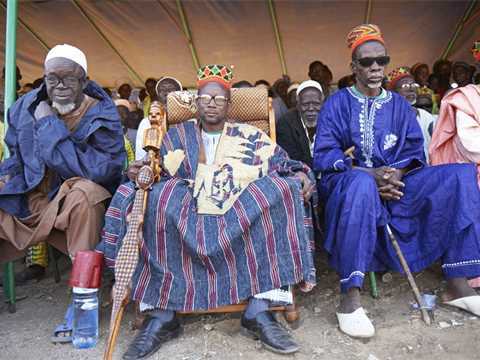 The reception began with a greeting by a village elder and a guard of honor by school students to welcome guests to the village of Gando, about 200km from the capital Ouagadougou. 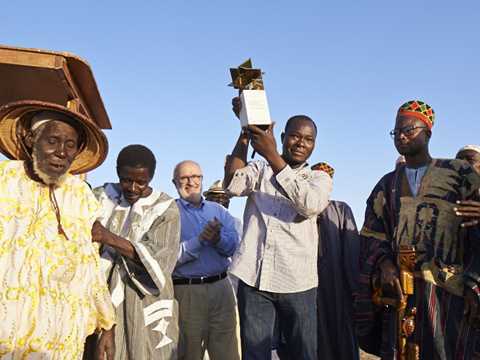 The gold trophy was presented in front of the building which is currently under construction and was followed by an evening of food, traditional dances, music and singing. 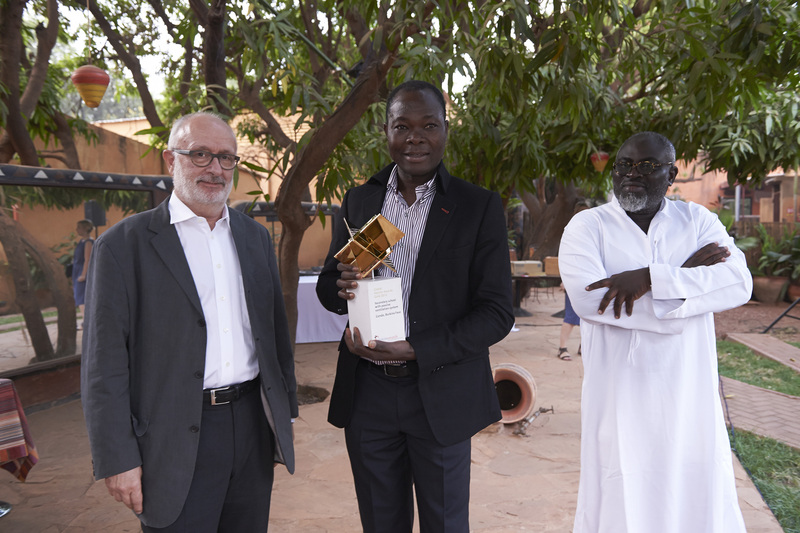 The prize hand-over included speeches by local dignitaries and a student representing the Gando school; Rolf Soiron, Chairman of the Holcim Foundation and Chairman of Holcim; Edward Schwarz, General Manager of the Holcim Foundation; and prize-winning architect, Diébédo Francis Kéré. “If the state cannot help, we must help ourselves,” explained Diébédo Francis Kéré, emphasizing priority of school construction above the purchase of consumer goods such as televisions. “The seeds we plant today are that which will be harvested tomorrow”, stated Rolf Soiron. “The grandchildren of the community that has built the school will still remember the Gando school initiative in years to come.” He further commented that architects should not be blind to the challenges of urbanization, demography, environment, equity, economics, nor the value of beauty. 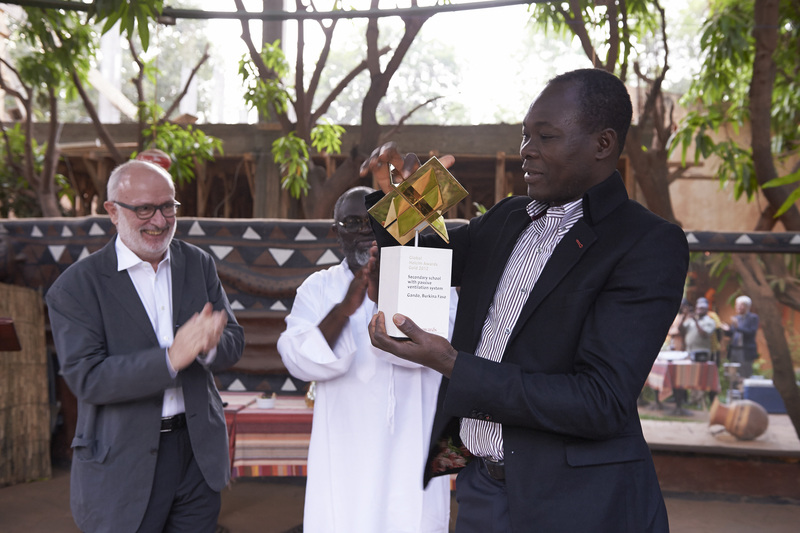 Before the celebration event in Gando, project author Diébédo Francis Kéré attended a media conference and a prize-handover reception in Ouagadougou – where he challenged African architects to make use of the abundant materials and human resources at their disposal to create contemporary eco-friendly and community-based architecture without compromising quality. 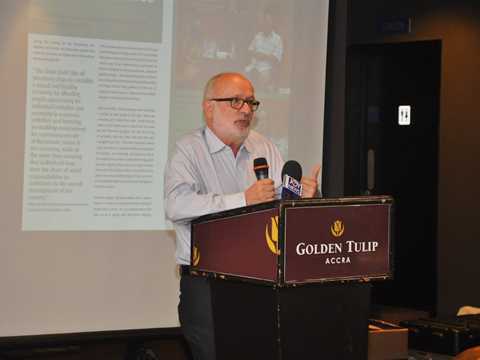 The media event attracted some 30 journalists in addition to invited guests including the Ambassadors of Belgium and the USA, and diplomatic representatives from Algeria, the European Union, and the United Kingdom. 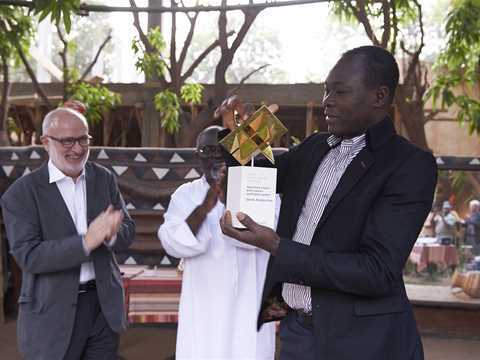 The prize-handover was conducted by architect Joe Osae-Addo, Chairman of ArchiAfrika and member of the Holcim Awards jury for Africa Middle East, together with Rolf Soiron. 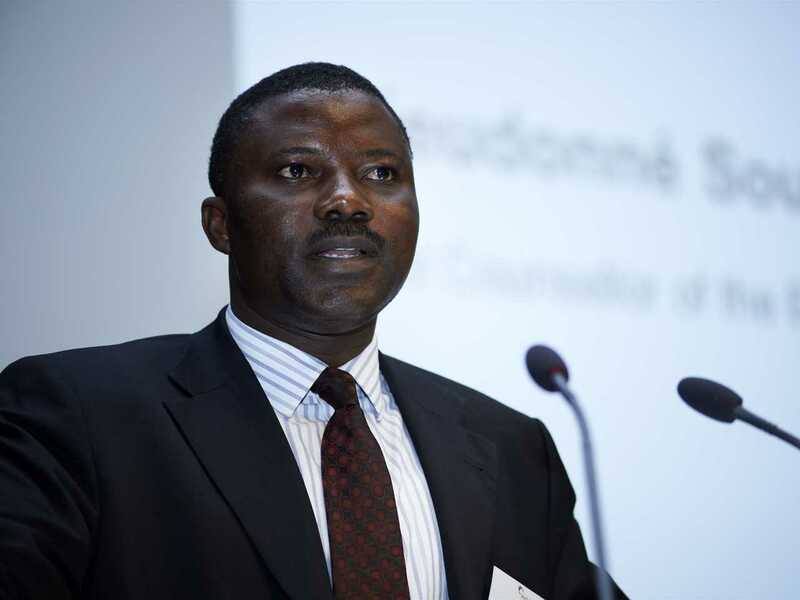 Joe Osae-Addo explained the significant contribution of the project to sustainable construction. “The school project uses a hybrid building technique and was praised for creating a remarkable environment both from a social and constructive point of view,” he said. The winner of the prize is Berlin-based architect Diébédo Francis Kéré, himself a son of the village headman of Gando where his latest school complex for more than 1,000 children is being constructed. 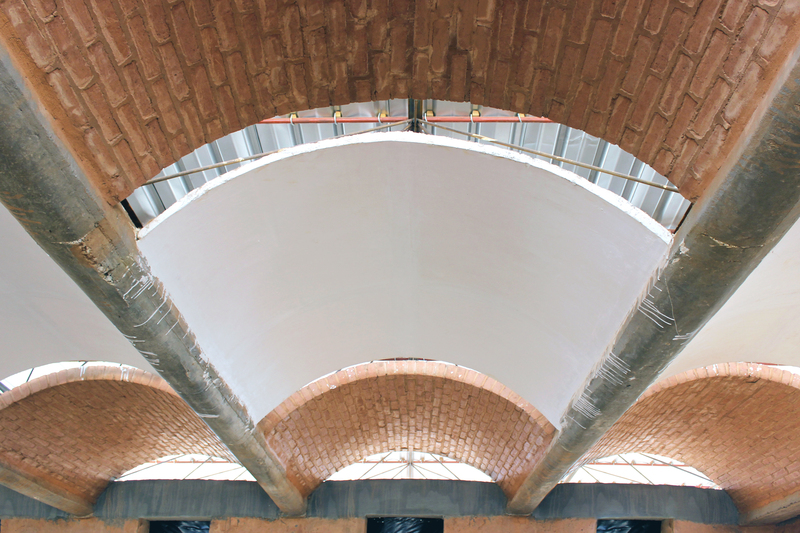 The project combines traditional building materials and new technologies and utilizes a cement-stabilized reinforced cast earth process. 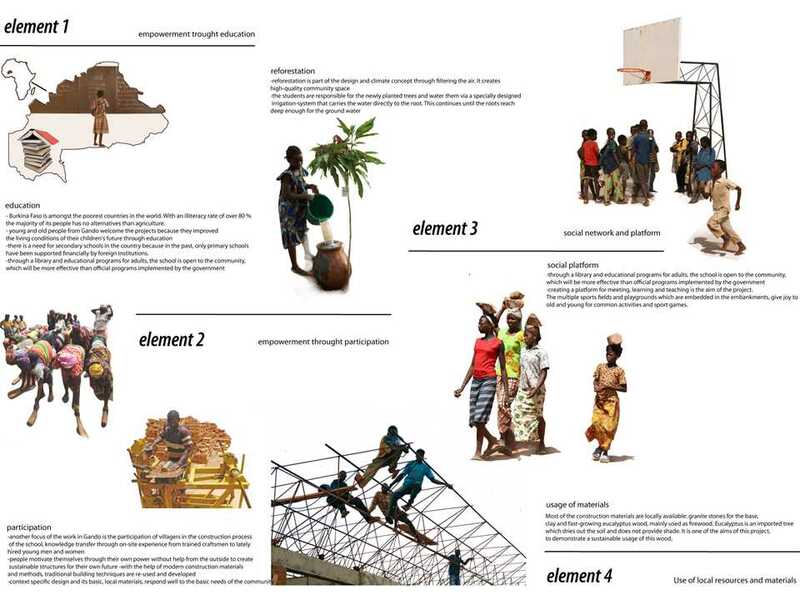 The approach places great emphasis on actively involving the local population in the construction process. 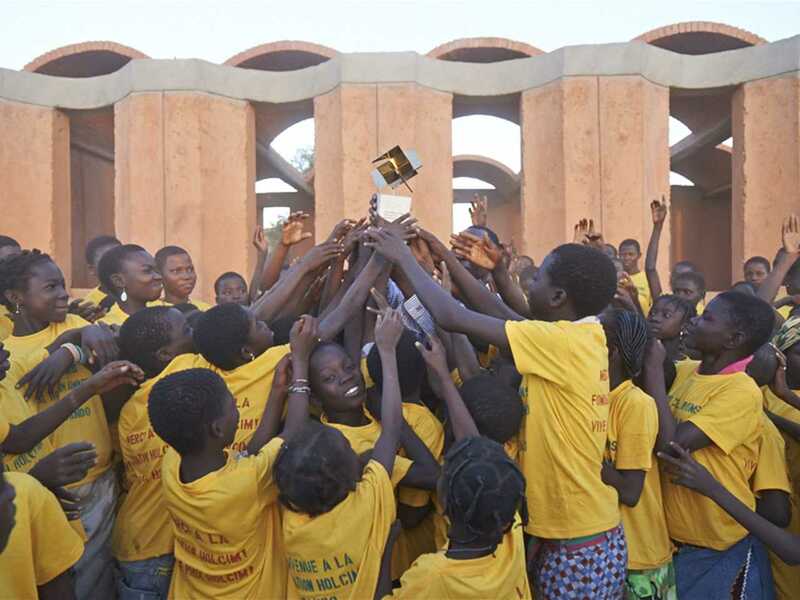 The series of events in Africa to celebrate the gold award will conclude with a lecture on the Gando school project in Accra, Ghana hosted by ArchiAfrika. The event has attracted more than 100 guests including the Deputy Minister of Education of Ghana, and will be steamed via the Internet to the partner universities of ArchiAfrika across the continent. The buildings are cooled by a specially developed natural cooling system through the walls, ceilings and roof structures (Secondary school with passive ventilation system, Gando, Burkina Faso). The secondary school in Gando is a lighthouse project providing an outstanding contribution to the dominant issues on the country’s path to a sustainable future. 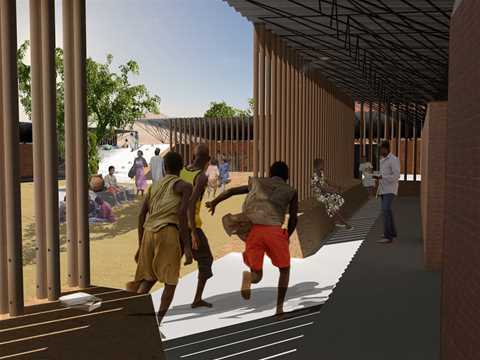 The jury was unanimously impressed by the school’s beauty and its innovative architectural concept, which combines both modern and vernacular construction methods, as well as by its social and educational impact. 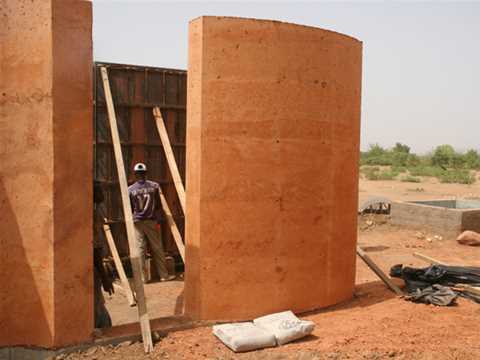 Locally-sourced clay is mixed with aggregates and cement to cast walls on-site based on a two-piece formwork. 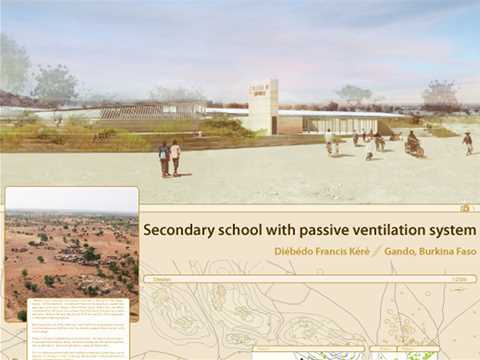 The school also shows how a low-tech, energy saving and low-cost climatic concept can be used in extremely hot weather conditions. 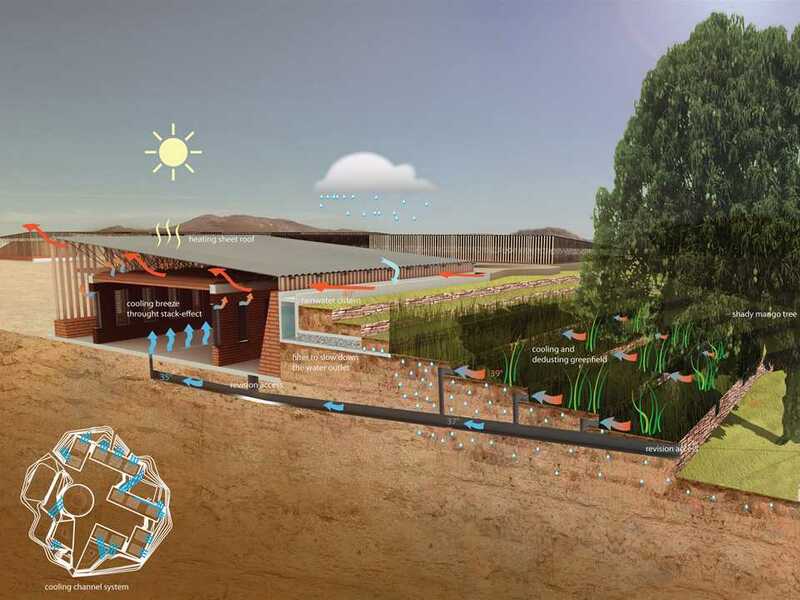 Technical solutions including passive ventilation, underground cooling, and automatic irrigation are integrated into the architectural solution. 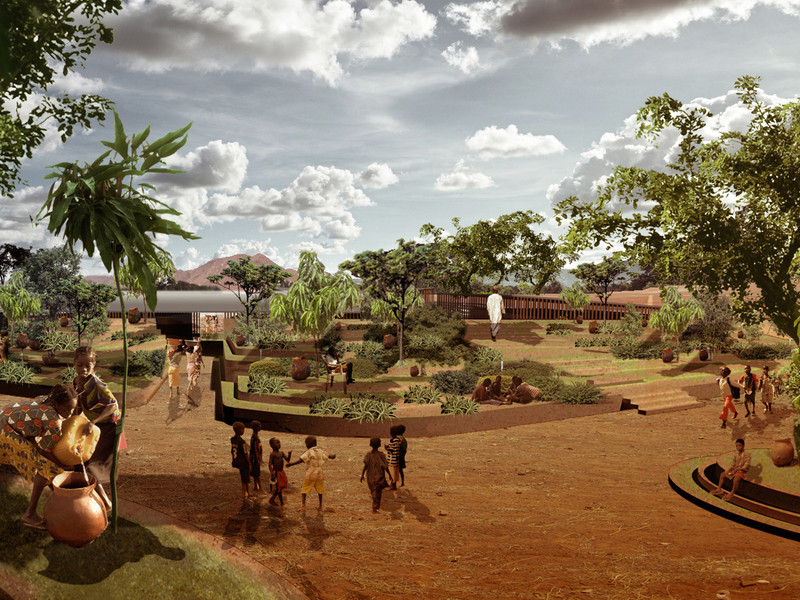 Reforestation, greenery, stack-effect air currents, and double-skin roofs and façades are other important sustainable components of the clay building. 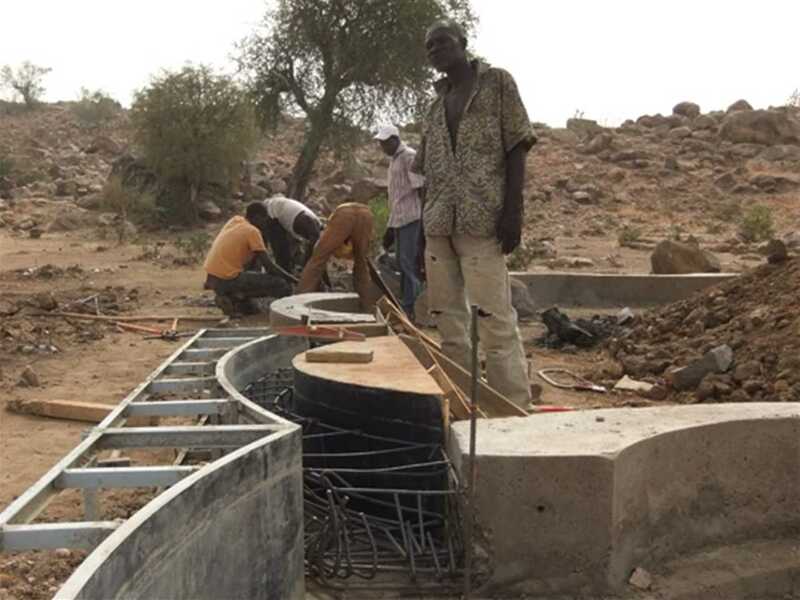 To fight against the ongoing expansion of the desert and to prevent the dehydration of the ground, rainwater is captured and centrally stored for irrigating the newly-planted trees in the area. From a materials and technology perspective, the secondary school in Gando will set an example for new sustainable construction – not only in the arid Sahel, but in all developing regions around the world. The project provides more than just a testament to the potential of locally-sourced materials. Built by the community, the construction process is considered to be an important part of the transfer of knowledge, whereby locals acquire new building skills that can be reused and taught. 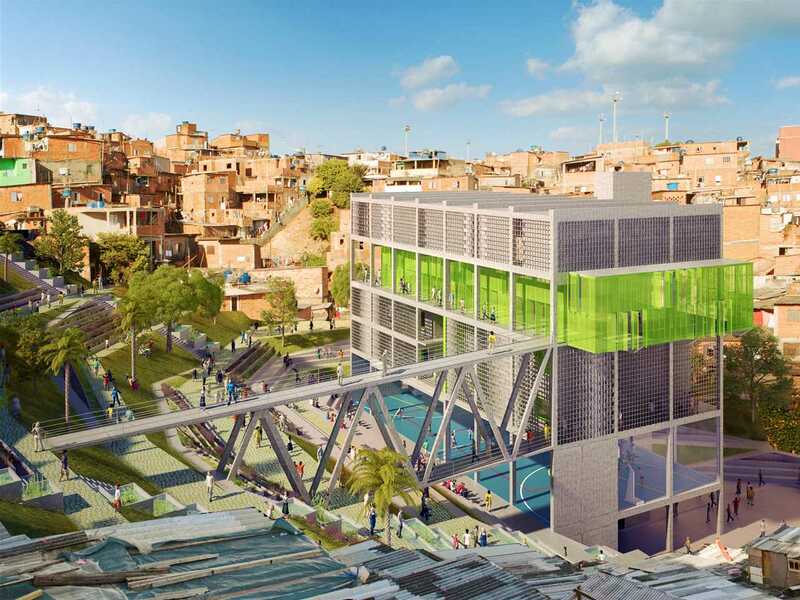 This common effort and on-site training of the residents in the vicinity of the new school substantially increases social cohesion among families and self-reliance of the whole community. 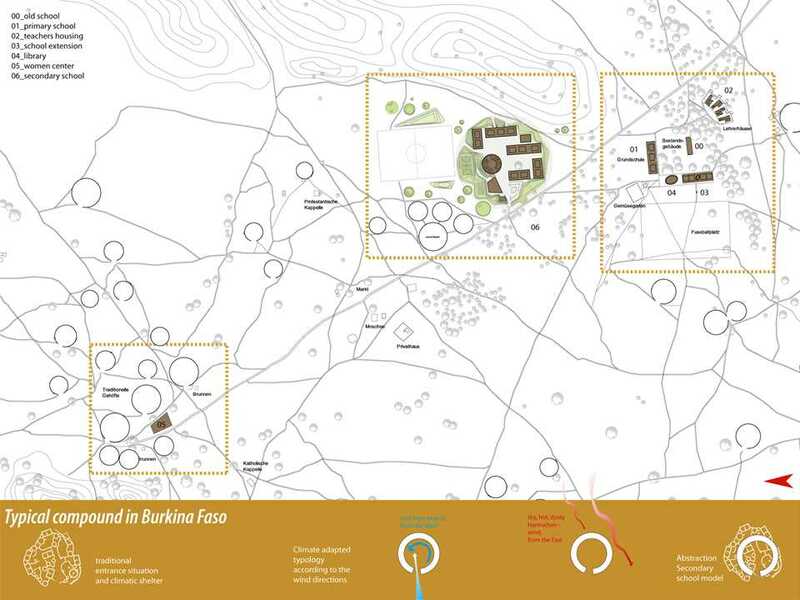 The jury commended this project due to these multifaceted and future-oriented elements. The comprehensive approach to this school project is an exemplarily application of sustainable construction according to the five “target issues” for sustainable construction of the Holcim Foundation, and will have an undoubtedly strong impact on similar endeavors in developing regions. 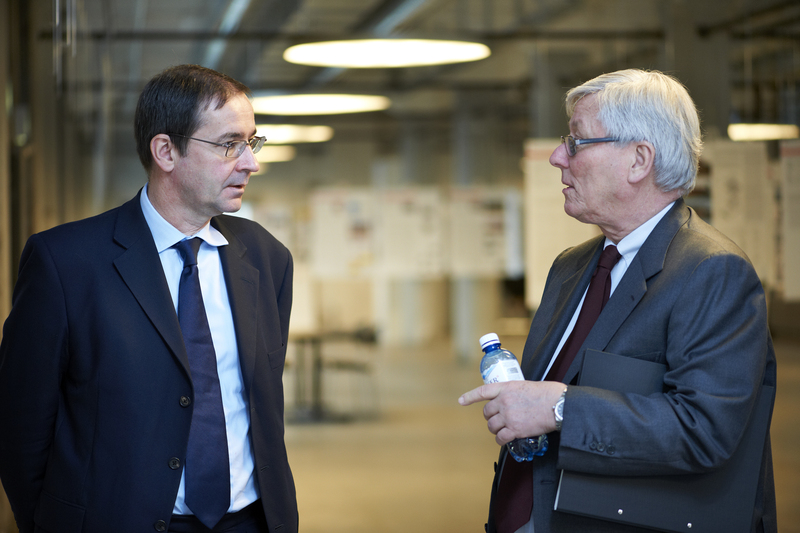 Global Holcim Innovation prize jury meeting 2012, Zurich, Switzerland: (l-r) Bernard Fontana, Chairman of the Steering Committee of the Holcim Foundation and CEO of Holcim with head of jury Harry Gugger, Principal, Harry Gugger Studio, Basel; Professor of Architecture, École Polytechnique Fédérale de Lausanne (EPFL), Switzerland. Bernard Fontana (left) and Markus Akermann during the Global Holcim Innovation prize 2012 jury meeting in Zurich, Switzerland. 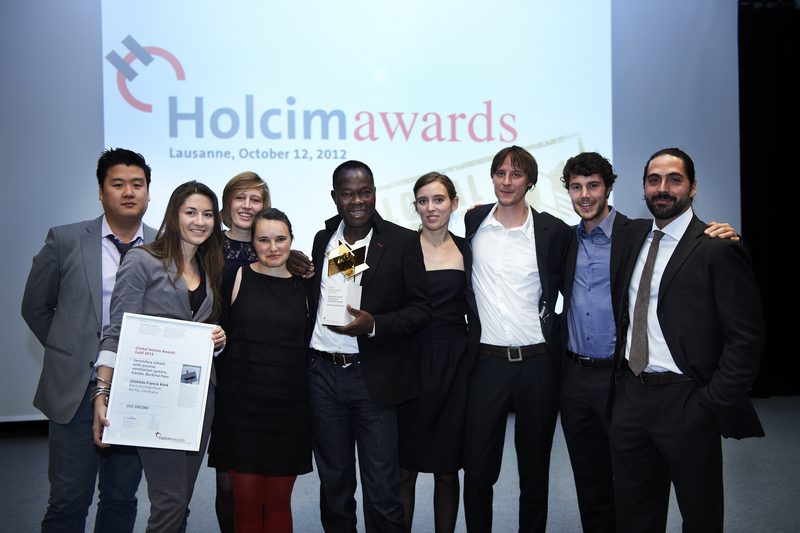 The Global Holcim Awards Gold 2012 prize handover held at the iconic Rolex Learning Center of the École Polytechnique Fédérale de Lausanne (EPFL), Switzerland. Global Holcim Awards Gold 2012 hand-over event in Lausanne, Switzerland for "Secondary school with passive ventilation system", Gando, Burkina Faso: Dieudonné Sougouri, First Counselor of the Embassy of Burkina Faso in Switzerland, was enthusiastic about the project and the achievements of Diébédo Francis Kéré. Global Holcim Awards Gold 2012 hand-over event in Lausanne, Switzerland for "Secondary school with passive ventilation system", Gando, Burkina Faso: Rolf Soiron, Chairman of Holcim, praised the project for its approach to using traditional building materials and technologies that also places great emphasis on actively involving the local population in the construction process. 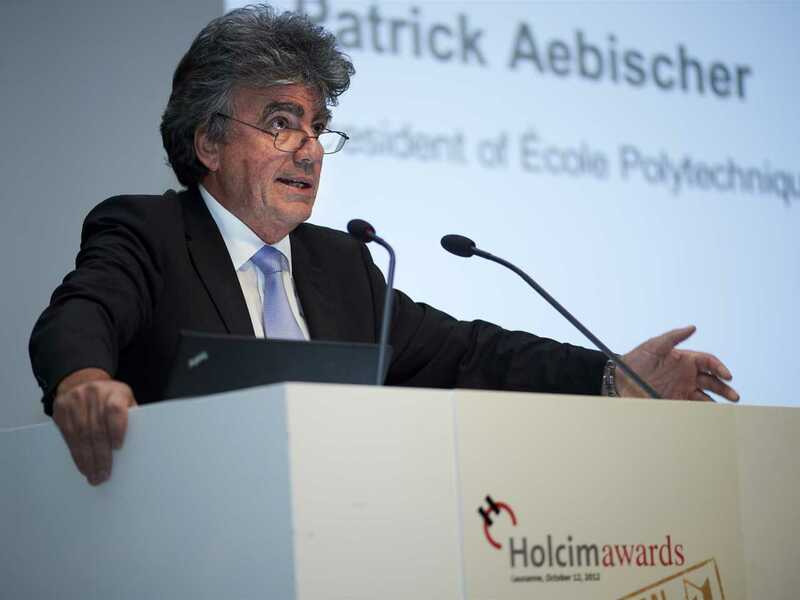 Global Holcim Awards Gold 2012 hand-over event in Lausanne, Switzerland for "Secondary school with passive ventilation system", Gando, Burkina Faso: Patrick Aebischer, President of the École Polytechnique Fédérale de Lausanne (EPFL), Switzerland, welcomed guests, including around 300 students of the EPFL, to the prize handover held at the iconic Rolex Learning Center. 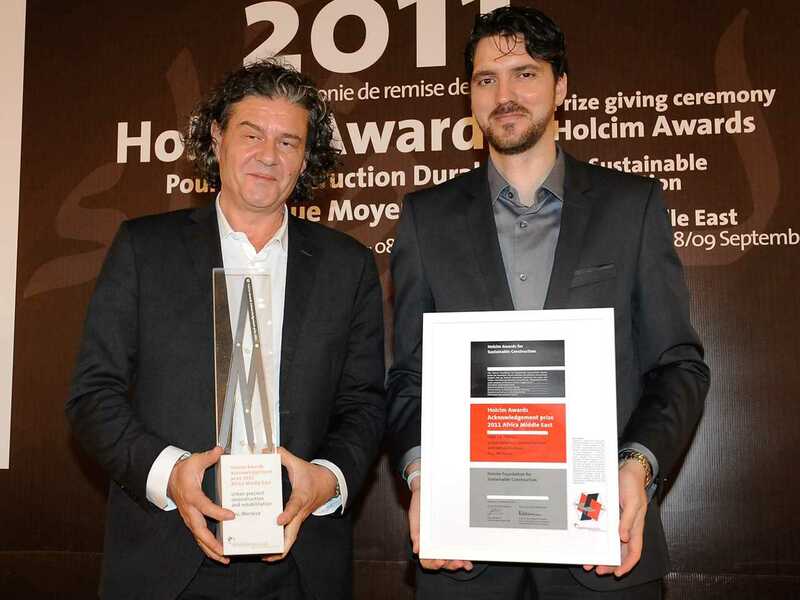 Global Holcim Awards Gold 2012 hand-over in Lausanne, Switzerland for "Secondary school with passive ventilation system", Gando, Burkina Faso: Enrique Norten, Principal and Founder of TEN Arquitectos, and head of the Global Holcim Awards jury (Mexico/USA), explained the exemplary nature of the project in terms of its successful approach to the adaptive use of building materials, community development, climatic mitigation and aesthetics. 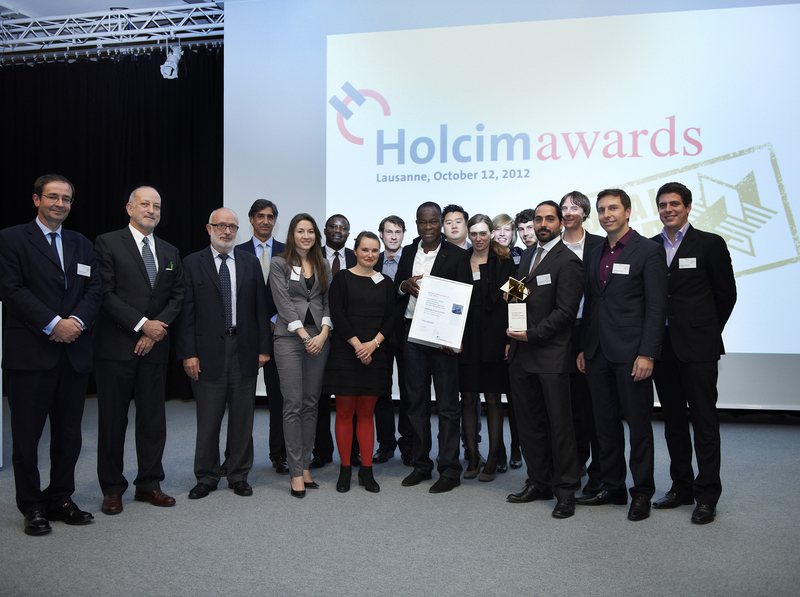 Presentation of the Global Holcim Awards Gold 2012 certificate for "Secondary school with passive ventilation system", Gando, Burkina Faso, in Lausanne, Switzerland (l-r): Rolf Soiron, Chairman of the Board of the Holcim Foundation and Chairman of Holcim congratulates main author Diébédo Francis Kéré, Kéré Architecture, Germany. 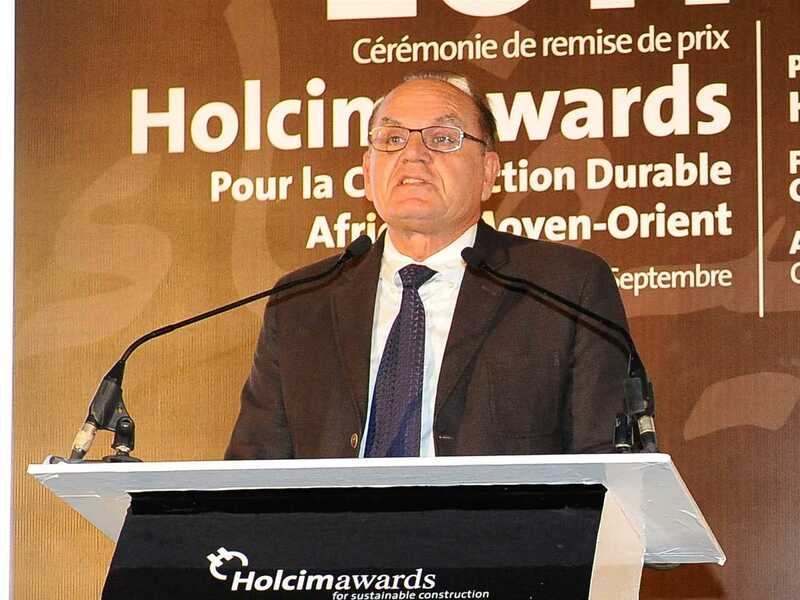 Global Holcim Awards Gold 2012 hand-over event in Lausanne, Switzerland for "Secondary school with passive ventilation system", Gando, Burkina Faso: Edward Schwarz, General Manager of the Holcim Foundation for Sustainable Construction was moderator of the Holcim Awards handover event which attracted some 400 guests from more than 30 countries. Winner of the Global Holcim Awards Gold 2012, Diébédo Francis Kéré, Kéré Architecture, Germany for "Secondary school with passive ventilation system", Gando, Burkina Faso. 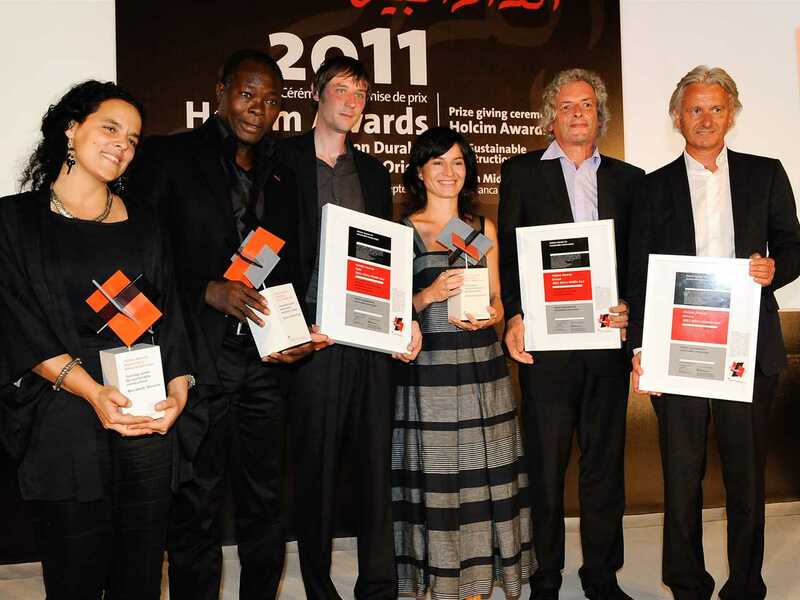 The Global Holcim Awards Gold 2012 winning team for "Secondary school with passive ventilation system", Gando, Burkina Faso (l-r): David Jun, Dessi Slava, Hanna Kümmerle, Claudia Buhmann, Diébédo Francis Kéré, Ines Bergdolt, Dominique Mayer, Emmanuel Dosaz, and Pedro Montero. 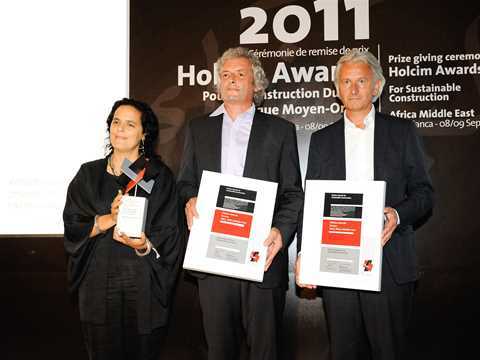 The secondary school in the village of Gando in Burkina Faso was selected to receive the Global Holcim Awards Gold 2012 out of more than 6,000 competition entries from all over the world. Speakers at the prize handover held at the iconic Rolex Learning Center of the EPFL Lausanne, Switzerland included internationally-renowned architect Enrique Norten, EPFL president Patrick Aebischer, and Holcim Chairman Rolf Soiron. The project was praised for its approach to using traditional building materials and technologies that also places great emphasis on actively involving the local population in the construction process. The Global Holcim Awards Gold 2012 was presented to Berlin-based architect Diébédo Francis Kéré, himself a son of the village headman of Gando where his latest school complex for more than 1,000 children is being constructed. 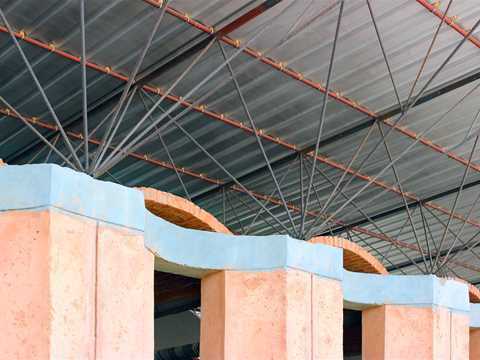 The architect needed to convince the locals of the durability and strength of clay which is poured and cast similar to concrete, improving its structural performance by adding a small proportion of cement. 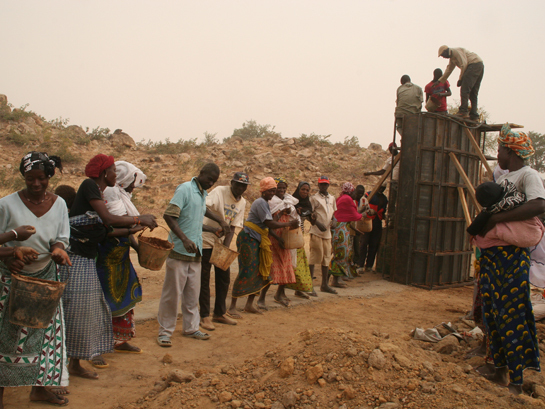 The approach uses clay and stones that are collected from land adjacent to the village, and introduces new and more sustainable construction techniques. Diverse design aspects of the project address the challenging weather conditions with temperatures peaking above 40°C. For the interior climate, the natural ventilation cooling effect is enhanced by routing air through underground tubes, planting vegetation, and the use of double-skin roofs and façades to achieve a remarkable temperature reduction. 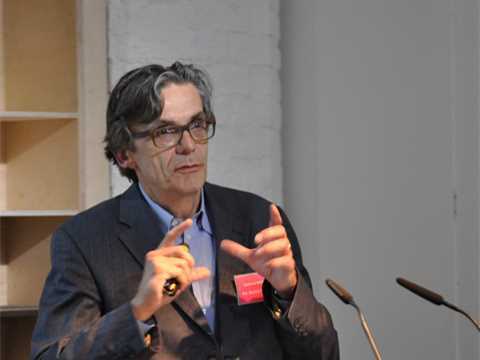 Enrique Norten, Principal and Founder of TEN Arquitectos, and head of the Global Holcim Awards jury (Mexico/USA), explained the exemplary nature of the project in terms of its successful approach to the adaptive use of building materials, community development, climatic mitigation and aesthetics. 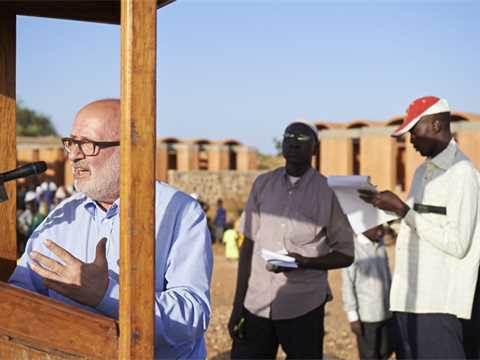 “This beautiful school is not only an elegant design solution, but it also delivers training and employment, uses local building materials, and – with simple means – creates an outstanding environment from a social perspective and also in constructive terms,” he said. 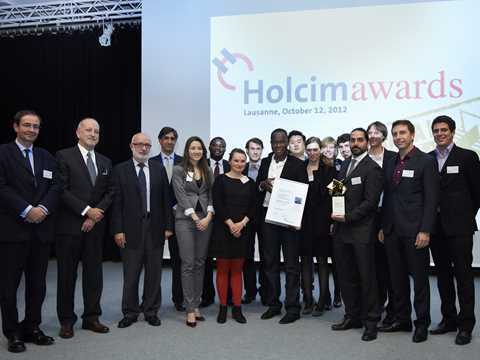 Chairman of the Steering Committee of the Holcim Foundation and CEO of Holcim, Bernard Fontana, congratulated the prize winner and his team for applying professional know-how and passionate dedication to developing an approach that is both socially-engaged and intelligently leverages the local human and physical resources. “The Secondary School Gando is constructed by the local community and builds not only a series of structures, but also a sense of identity and enhanced social cohesion,” he said. 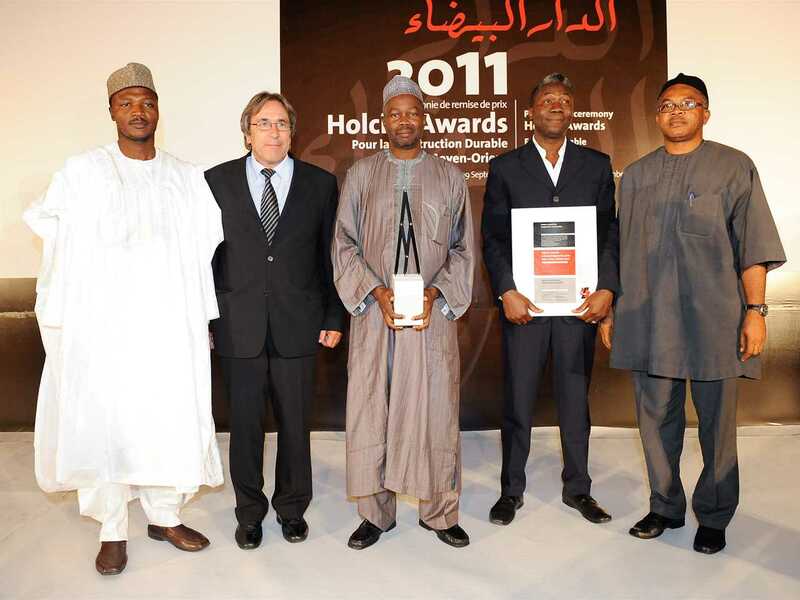 In the regional phase of the Holcim Awards 2011, this project won gold for Africa Middle East and thereby qualified for the Global Holcim Awards competition in 2012. The Holcim Awards competition is run by the Swiss-based Holcim Foundation and offers USD 2 million in prize money per three-year cycle. 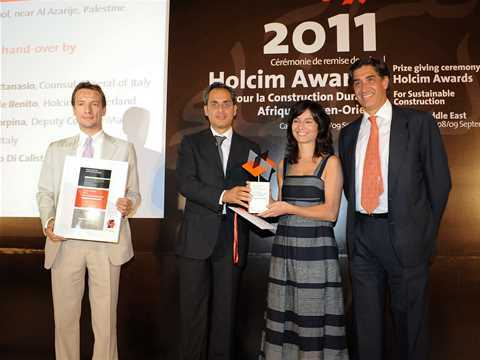 It is sponsored by Holcim Ltd, one of the world’s leading suppliers of cement and aggregates, and its Group companies in 70 countries. 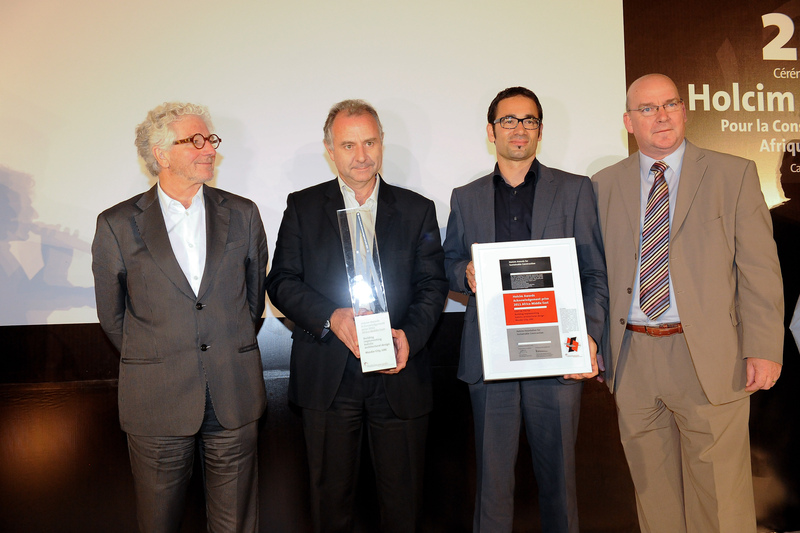 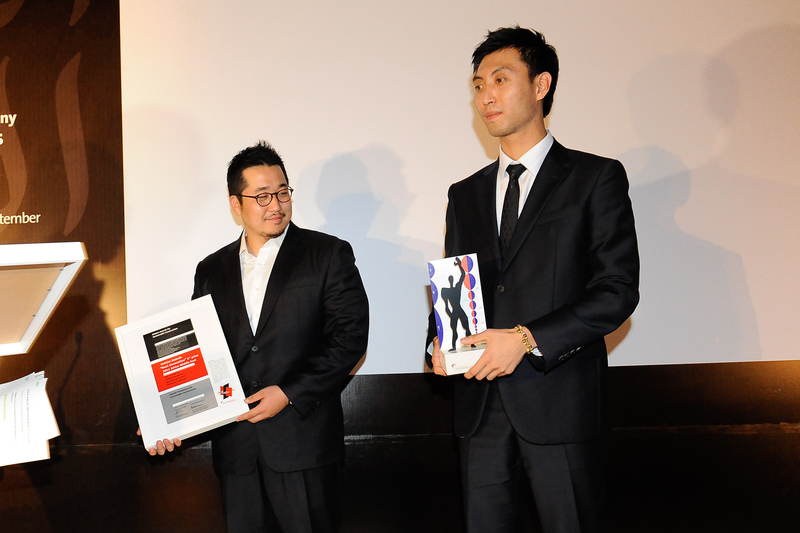 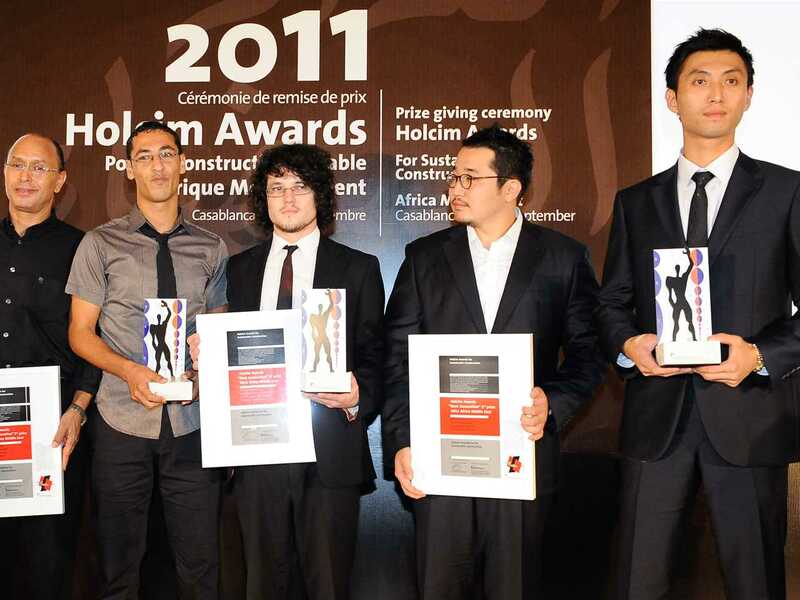 The next Holcim Awards competition will open on July 1, 2013. 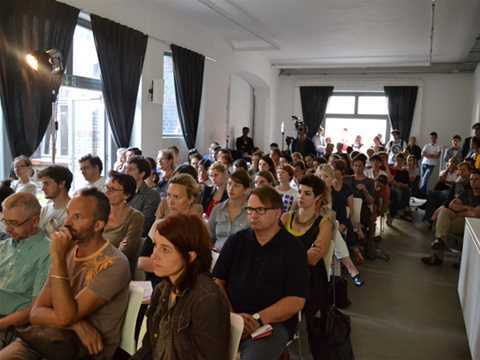 Around 200 attendees filled the auditorium, and the annex wing as well – Aedes Architekturforum in Berlin, demonstrating a keen interest in the topic of sustainable construction and the Holcim Awards winning projects discussed. 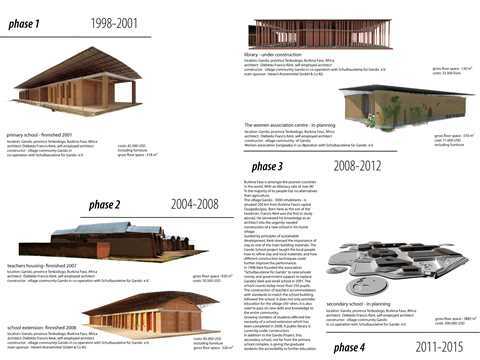 Eike Roswag of Ziegert | Roswag | Seiler Architekten Ingenieure, Germany explains the impact of the new two-story building, constructed from locally-sourced cob and bamboo in the project Locally-manufactured cob and bamboo school building, Jar Maulwi, Pakistan. 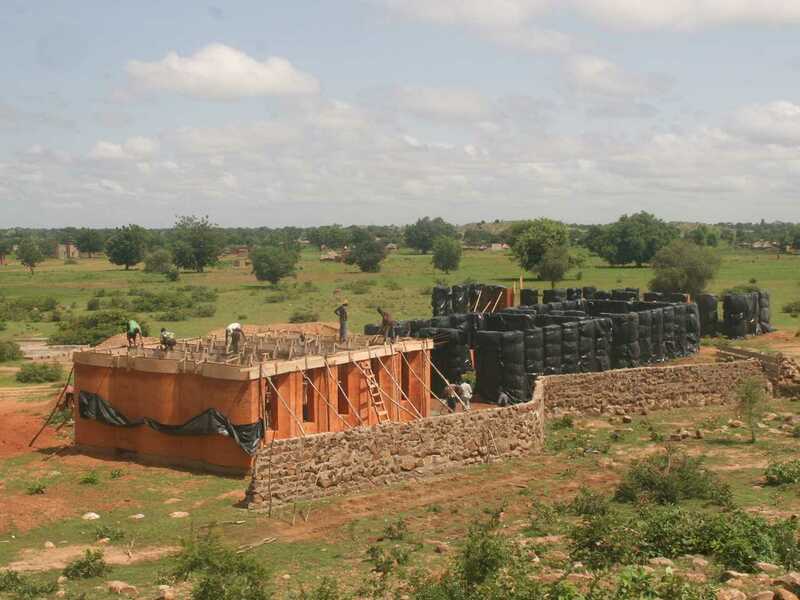 Diébédo Francis Kéré of Kéré Architecture, Germany talks about adapting and teaching cement-stabilized reinforced clay casting techniques that are now applied to the project “Secondary school with passive ventilation system” in Gando, Burkina Faso. 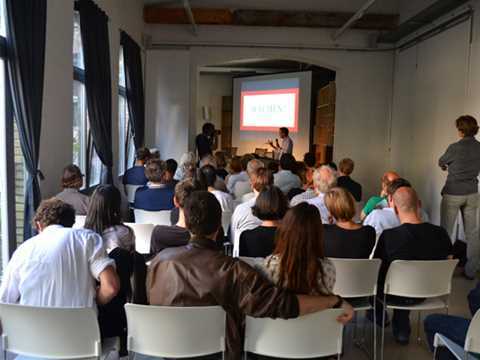 Architects Francis Kéré (Kéré Architecture) and Eike Roswag (Ziegert | Roswag | Seiler) fascinated 200 guests with presentations of their two school projects that are under construction in Burkina Faso and Pakistan – both projects use traditional building materials and technologies and place great emphasis on actively involving the local population in the construction process. 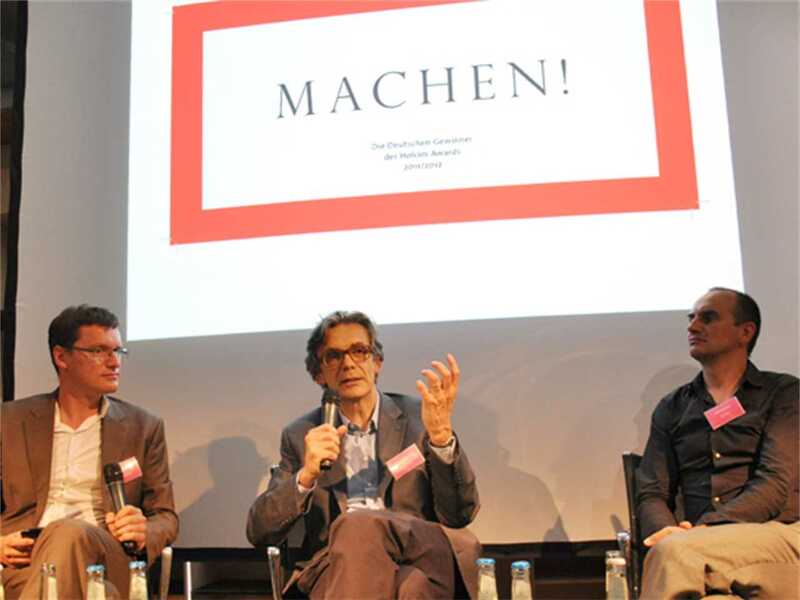 The exhibition “MACHEN!” (to make) at the AEDES Network Campus follows the development process of six projects including the Secondary school with passive ventilation system. All six projects are examples of a new, reflective approach to the topic: for a building to be truly sustainable, architects must use their own creative and conceptual skills – where technology is employed not for its own sake, but as a means to a well-executive series of objectives. Foundations are made of granite and mortar. 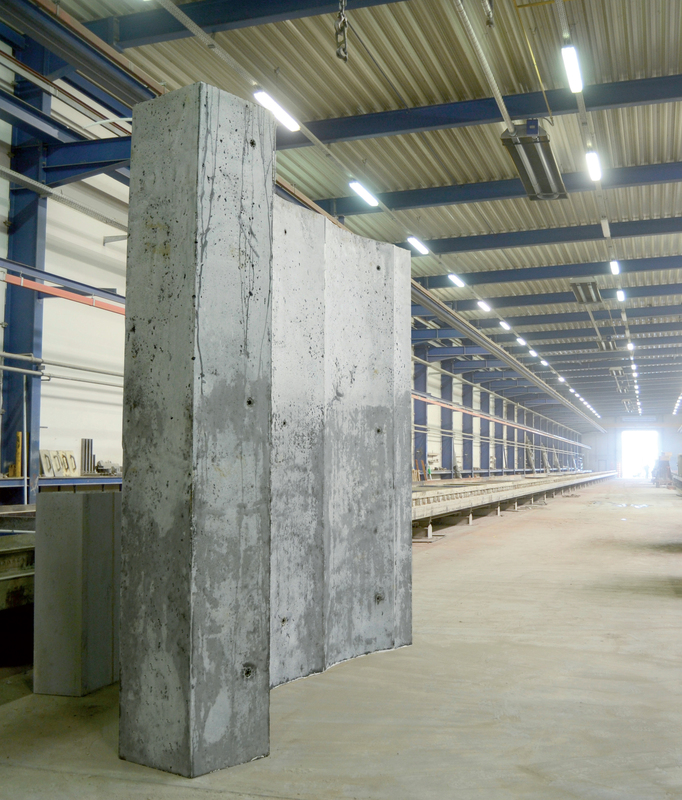 Reinforced ring beam made of concrete. 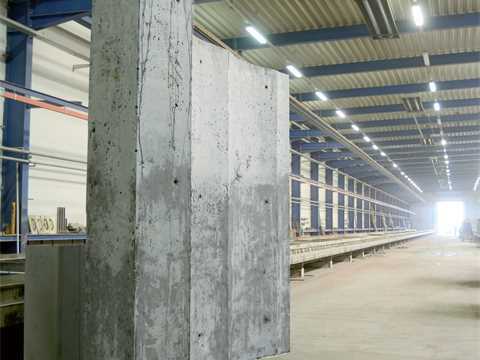 Concrete connection for reinforcing the wall elements. Most of the construction materials are locally available: granite stones for the base, clay and fast-growing eucalyptus wood, mainly used as firewood. Project update 2012 - Secondary school with passive ventilation system, Gando, Burkina Faso: Construction is progressing using larger clay elements cast in place instead of bricks for the walls, using similar materials but with the addition of gravel. 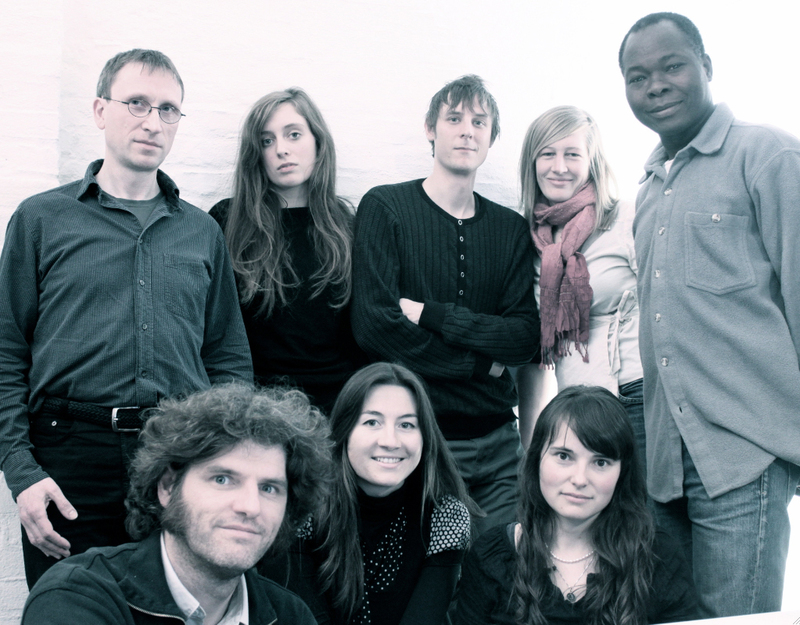 The project motivates the community through creating new jobs where traditional techniques are combined with new know-how. 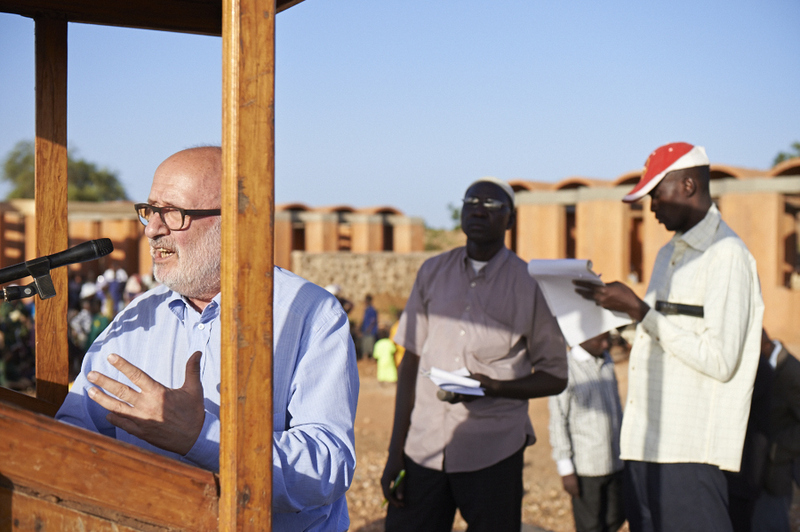 It is of a great importance to teach and train locals in the use of new techniques in order to enhance their independence and sustainability of the building process. 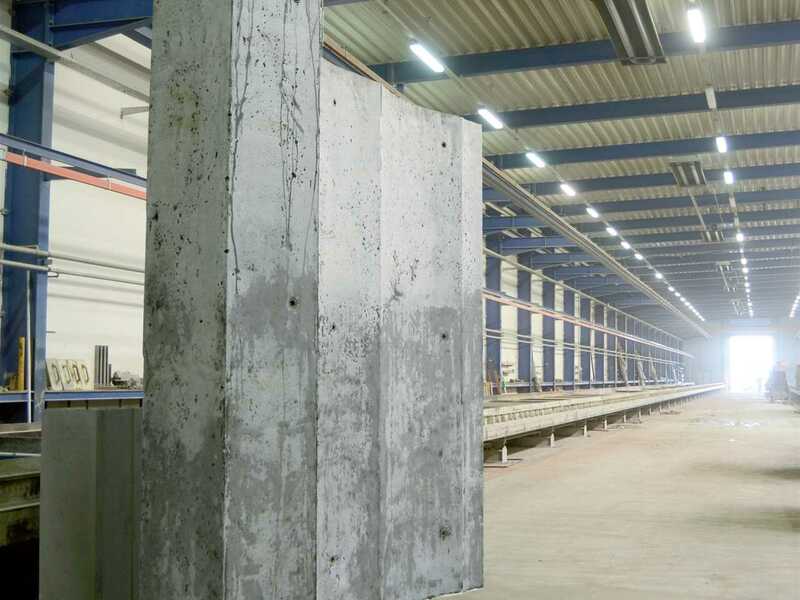 With one formwork the entire project can be constructed, not only saving time but also enabling the new technique to be replicated on other projects. 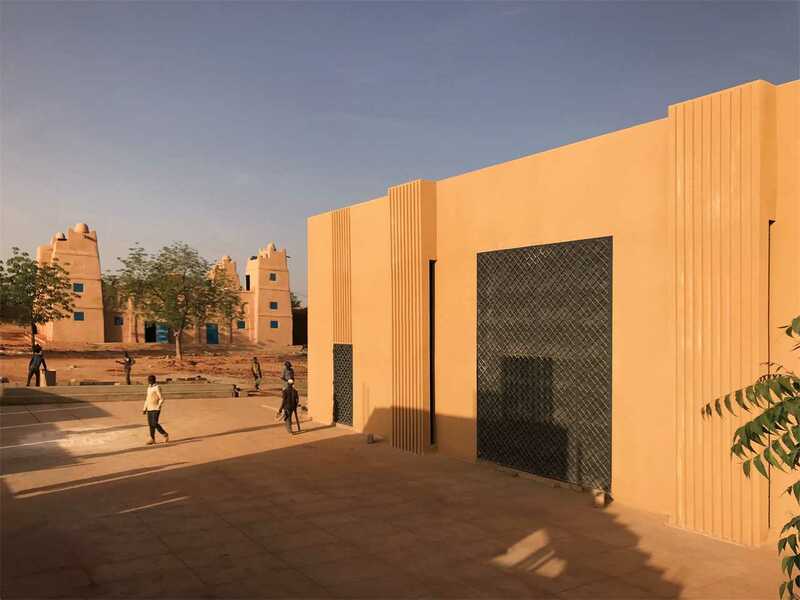 Project update 2012 - Secondary school with passive ventilation system, Gando, Burkina Faso: The wall elements contain of earth blend, sand, gravel and cement. Project update 2012 - Secondary school with passive ventilation system, Gando, Burkina Faso: The ring beams and the carrier beams are reinforced and hold the roof construction and the vaults. 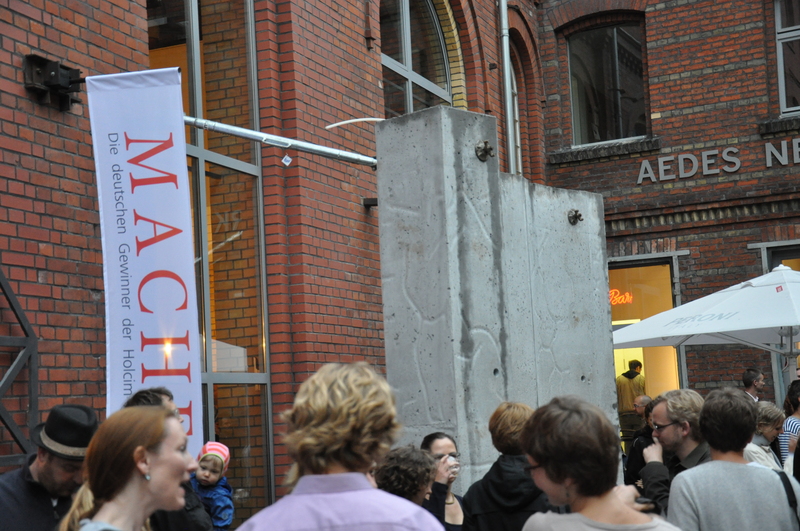 Wall elements made of cast earth. 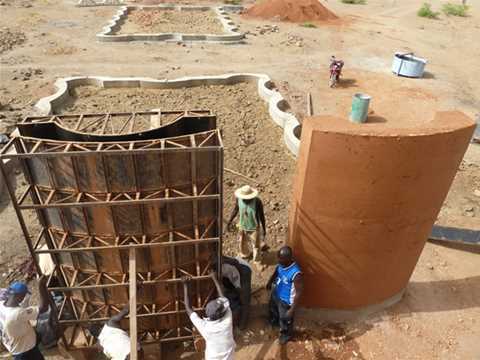 Project update 2012 - Secondary school with passive ventilation system, Gando, Burkina Faso: The formwork is filled with cement-stabilized reinforced cast earth and stripped of the formwork the following day. 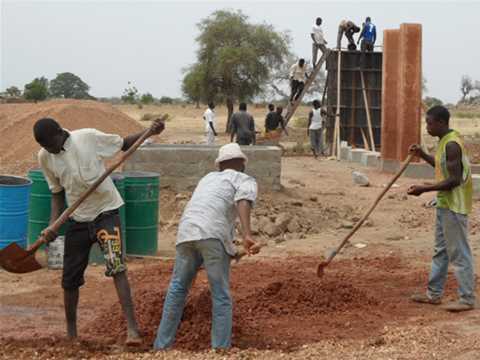 Construction of the next phase of the comprehensive project to complete the secondary school is progressing to schedule in mid-2012. This school project in one of the world’s poorest countries aims to provide further education to the inhabitants of a rural area. 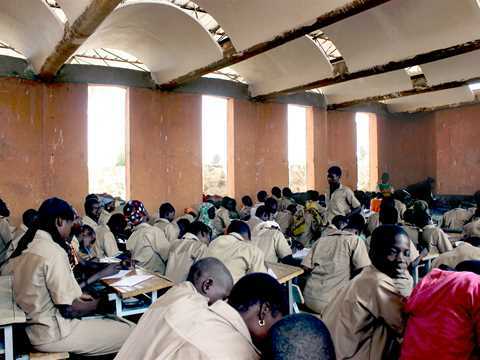 Gando, with a population of 3000, has no secondary education facilities and lies on the southern plains of Burkina Faso, some 200km from the capital Ouagadougou. Most of the construction materials used to construct the school are sourced available: granite stones for the base, clay and fast-growing eucalyptus wood, mainly used as firewood. The wall elements are constructed using a curved mold that enables the elements to be self-supported, and are cast in-situ with a blend of earth, sand, gravel that is stabilized with cement. The project motivates the community by enhancing the skills of laborers where traditional techniques are combined with new know-how. 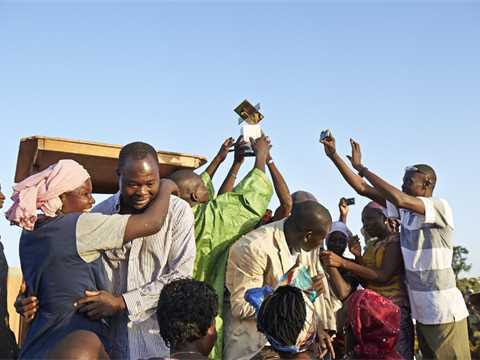 A school project in Burkina Faso that integrates social and environmental performance won the top prize of USD 200,000. 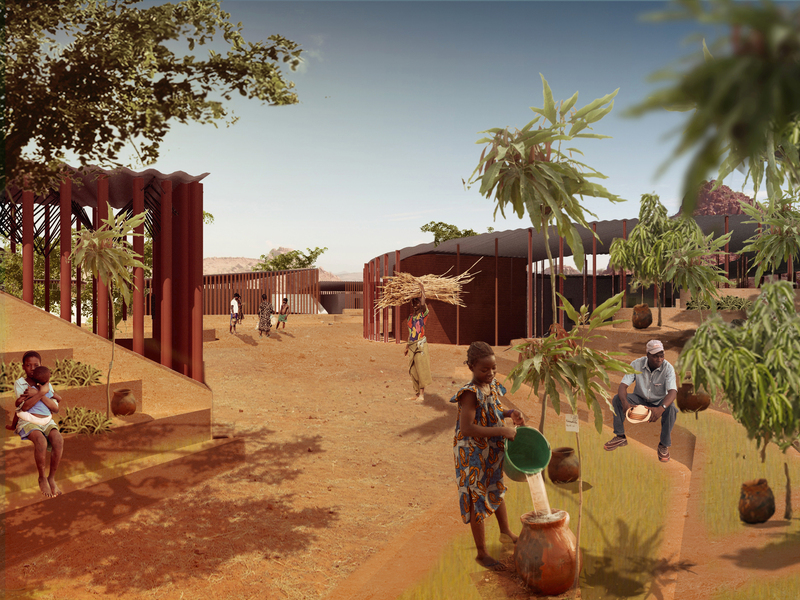 The design for the school in the village of Gando was created by Diébédo Francis Kéré of Kéré Architecture in Berlin. Passive cooling during oppressive summer heat creates an indoor climate conducive to learning by routing air through subterranean tubes, planting vegetation, stack-effect air currents, and using double-skin roofs and façades. The project also improves social conditions by providing jobs and training, and restores the environment through reforestation. 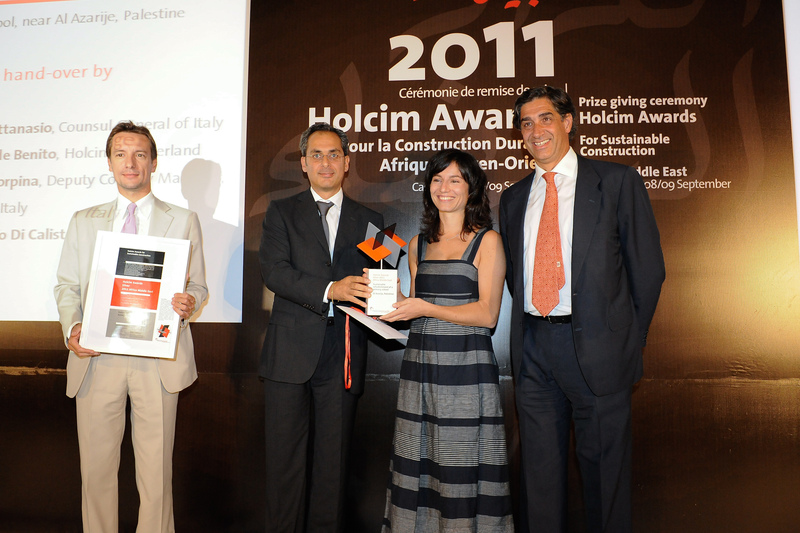 Holcim Awards Silver 2011 Africa Middle East presentation in Casablanca, Morocco (l-r): Luca Atanasio, Consul General of Italy in Morocco; Piero Corpina, Deputy Country Manager, Holcim Italy; winner Giovanna Claudia Rosa Romano, ARCò - Architettura e Cooperazione; and Javier de Benito, Area Manager Holcim for Mediterranean & North Africa. Winners of the Holcim Awards Gold, Silver and Bronze 2011 Africa Middle East (l-r): Salima Naji (Bronze), Diébédo Francis Kéré and Dominique Mayer (Gold), Giovanna Romano (Silver), Martin Rauch and Elmar Nägele (Bronze). 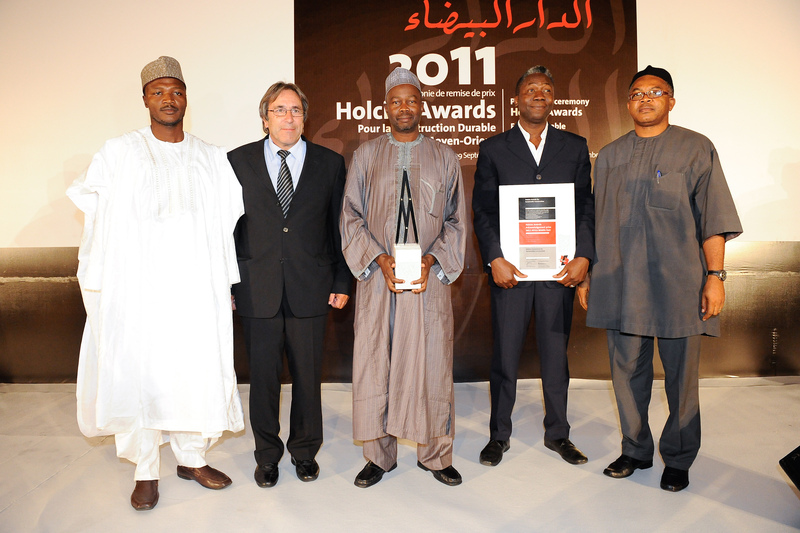 Holcim Awards Acknowledgement prize 2011 Africa Middle East winners "Affordable building materials from recycled agricultural waste, Zaria, Nigeria" (l-r): Sani Mustapha, Dept of Architecture, Ahmadu Bello Univ (ABU), Nigeria; Heinz Müller, Vice Rector, Bern Univ of Applied Sciences (BUAS); Mas'ud Abdulkarim, Dept of Architecture, ABU; Charles Oluwole Job, BUAS, Switzerland; Okey Nduka, Univ of Nigeria, Nigeria. Representatives of the Holcim Awards Acknowledgement prize 2011 Africa Middle East winner ‘Building implementing holistic architectural design, Masdar City, United Arab Emirates’ (l-r): Bob Gysin, Rudolf Trachsel and Sebastian El Khouli, Bob Gysin + Partner BGP Architekten, Switzerland and David Telford, Kaisersrot, United Kingdom. 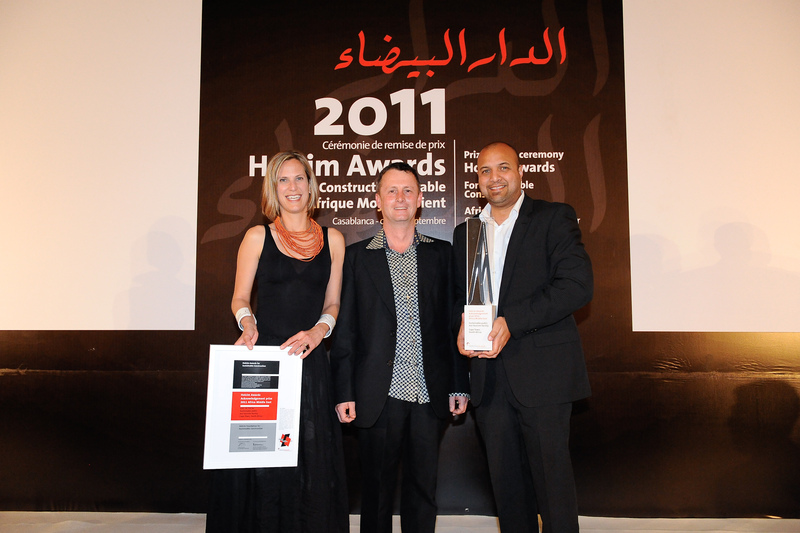 Representatives of the Holcim Awards Acknowledgement prize 2011 Africa Middle East winner ‘Sustainable public eco-tourism facility, Cape Town, South Africa’ (l-r): Jessica Tami Cohen, Andrew Justin Cooke and Sheeraj Ismail, Architecture co-op, South Africa. 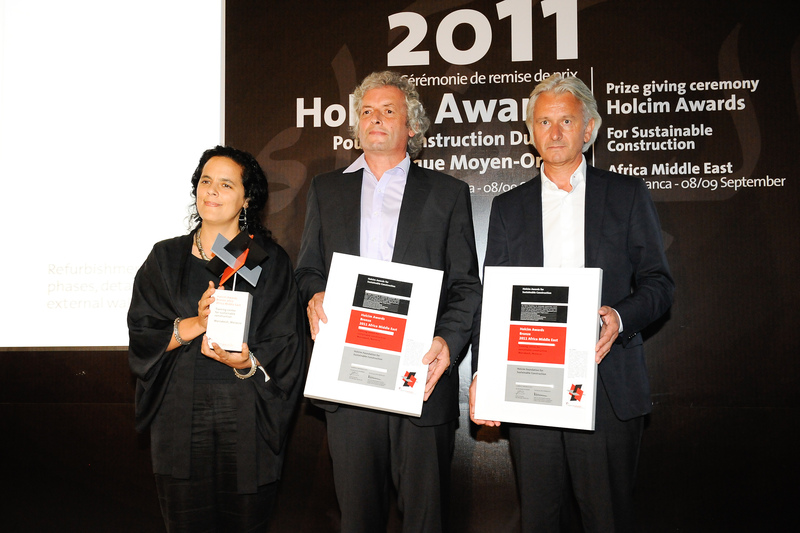 Representatives of the Holcim Awards Acknowledgement prize 2011 Africa Middle East winner ‘Urban precinct reconstruction and rehabilitation, Fez, Morocco’ (l-r): Michel Mossessian and José Marquez, Mossessian & Partners, United Kingdom. 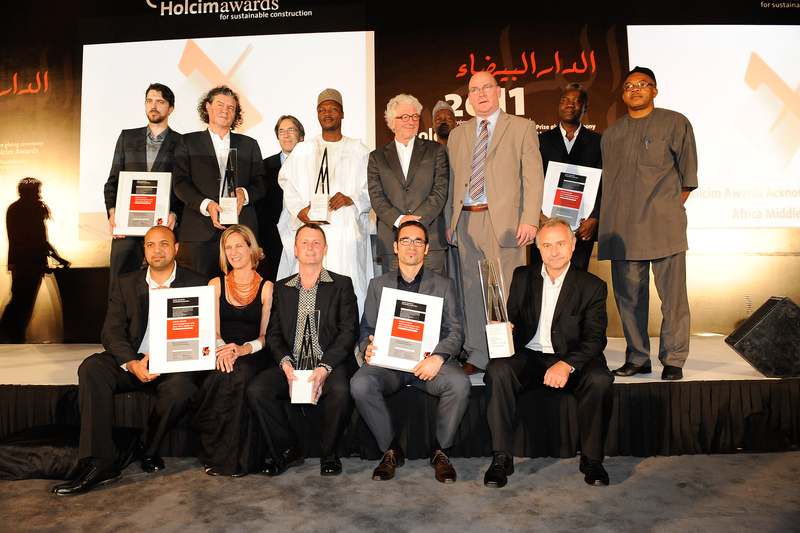 Representatives of the four winning teams of Holcim Awards 2011 Acknowledgement prizes Africa Middle East. 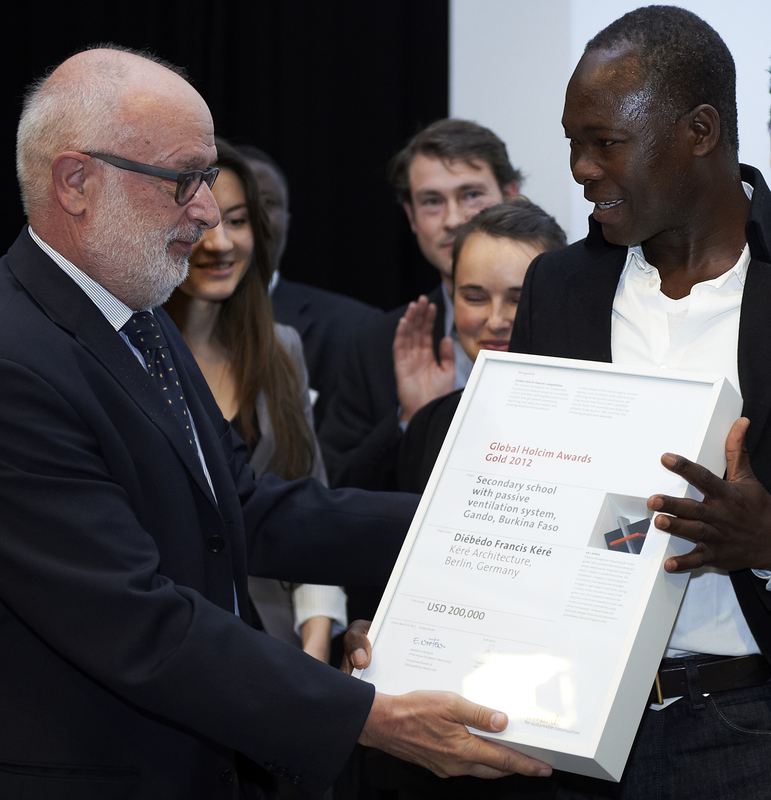 Presenting the ‘Next Generation’ 1st prize to ‘Adaptive re-use of industrial site for urban agriculture, Pretoria, South Africa’, Stephan Olivier (left), CEO Afrisam, South Africa. 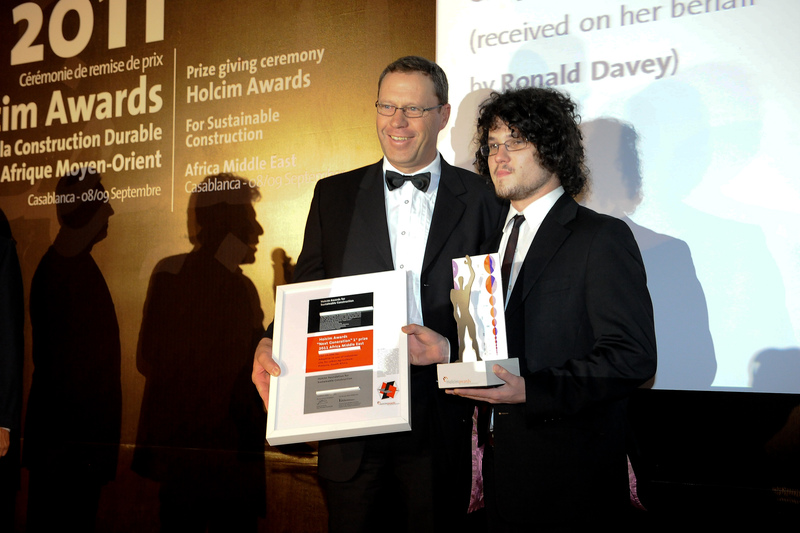 The prize is accepted by Ronald Davey on behalf of Calayde Aenis Davey, University of Pretoria, South Africa. 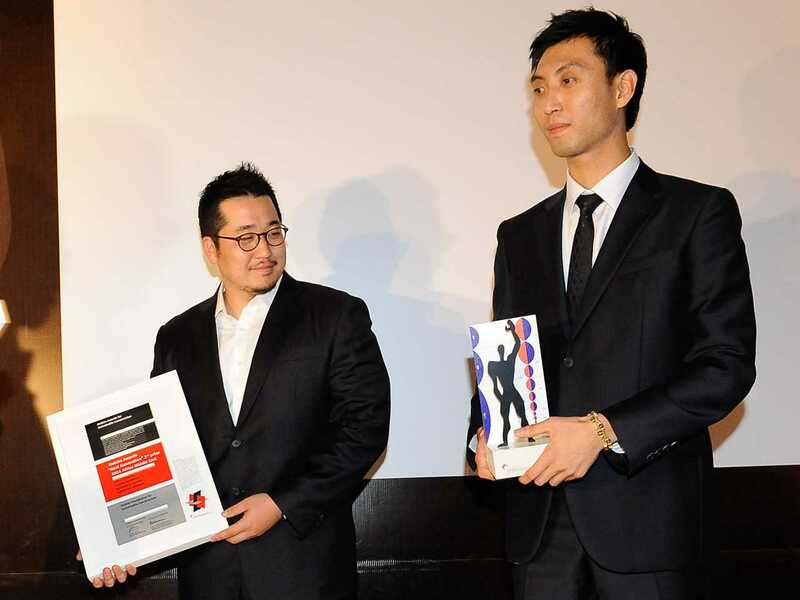 Winners of the ‘Next Generation’ 2nd prize 2011 Africa Middle East for ‘Passive floodplain agricultural system, Gohatsion, Ethiopia’ (l-r): Gunho Kim and Wonjoon Han, University of Seoul, South Korea. 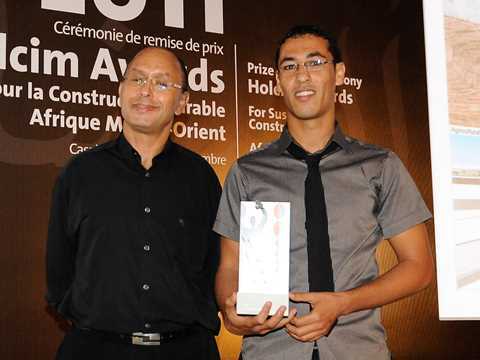 Receiving the ‘Next Generation’ 3rd prize 2011 Africa Middle East for ‘Culturally-sensitive urban master plan, Agadir, Morocco’ (l-r): project supervisor Abd Essalam Basset and project author Khalid El Jaouhari, ENA Rabat National School of Architecture, Morocco. 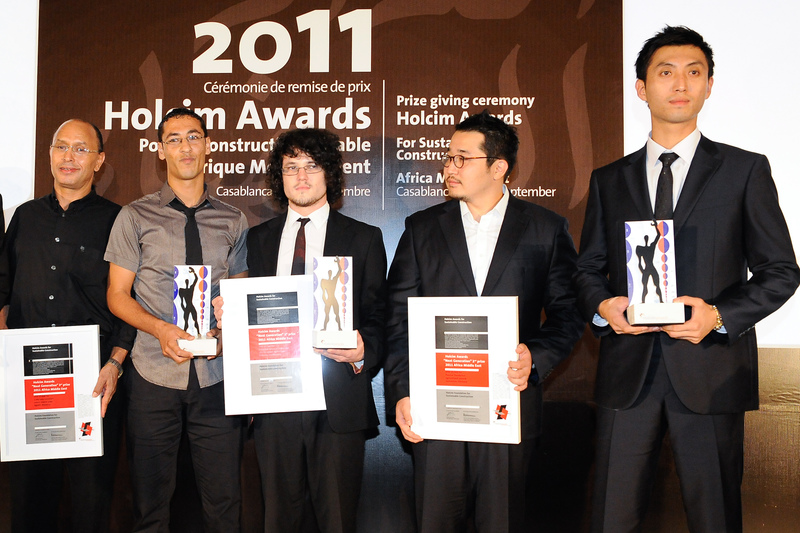 Winners of the three winning teams of the Holcim Awards 2011 ‘Next Generation” prizes Africa Middle East. 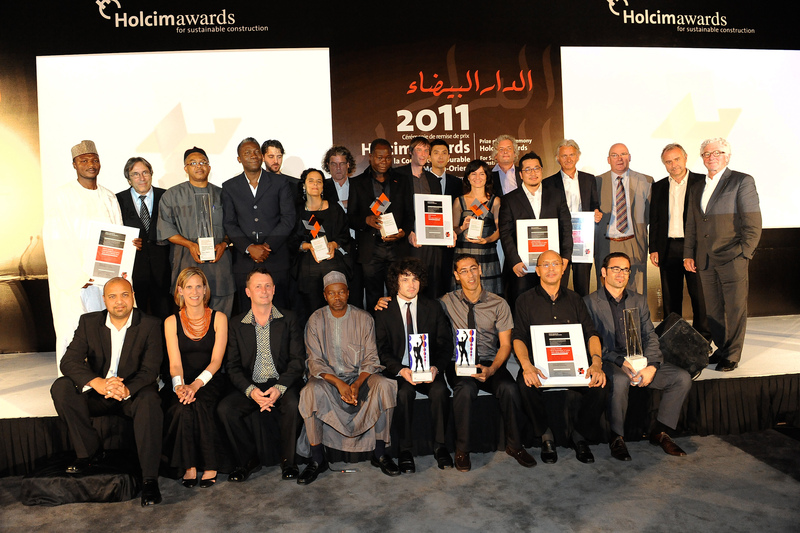 Prize winners in the Holcim Awards 2011 Africa Middle East at the prize ceremony in Casablanca where a total of USD 300,000 was presented to ten outstanding projects that illustrate the broad scope of applying sustainable approaches in construction including school infrastructure, community renewal, urban redevelopment, and energy-efficient design. 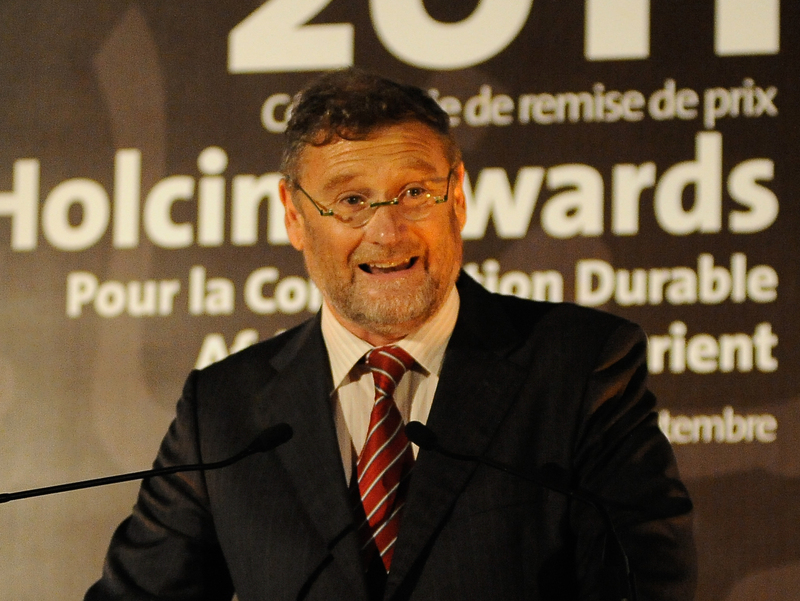 Dominique Drouet, CEO, Holcim Morocco – welcome on behalf of the Holcim Foundation and its sponsor. Javier de Benito, Area Manager for the Mediterranean and the Middle East, Holcim Ltd, Switzerland – Chair of the Day at the A11AM-media-DeBenito-001x.jpg Javier de Benito, Area Manager Holcim for Mediterranean and North Africa, and member of the Holcim Awards 2011 Africa Middle East jury. 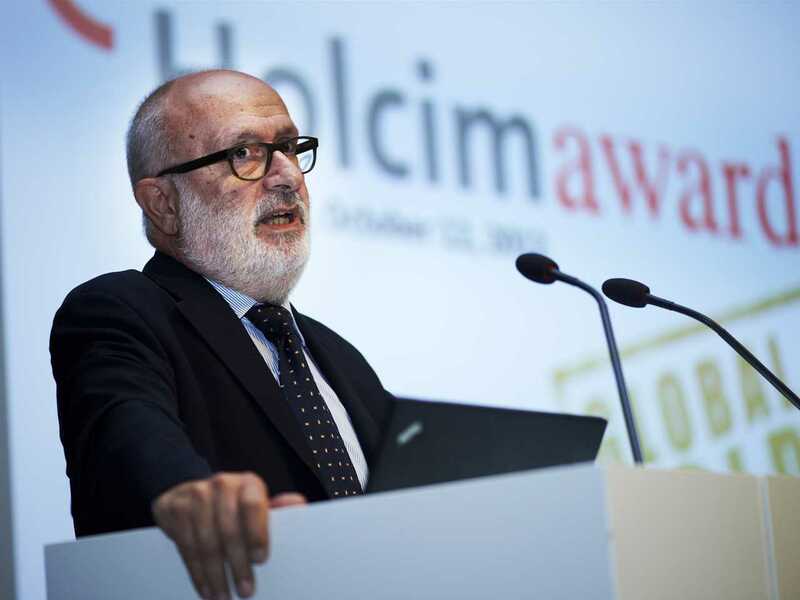 » Download high-resolution version (JPG, 1.63 MB) A12GLgoBFhoCH04.jpg Presentation of the Global Holcim Awards Gold 2012 in Lausanne, Swizterland (l-r): Bernard Fontana, CEO, Holcim; Enrique Norten, Principal/Founder, TEN Arquitectos & Head, Global Holcim Awards jury; Rolf Soiron, Chairman, Holcim; Javier de Benito, Area Manager Africa Middle East, Holcim; Dessi Slava, Kéré Architecture; Dieudonné Souguouri, 1st Counselor, Embassy of Burkina Faso in Switzerland; and team from Kéré Architecture including Diébédo Francis Kéré (with certificate). » Download high-resolution version (JPG, 2.35 MB) A11_EU_misc_SpPre3.jpg Javier de Benito, Area Manager for the Mediterranean and the Middle East, Holcim Ltd, Switzerland – Chair of the Day at the Holcim Awards 2011 Africa Middle East presentation in Casablanca, Morocco. 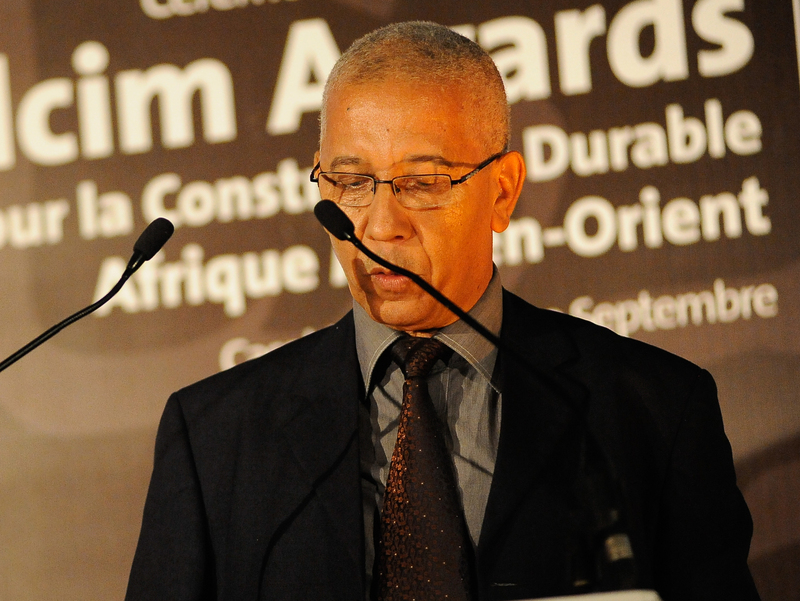 Mohammed El Hakkaoui, Directer au Ministère de l'energie et de l'environnement, Morocco – welcome on behalf of the Kingdom of Morocco. 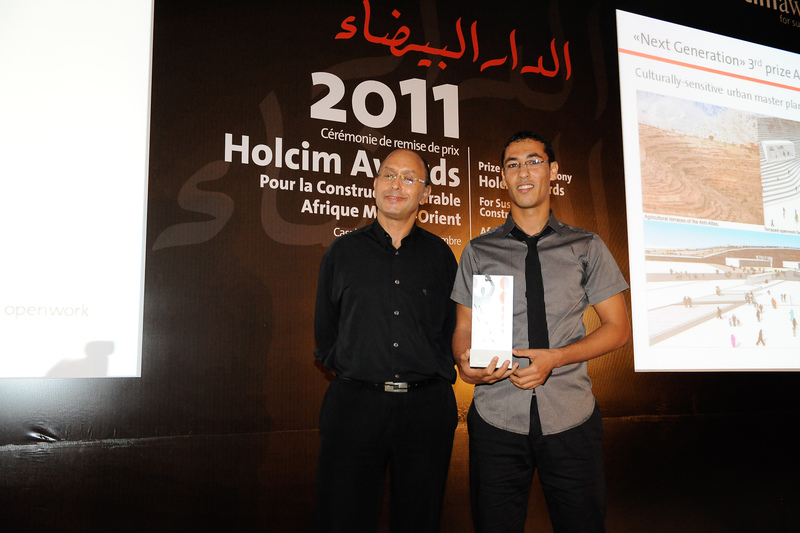 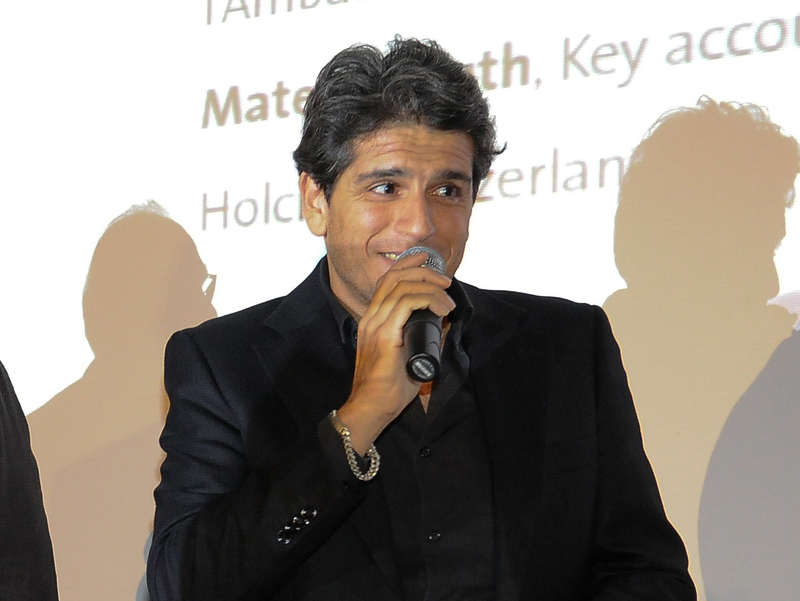 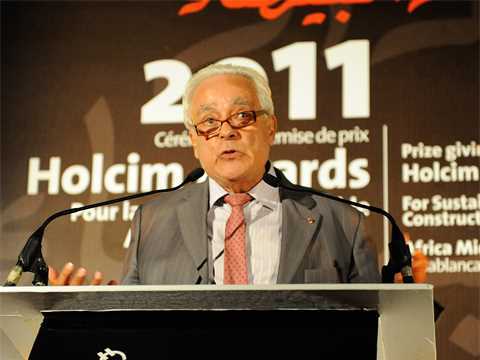 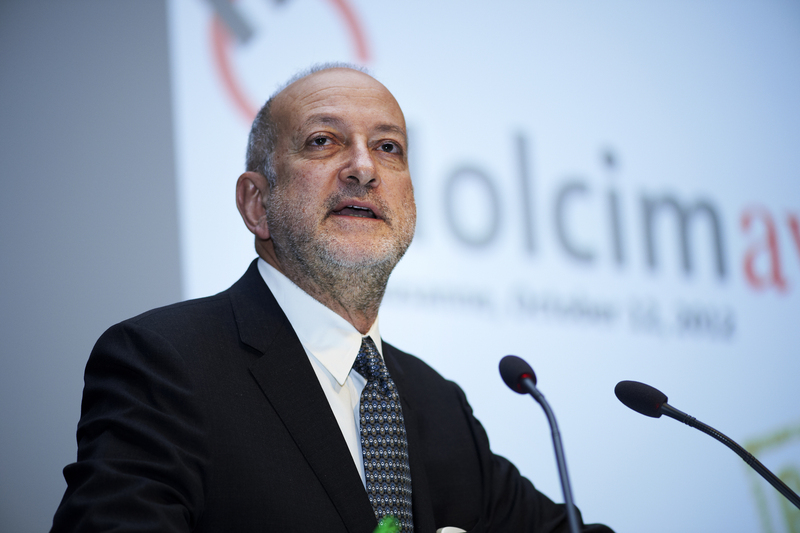 Mohamed Berrada, Counselor, Royal Institute of Education, Morocco – keynote address at the Holcim Awards 2011 Africa Middle East ceremony. 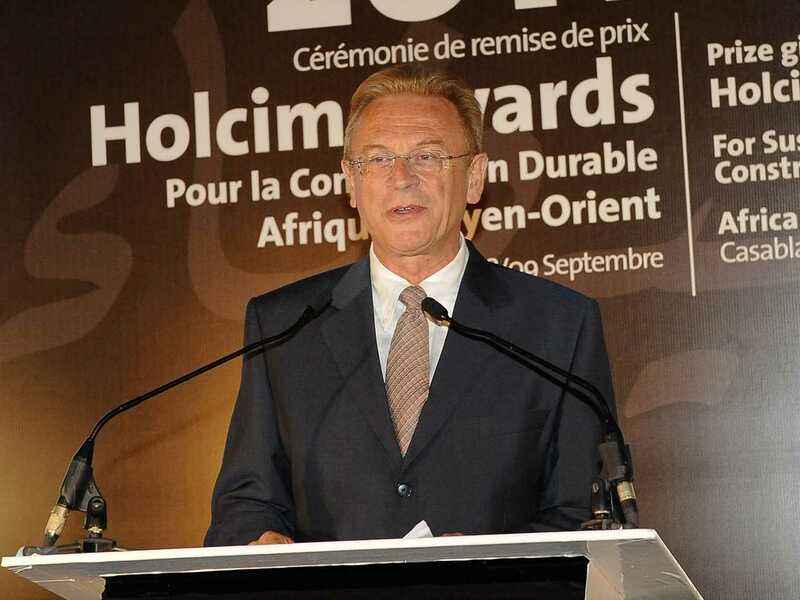 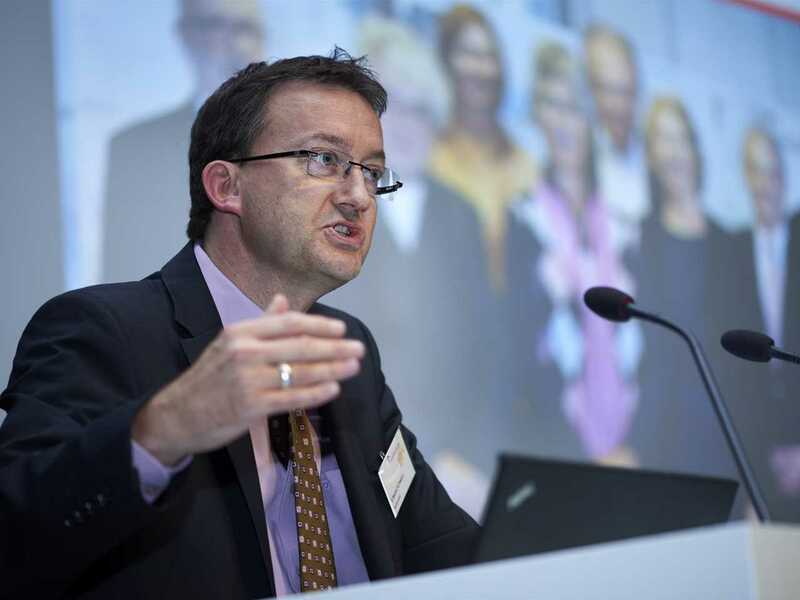 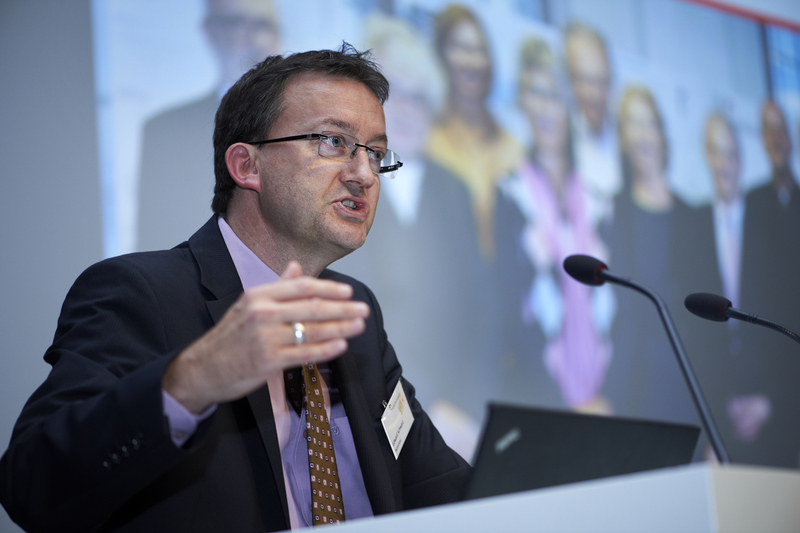 Claude Fussler, special advisor to the United Nations Global Compact, France; vice-chairman of the Stockholm Environment Institute, Sweden; and founding member of the Holcim Foundation – presentation of the Holcim Awards Gold, Silver and Bronze prizes. 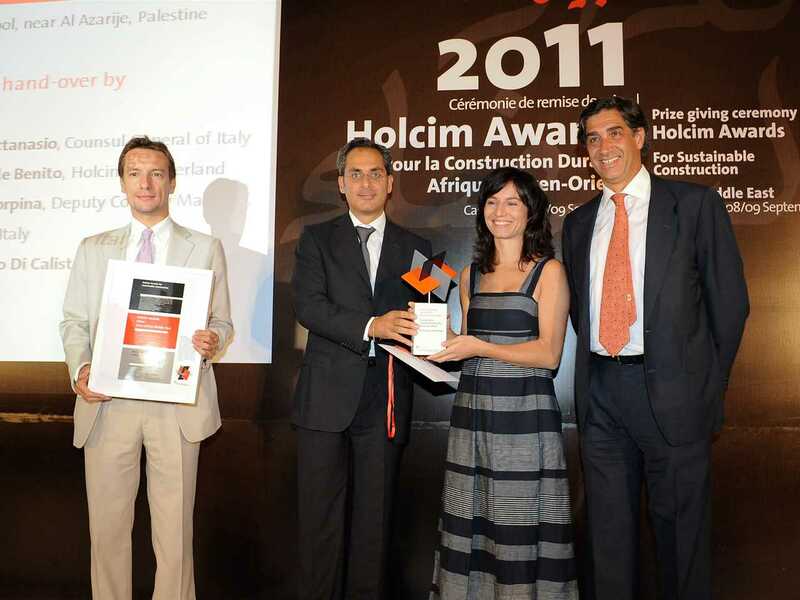 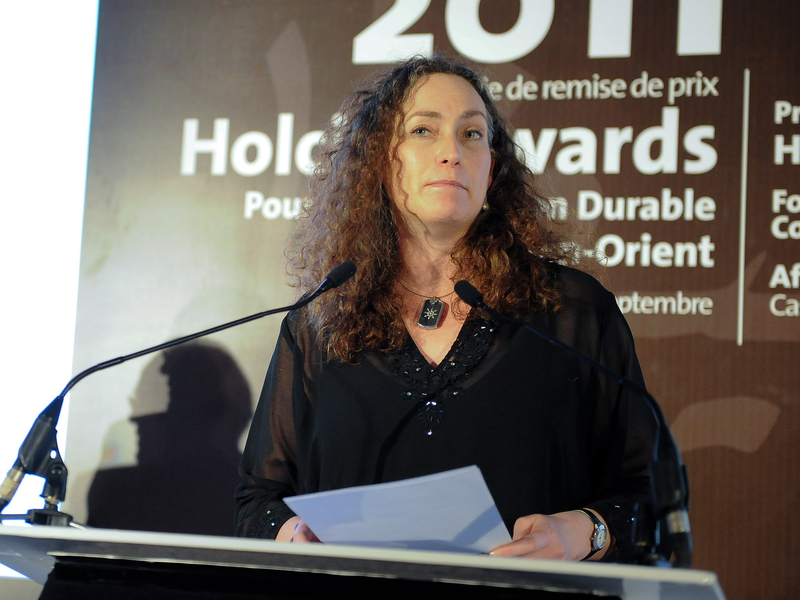 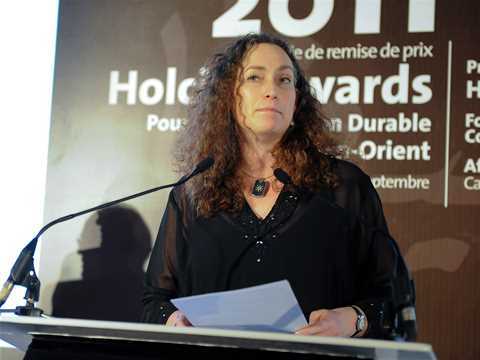 Chrisna du Plessis , Associate Professor, Department of Construction Economics, University of Pretoria, South Africa and member of the Holcim Awards jury for region Africa Middle East in 2011 – presentation of Acknowledgement prizes. 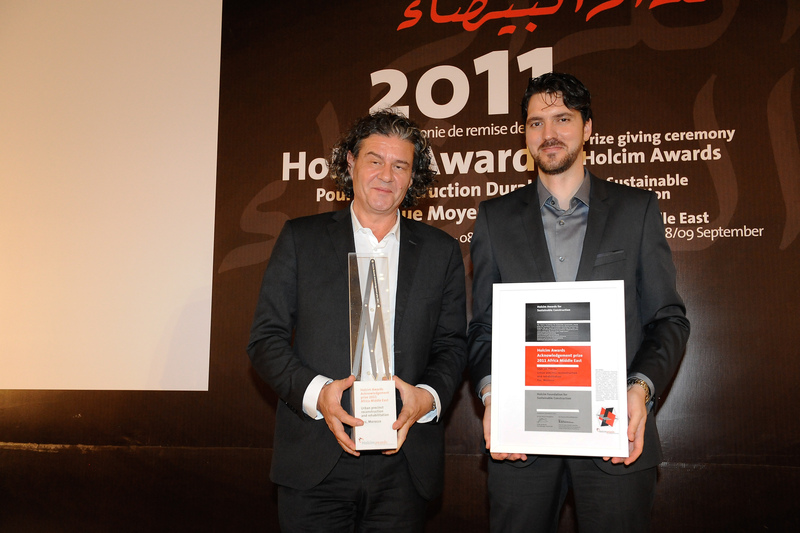 Abderrafih Lahbabi , Directeur Pédagogique, Ecole Supérieure d’Architecture (EAC), Morocco – presentation of Acknowledgement prizes. 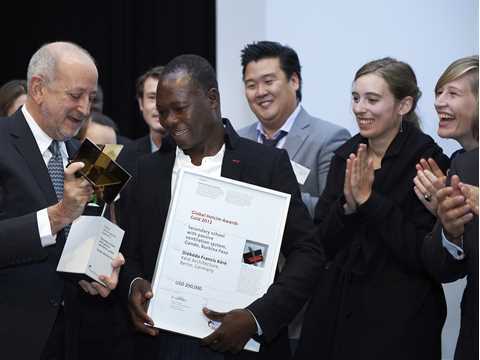 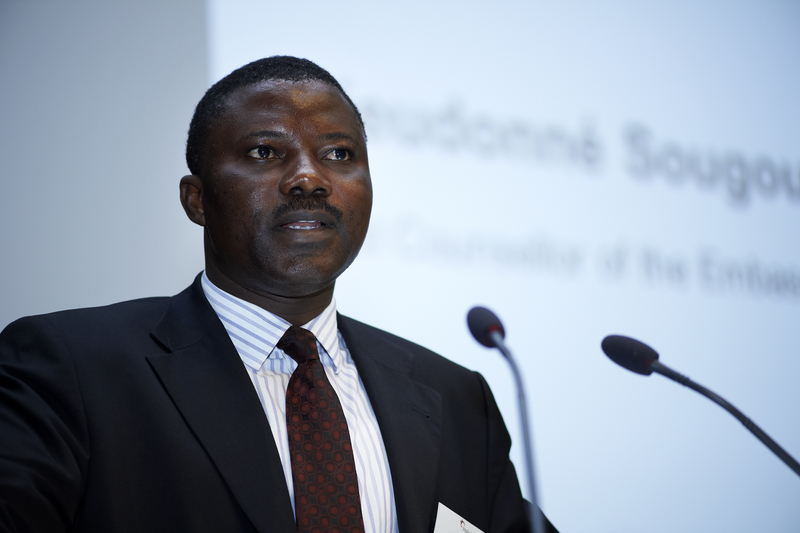 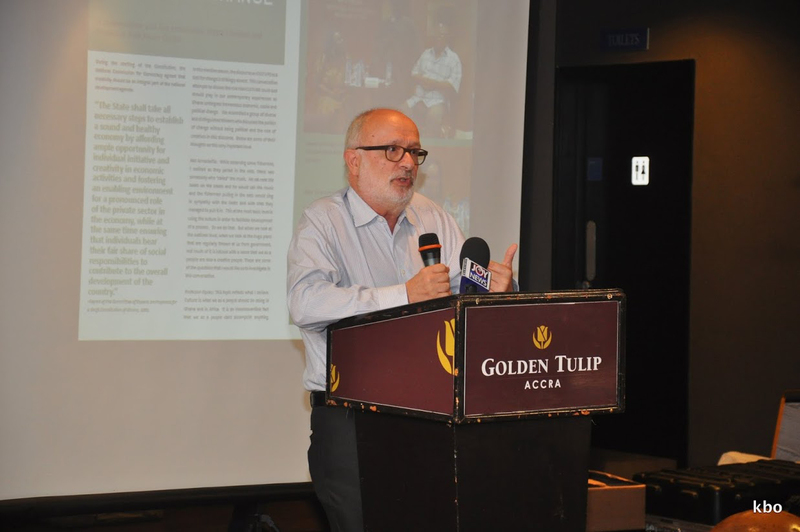 Joe Addo, Principal of Constructs LLC, Ghana/USA and member of the Holcim Awards jury for region Africa Middle East 2011 – presentation of the “Next Generation” prizes. Salima Imani, Head HR and Communciations, Holcim Morocco – closing remarks and farewell. 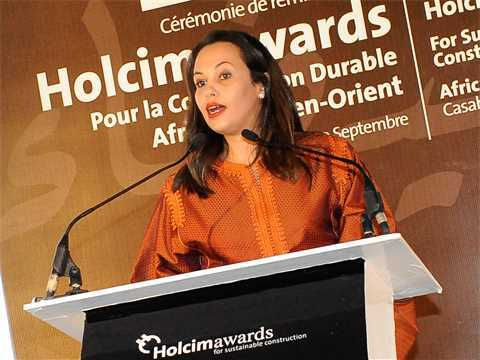 Faïçal Tadlaoui, Master of Ceremonies. Main author Calayde Aenis Davey with the "Next Generation" 1st prize 2011 Africa Middle East for "Adaptive re-use of industrial site for urban agriculture, Pretoria, South Africa." 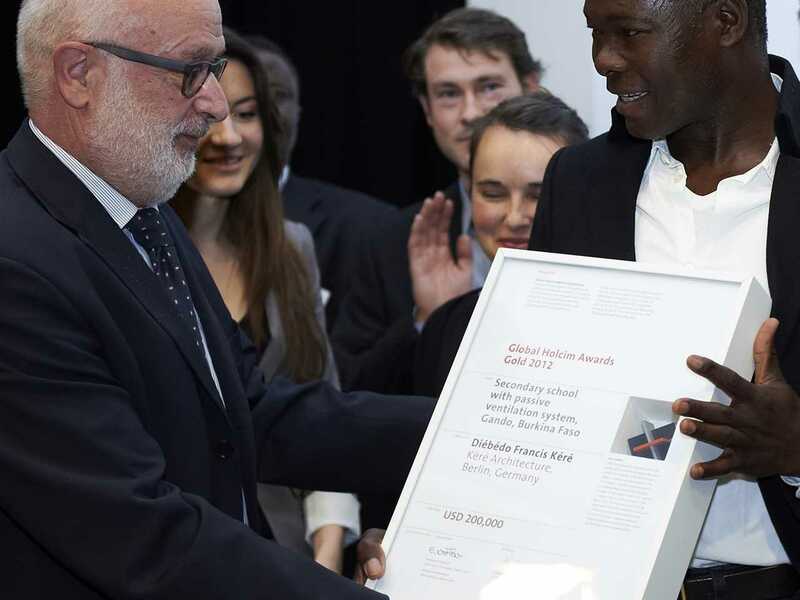 The school project that uses only solar and wind power to cool the classrooms won the top prize of USD 100,000. The design for the secondary school in the village of Gando on the dry tropical savanna was created by Berlin-based architect Diébédo Francis Kéré, of Kéré Achitecture, who was the first person from the village to study internationally, and is also the son of the village headman. 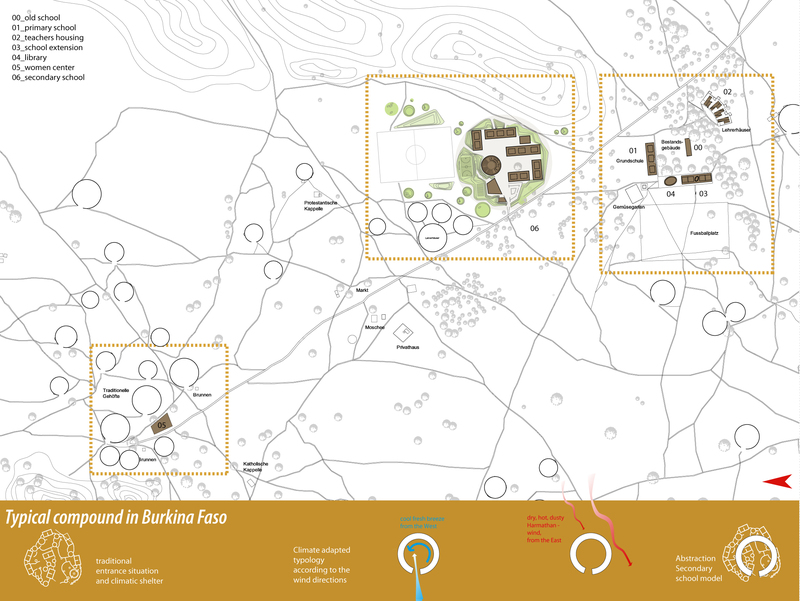 The jury commended this project because of its broad approach towards enmeshing discreet sustainable aspects of the program into a comprehensive whole. 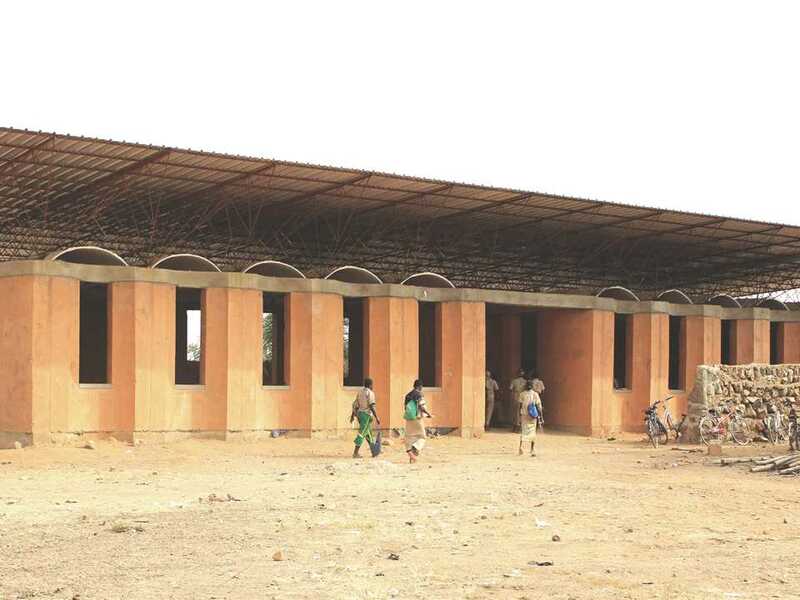 The Secondary School Gando is constructed by the local community and builds not only a series of structures, but also a sense of identity and enhanced social cohesion. 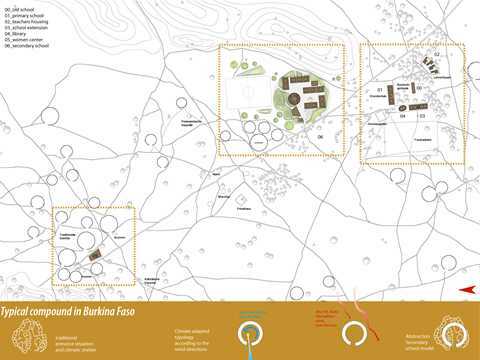 Its “urban design” has the potential to act as an anchor point in the village structure. The project, as one element of a long-term school development, makes use of “high-tech” ideas that are implemented with low-tech means. It intelligently leverages the site’s characteristics and locally-available materials. 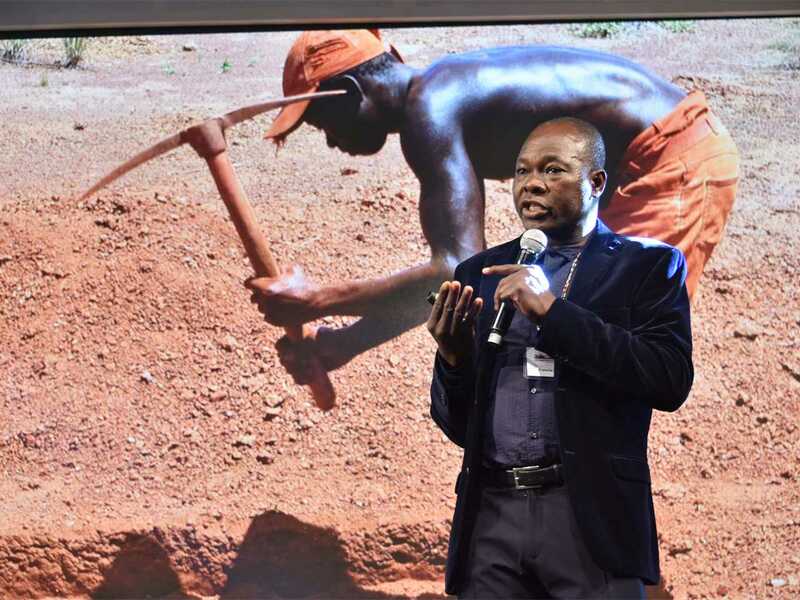 The project itself generates positive impacts upon both the social environment by generating opportunities for education, creating jobs and training; and on the natural environment through reforestation. People learn building skills using clay and other readily available local materials, which strengthens the idea of a mutually-beneficial process since the skills learnt can be applied beyond the confines of the site. 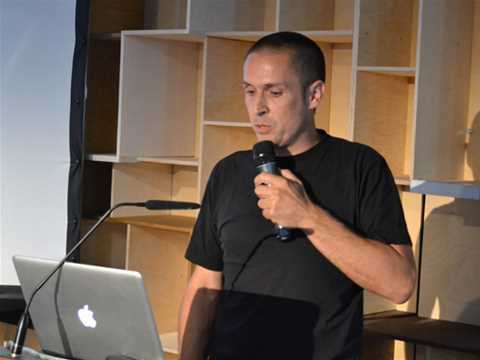 The experiences and techniques partially applied to earlier projects realized independently on the same site were integrated, and prove the potential and applicability of the project’s inherent ideas. The project aims for the sustainable use of resources to provide natural ventilation without any use of electricity. The natural ventilation system works with low-tech, cost-effective earth-tubes, which is a sustainable, zero-energy passive geothermal solar cooling system. 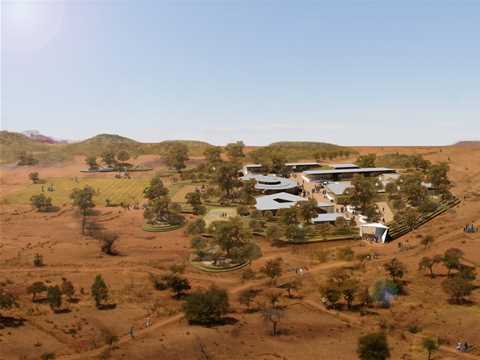 The school will provide graduate students accessibility to further education and therefore enhances the sustainability of the educational opportunities created. 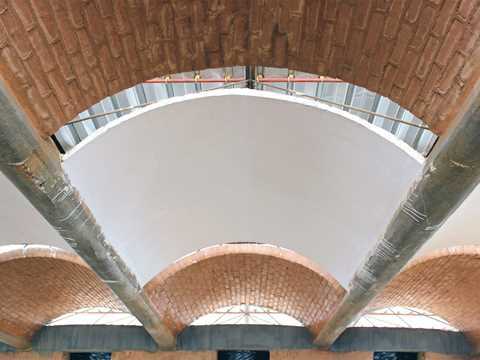 The extremely hot weather makes studying in buildings without air-conditioning very difficult. 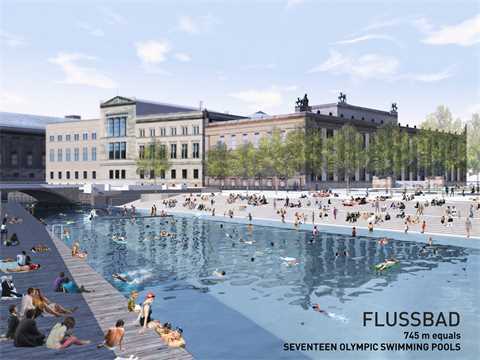 That is why all interior spaces are embedded partially underground in the redesigned landscape to create a shadowed oasis. 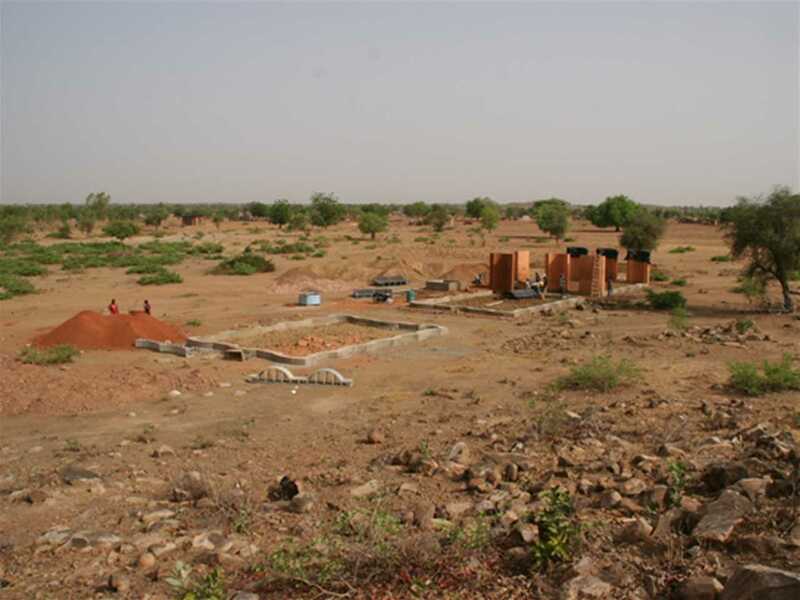 Due to the massive deforestation which has taken part in the past, the region is now facing the expansion of the desert. 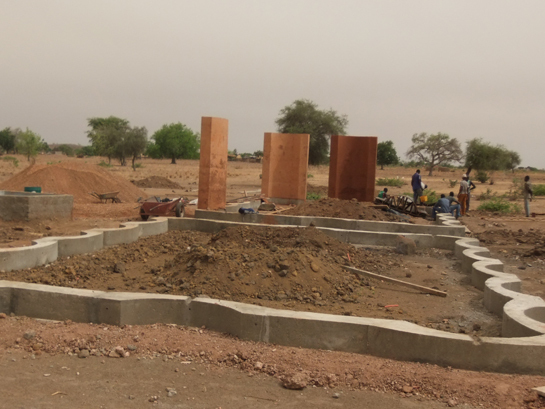 To prevent the dehydration of the ground, collected rainwater irrigates the recently planted trees around the existing school buildings. 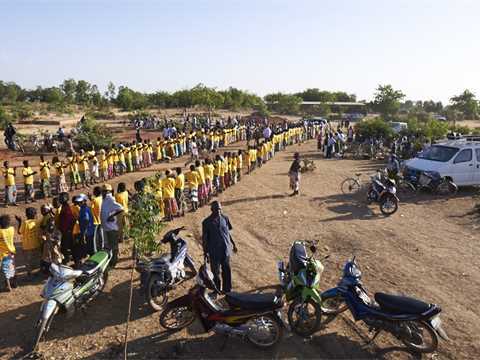 The reforestation is continued in the Secondary School Gando and creates leisure space.